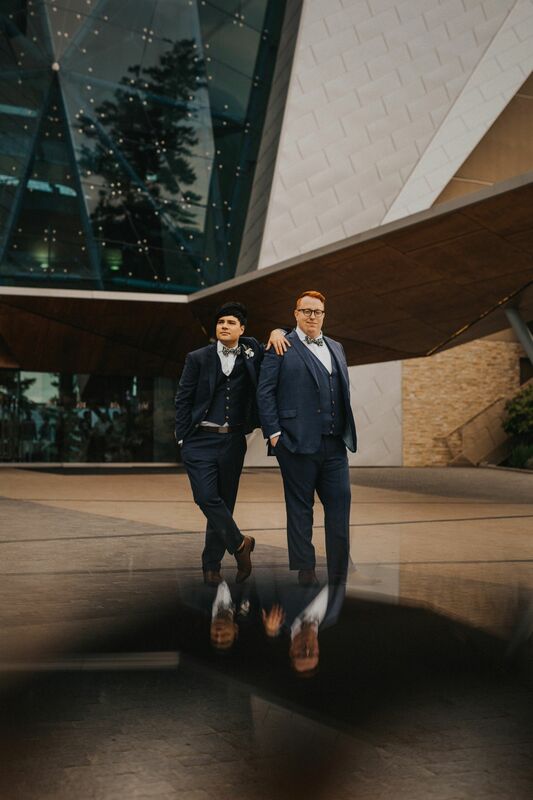 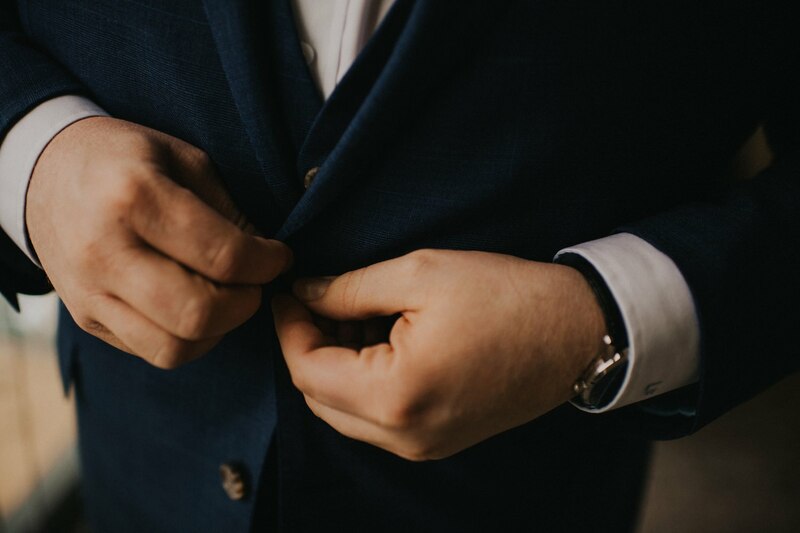 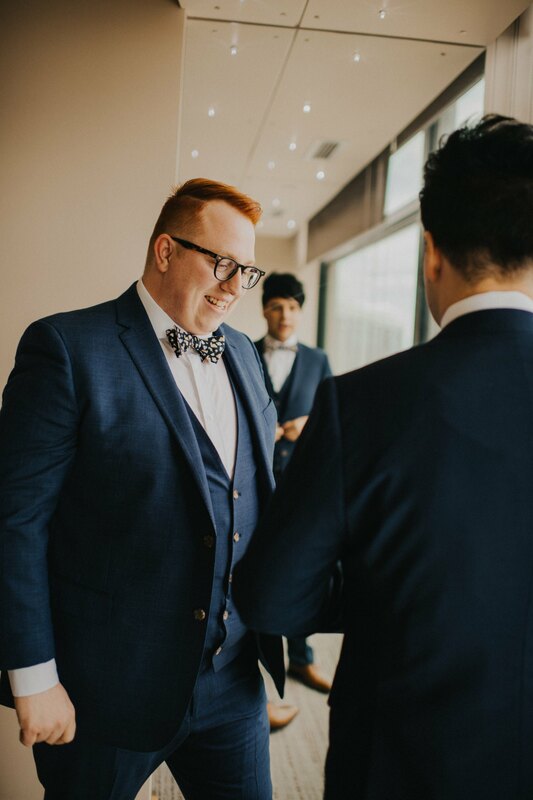 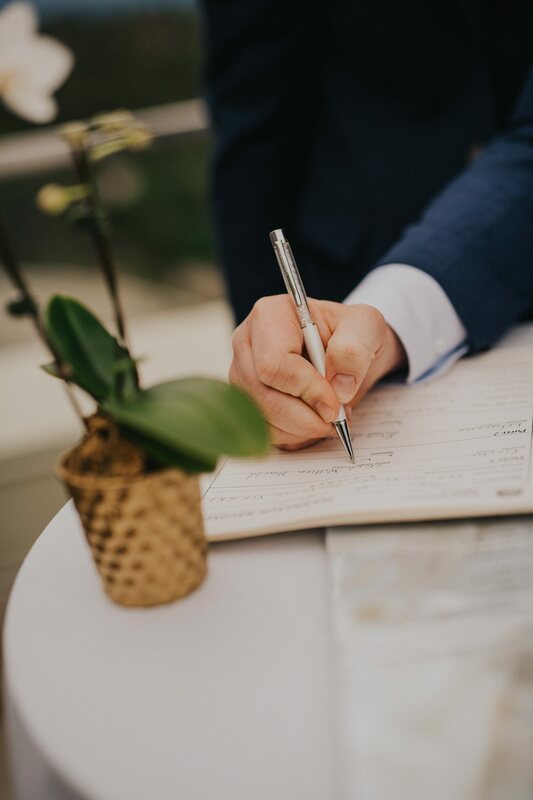 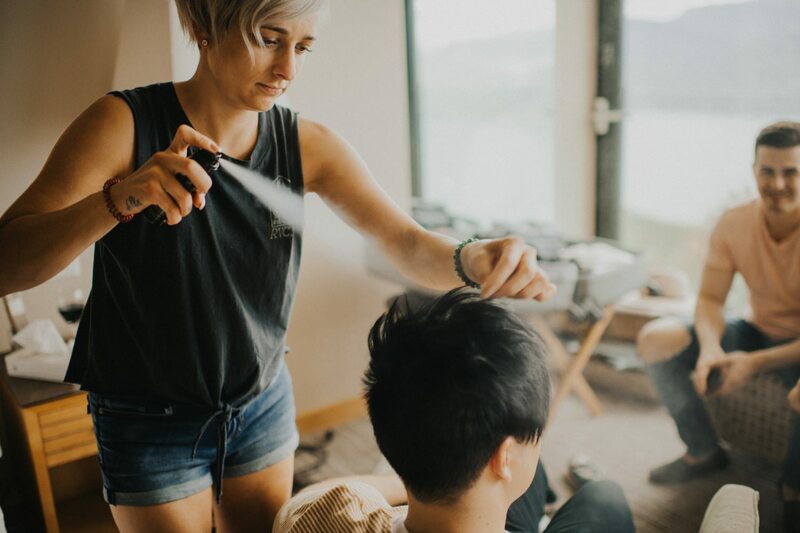 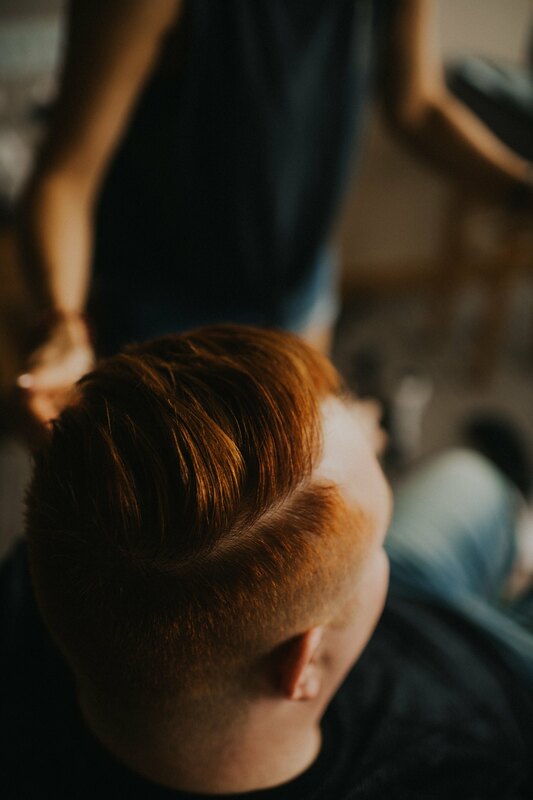 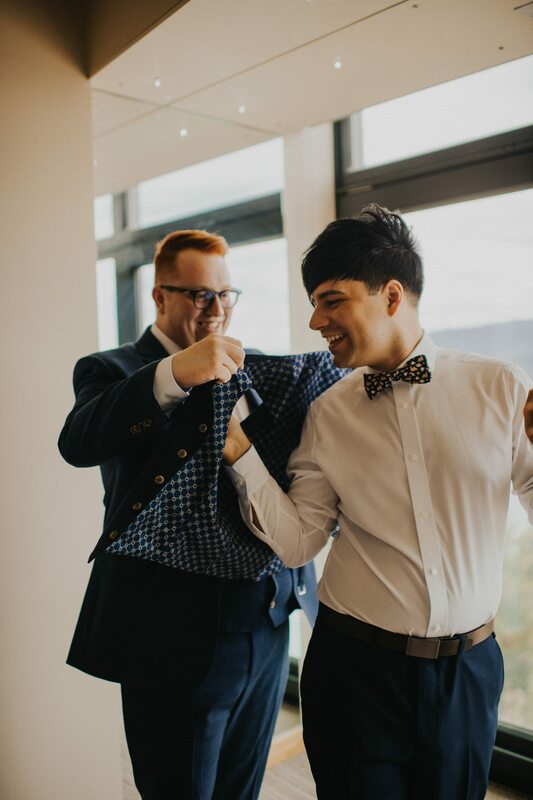 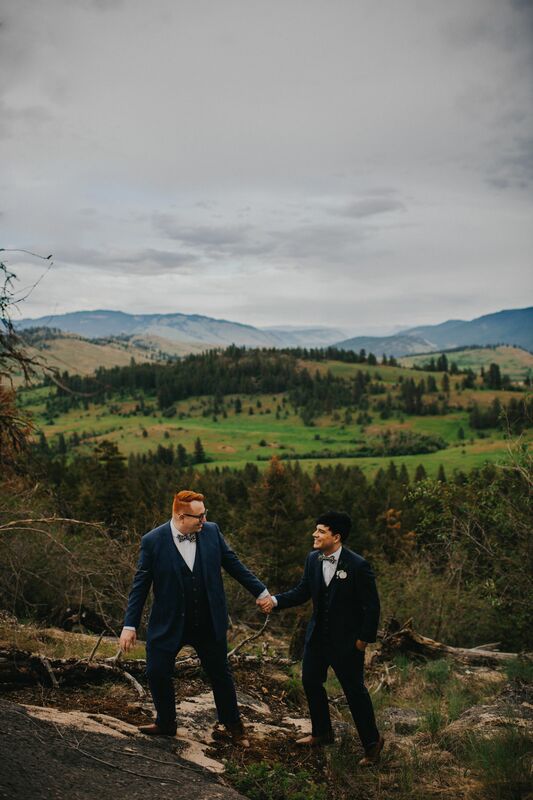 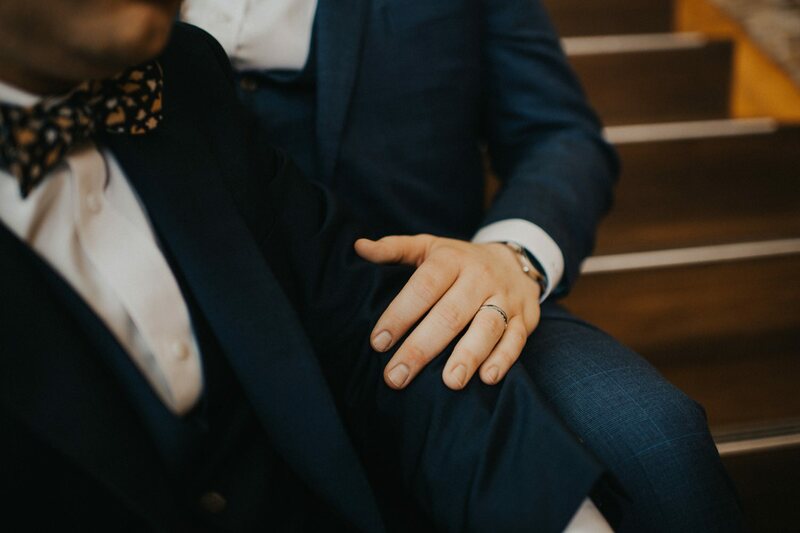 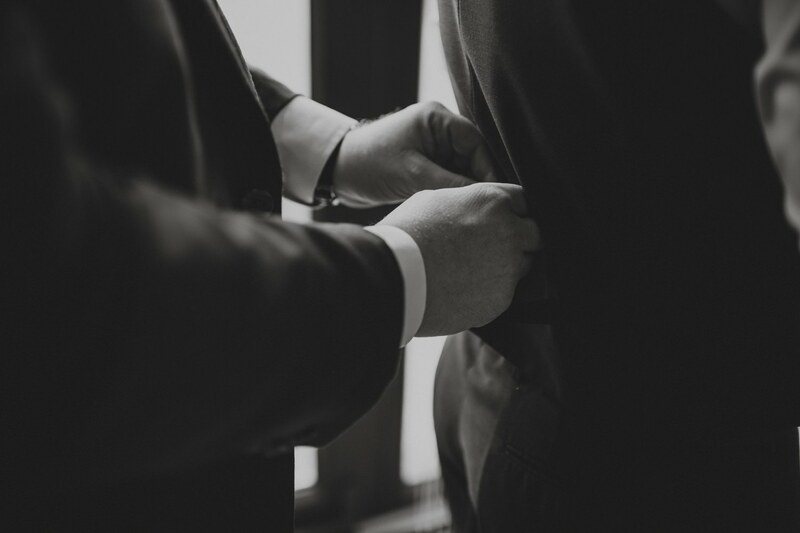 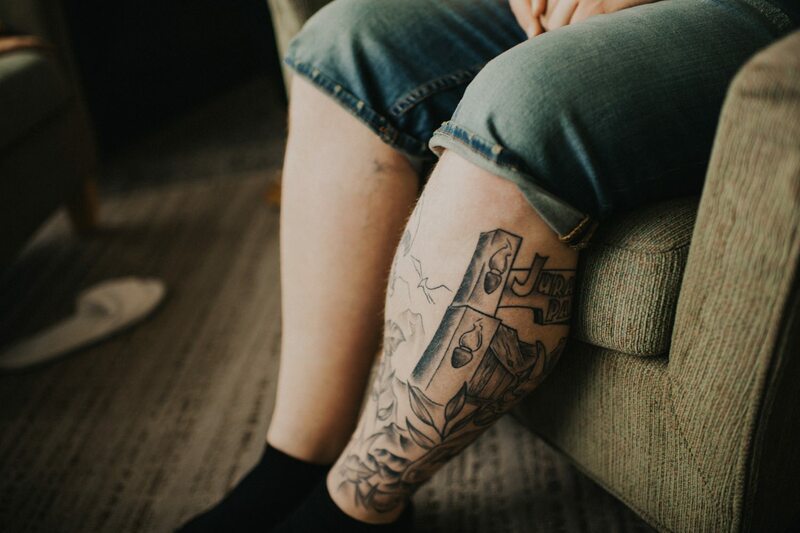 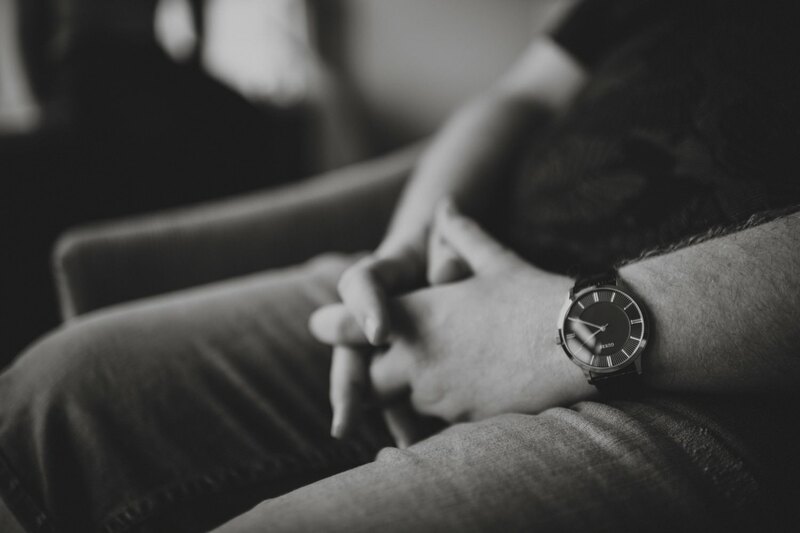 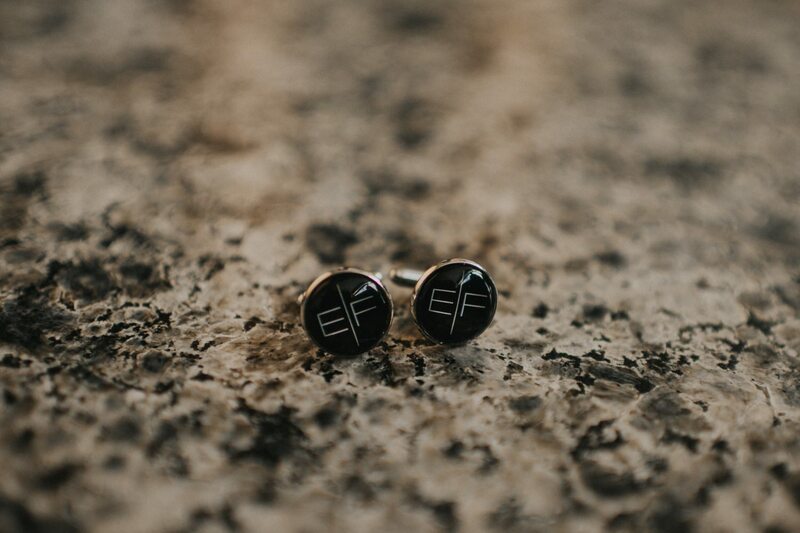 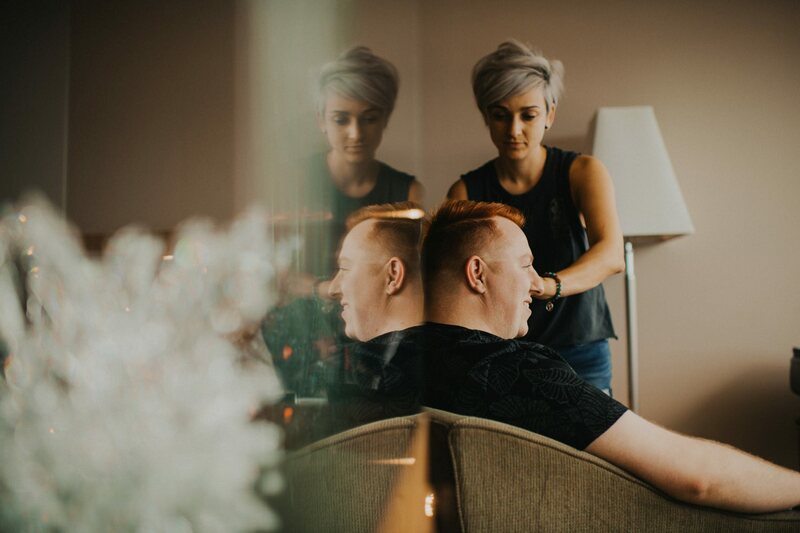 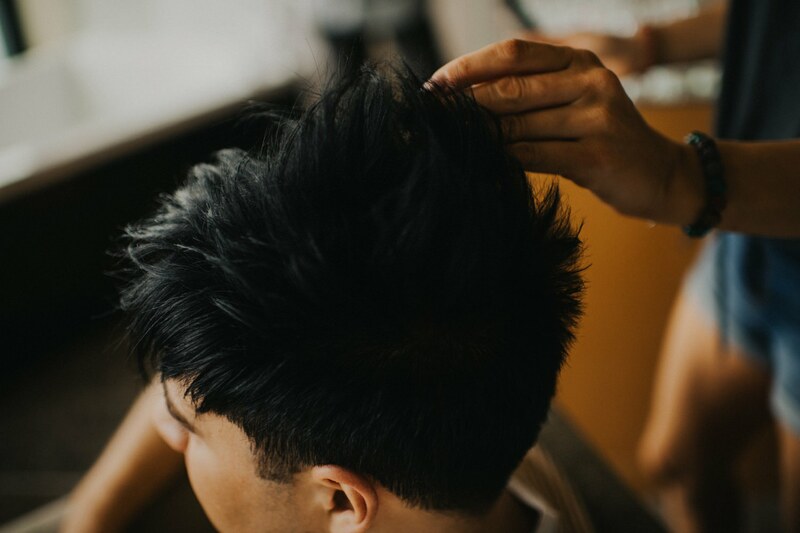 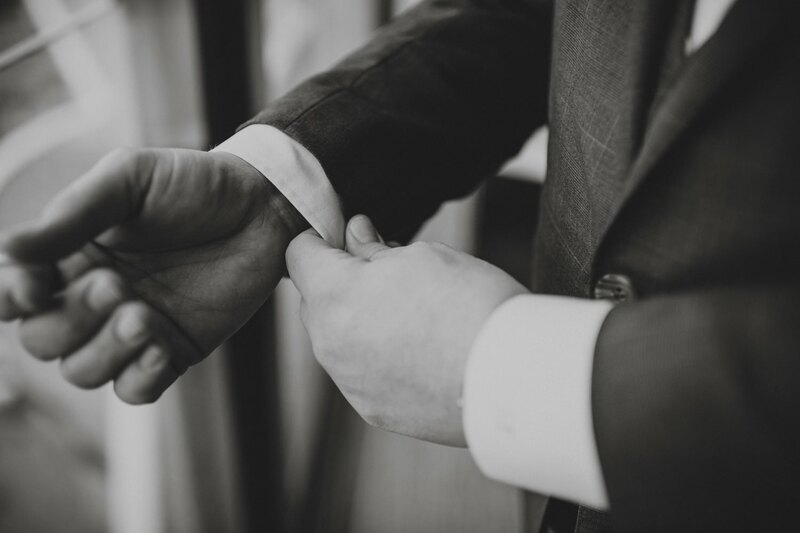 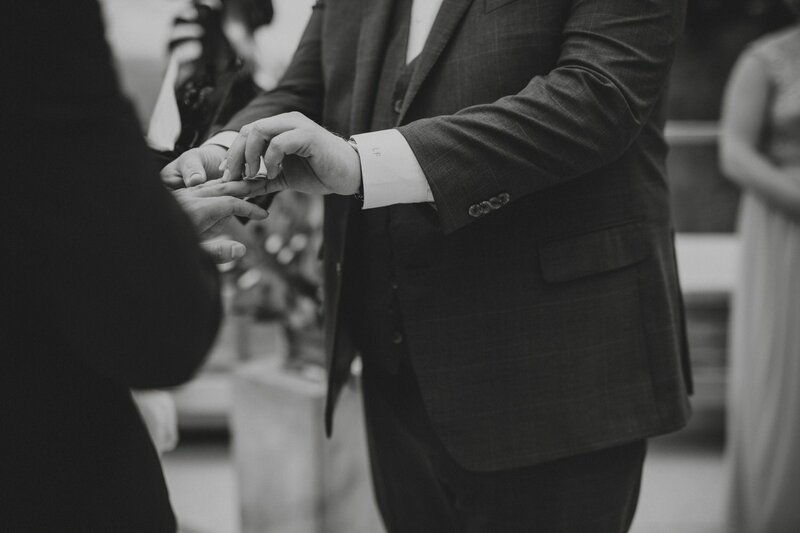 When Lloyd and Eric first contacted me to capture their wedding day, I had already closed my books for the season, but once I spoke more with them on the phone the fit couldn’t have been better! 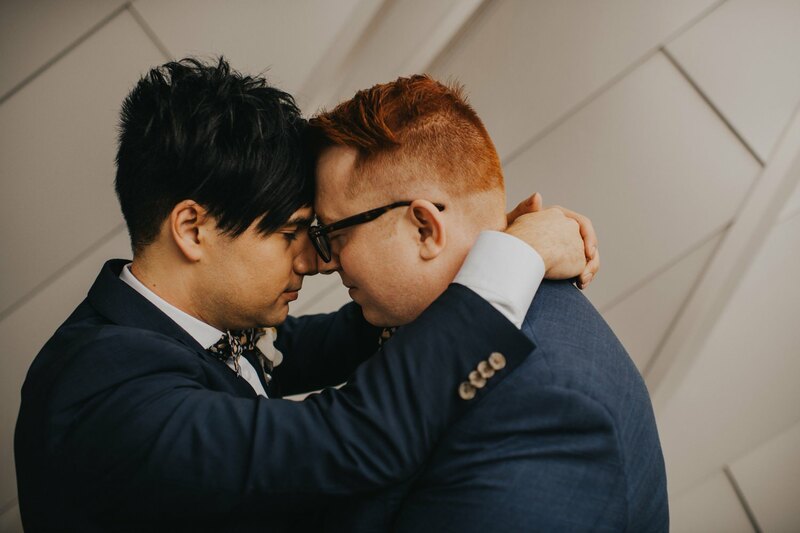 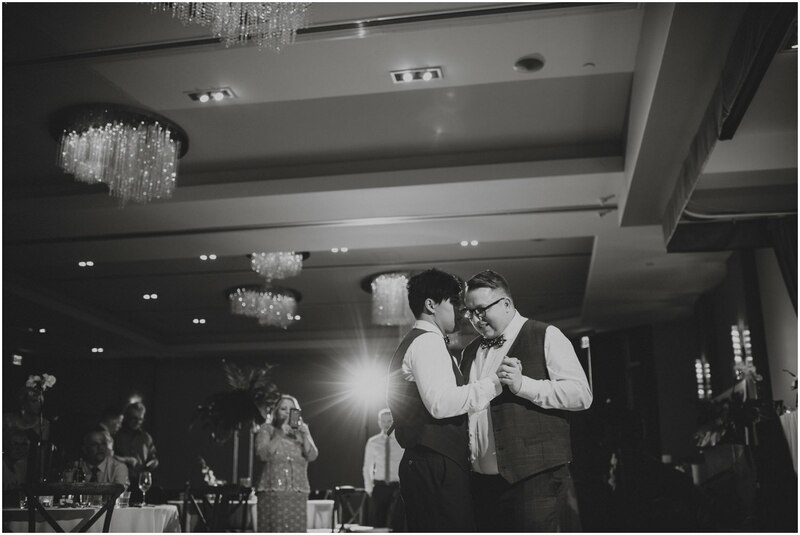 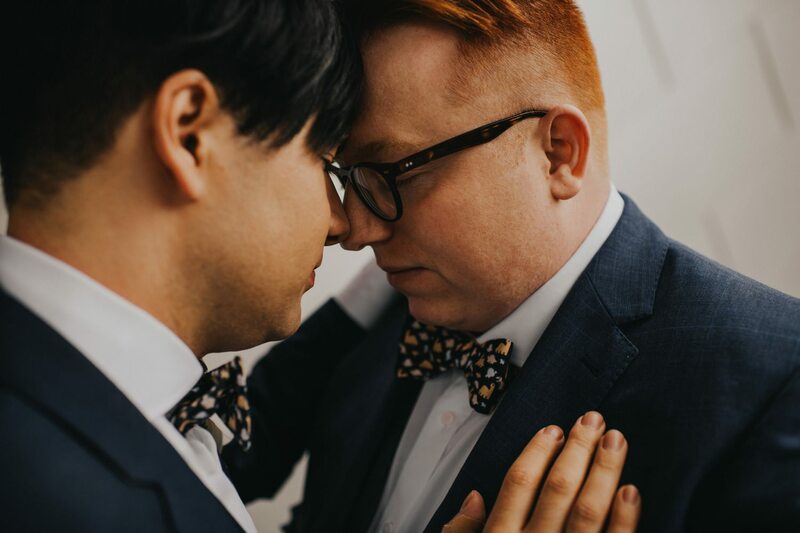 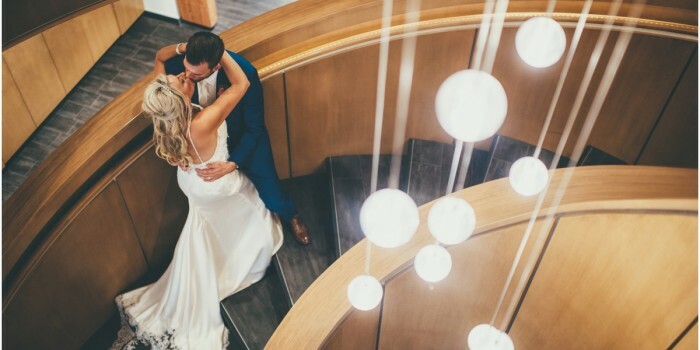 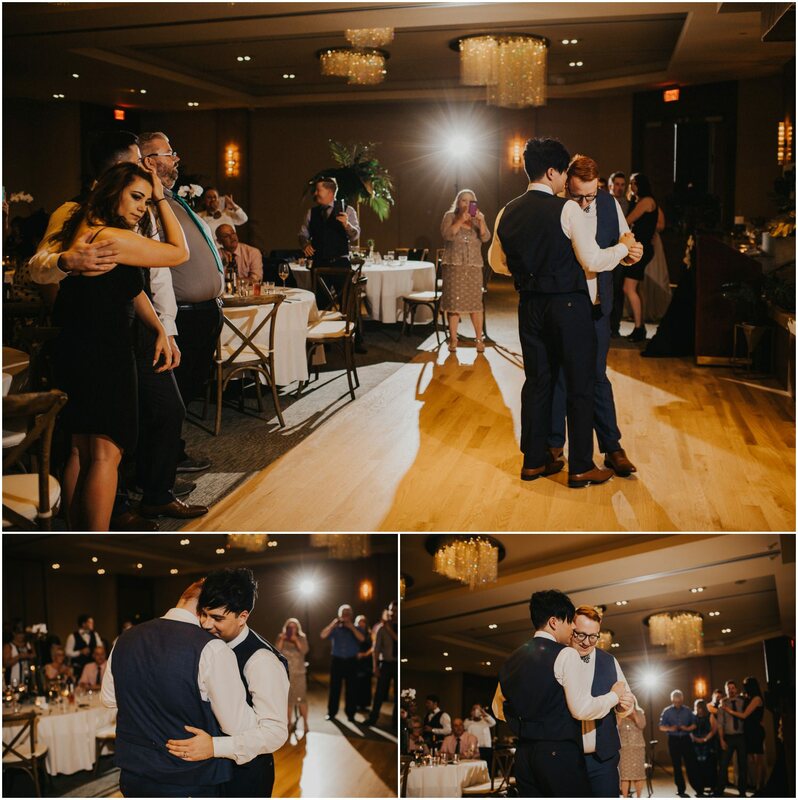 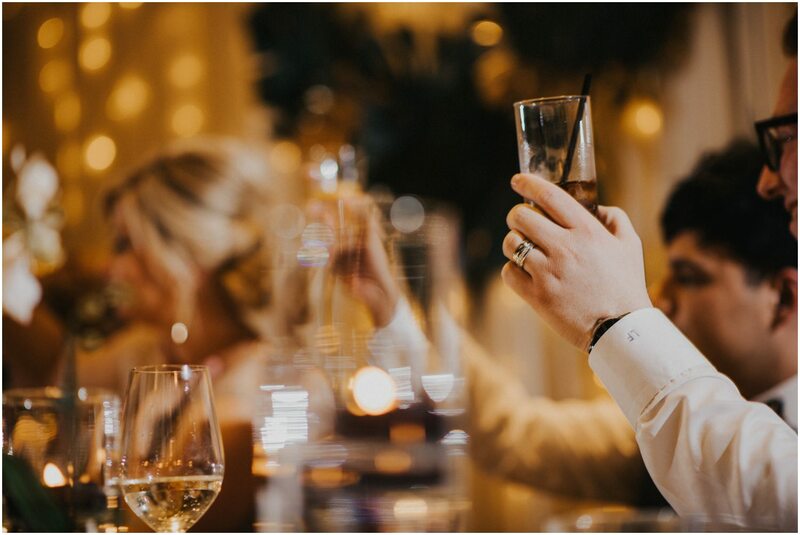 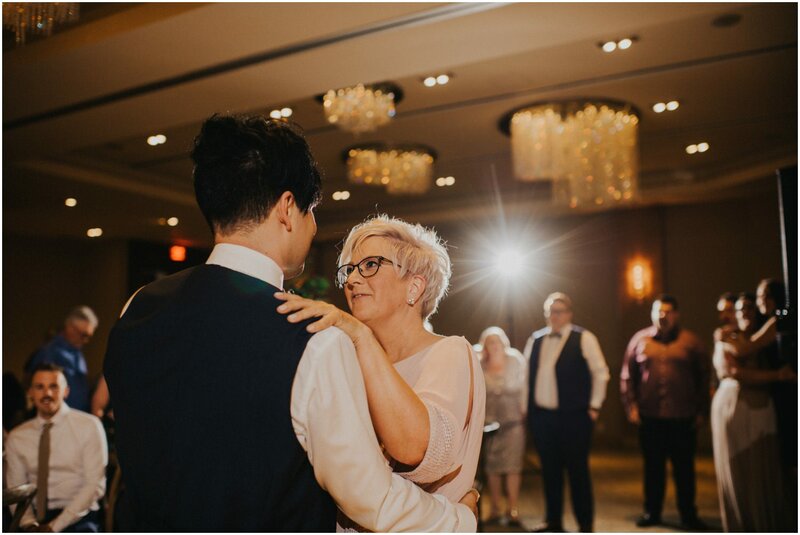 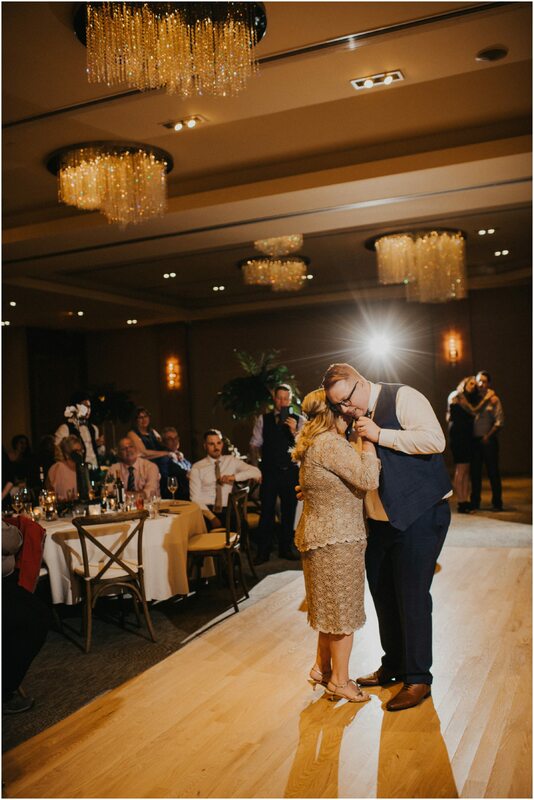 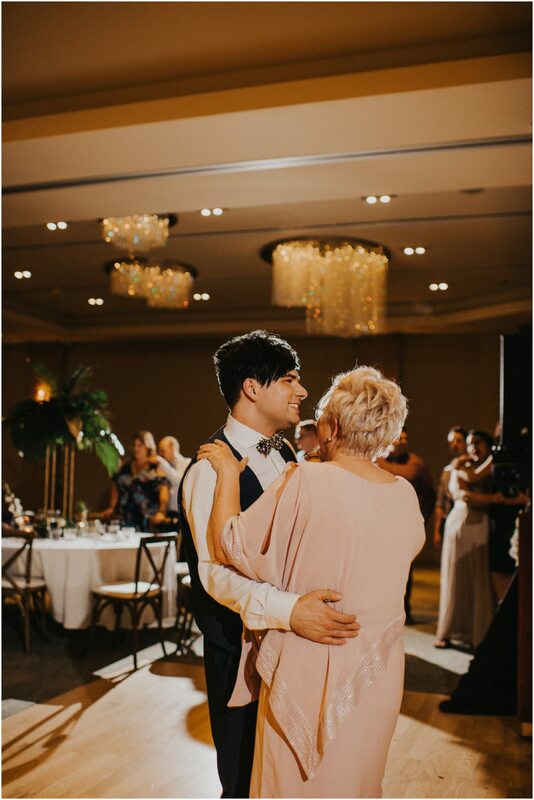 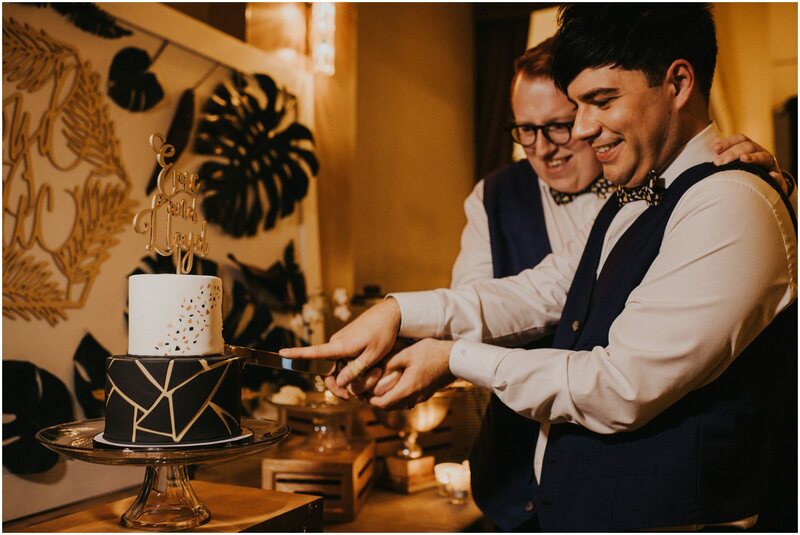 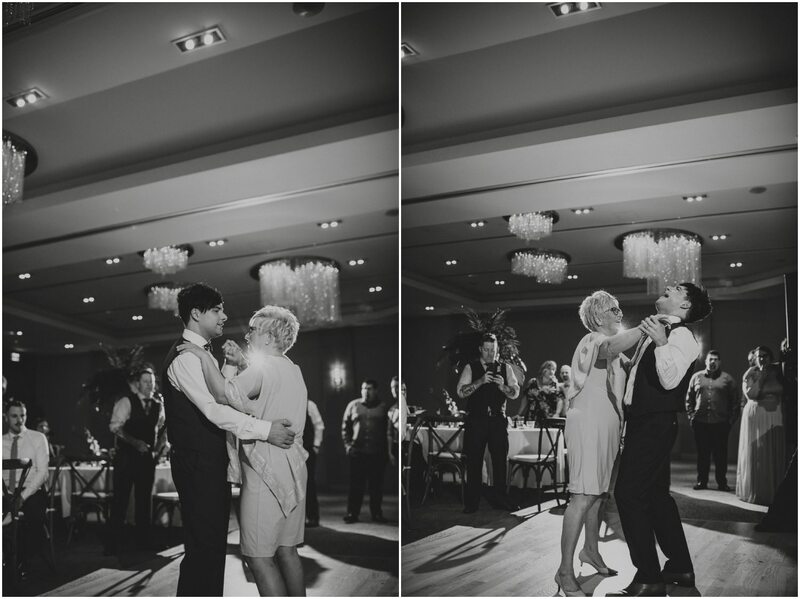 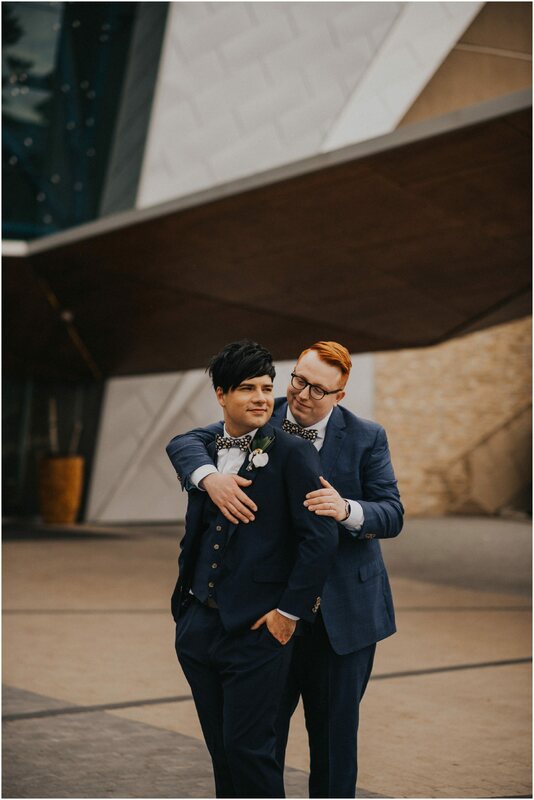 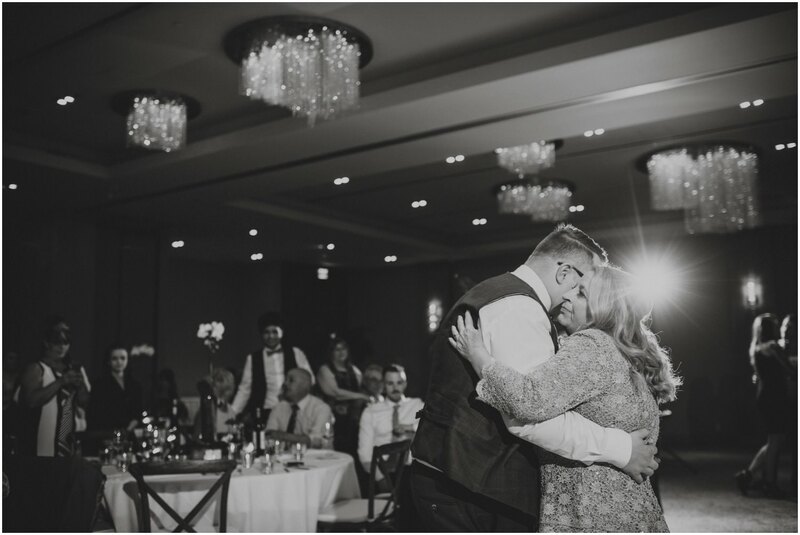 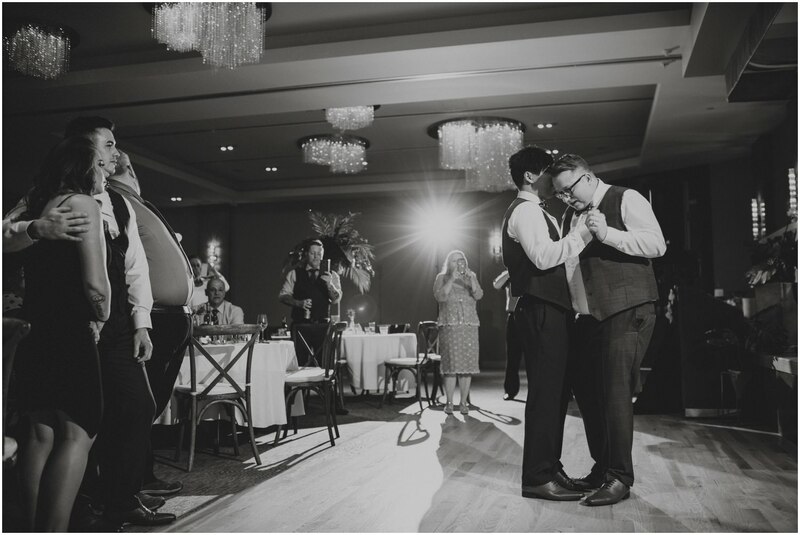 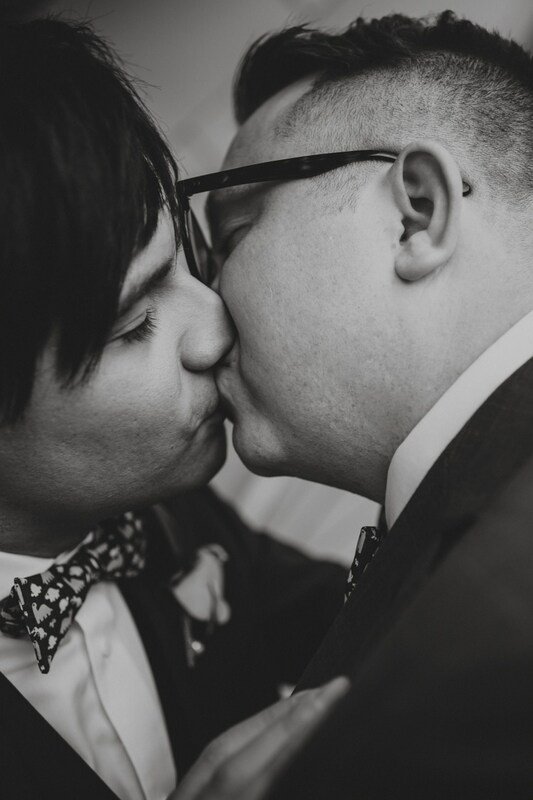 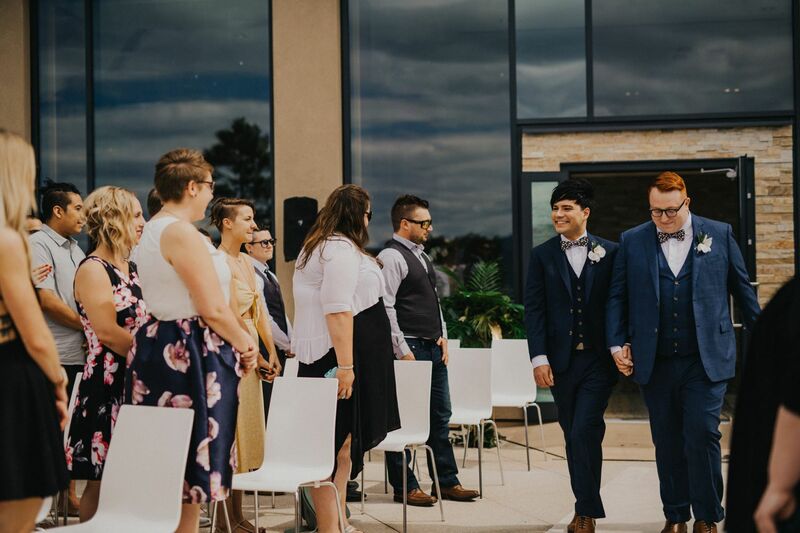 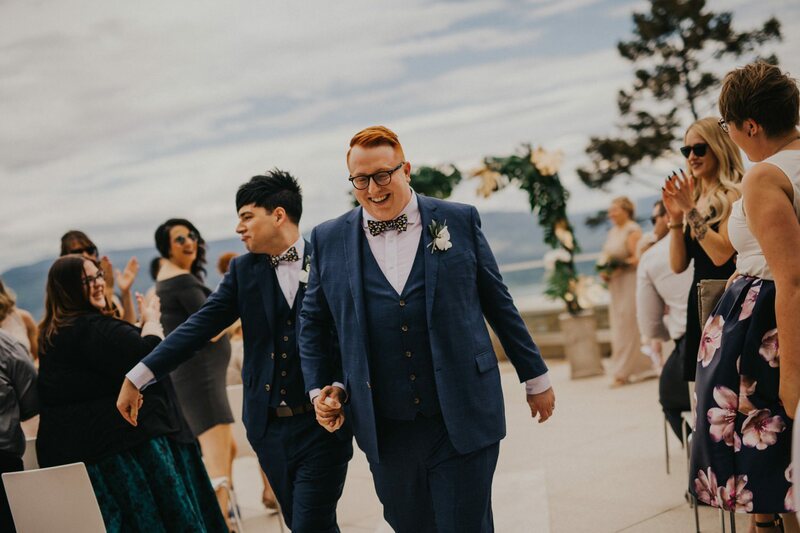 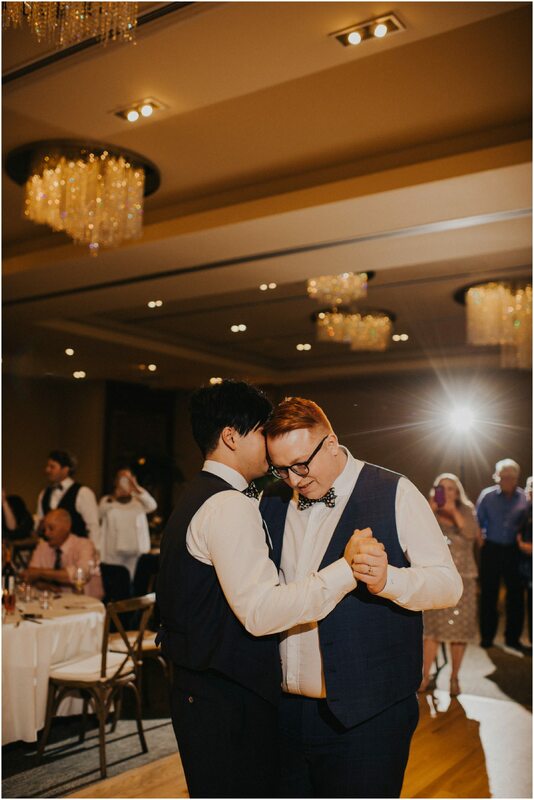 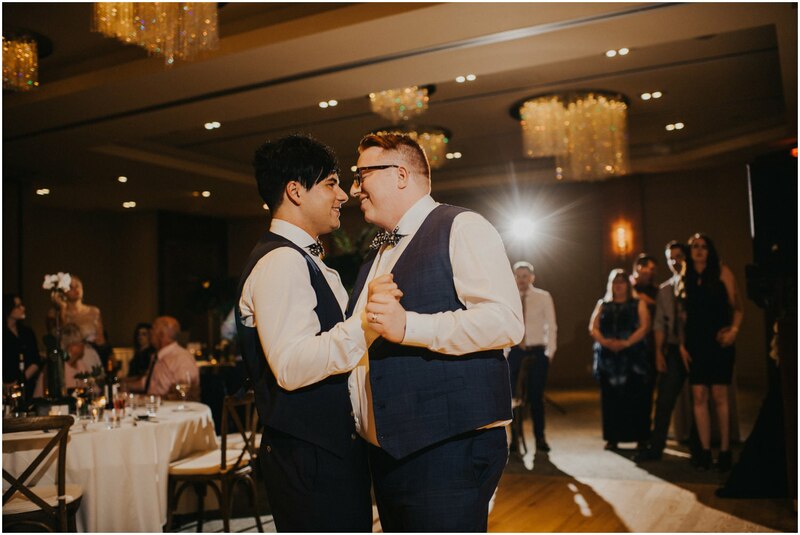 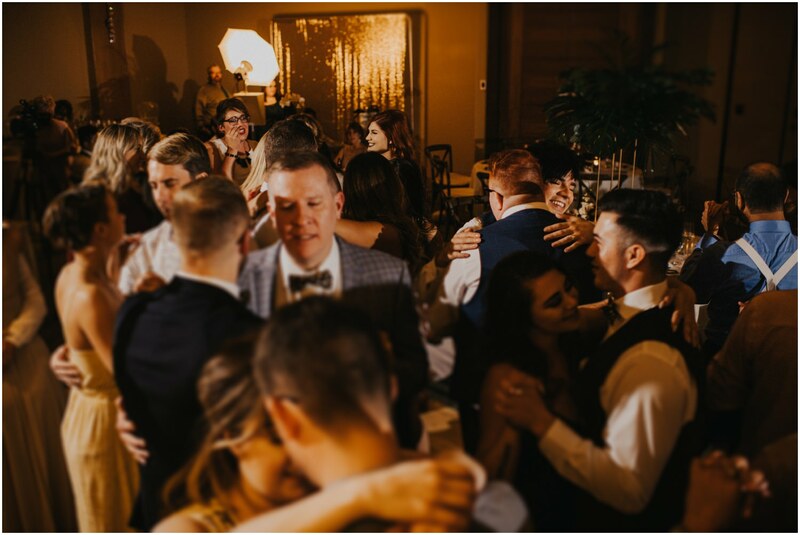 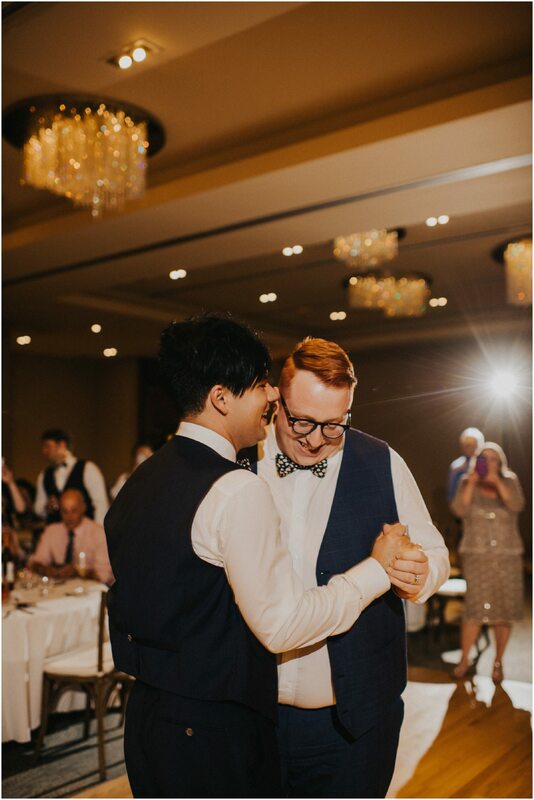 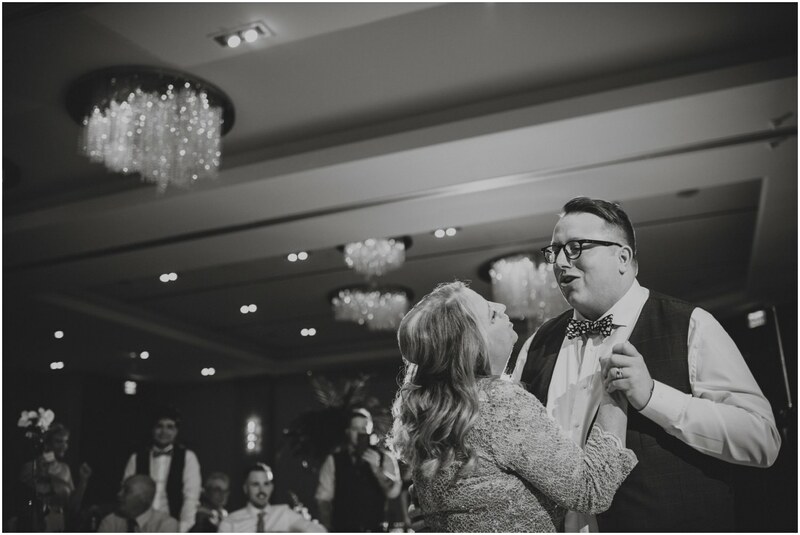 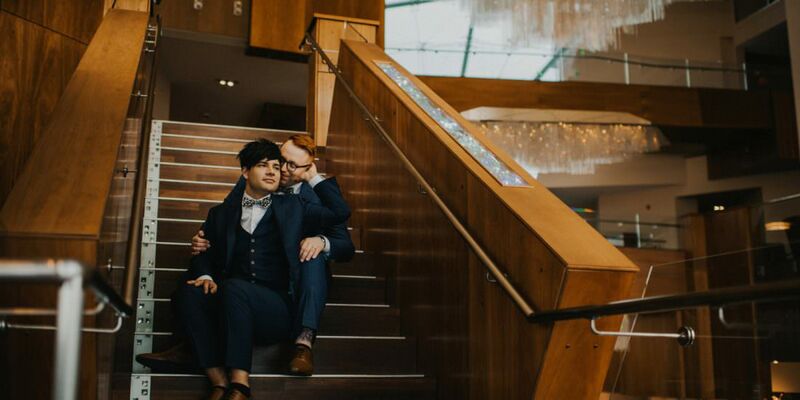 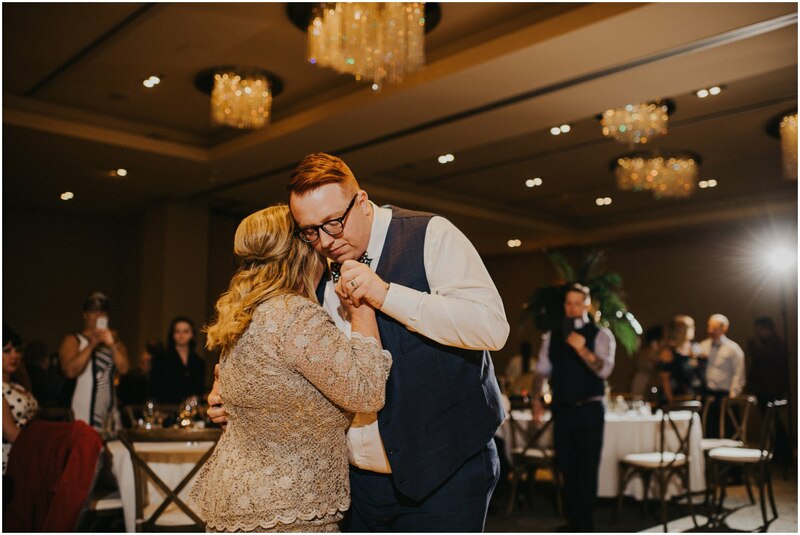 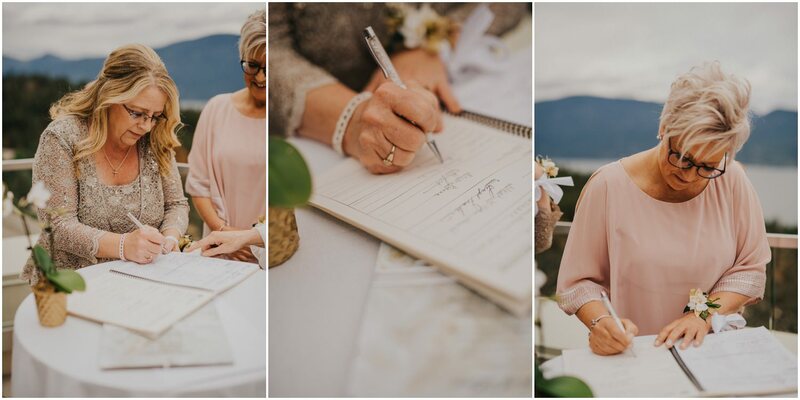 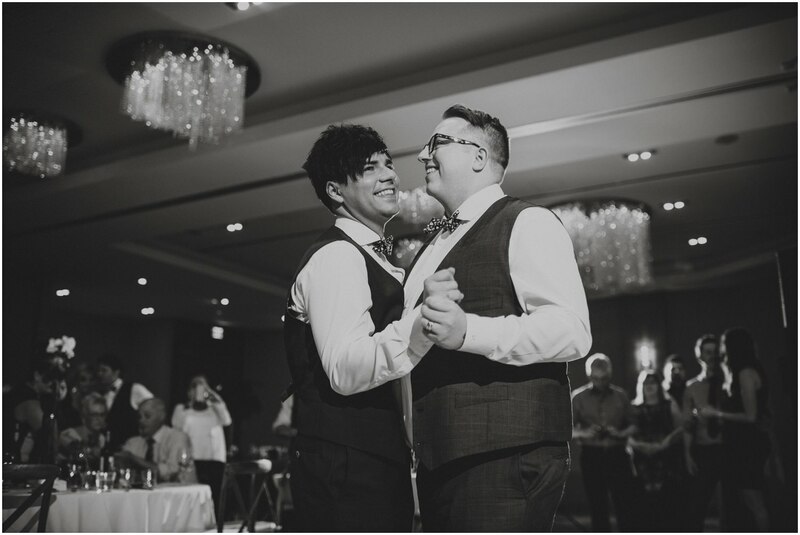 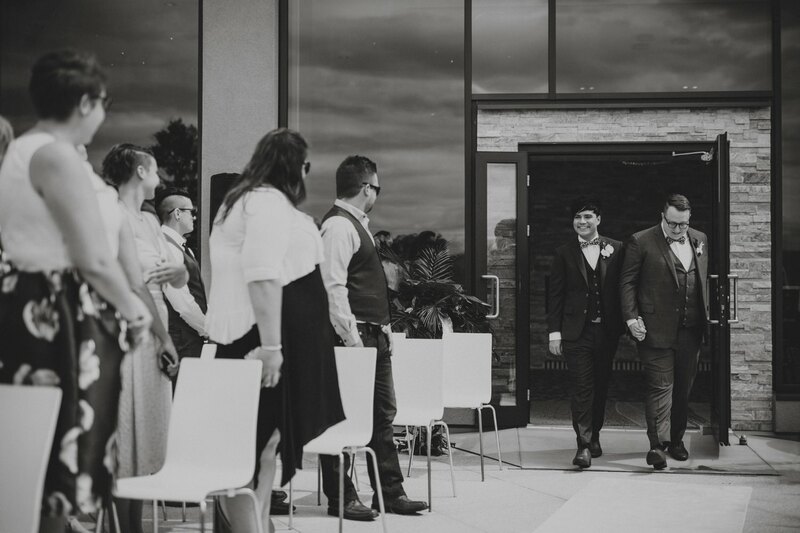 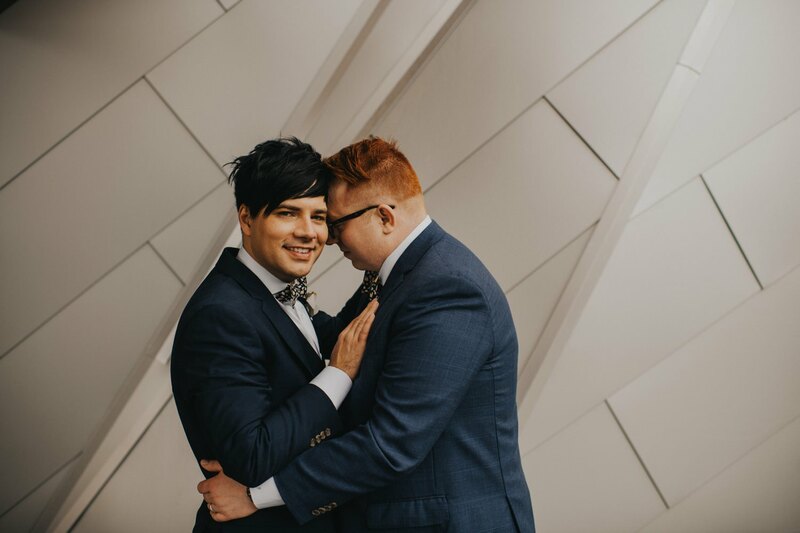 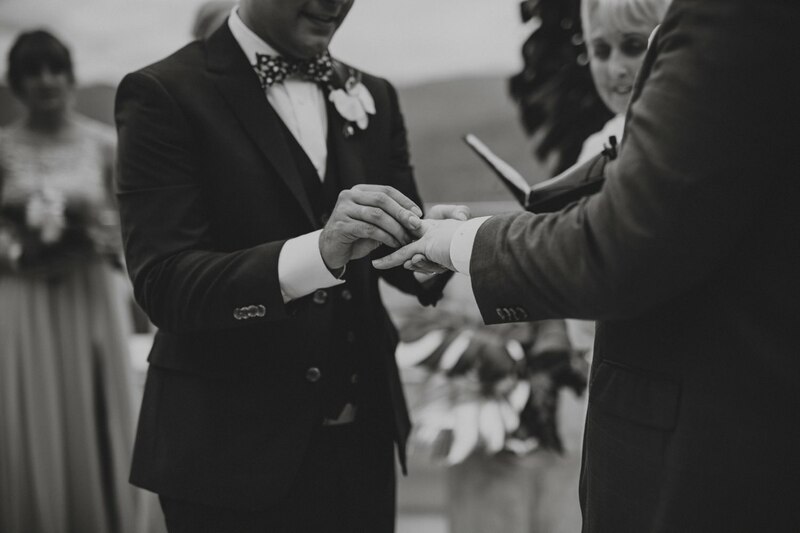 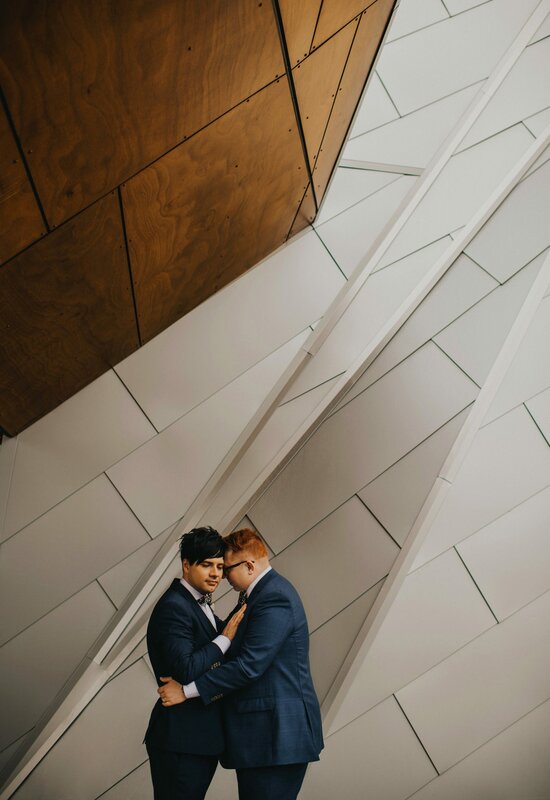 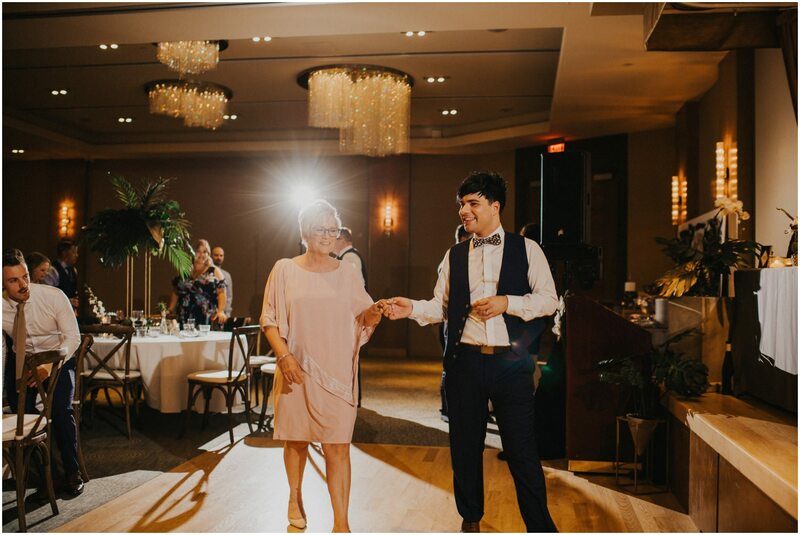 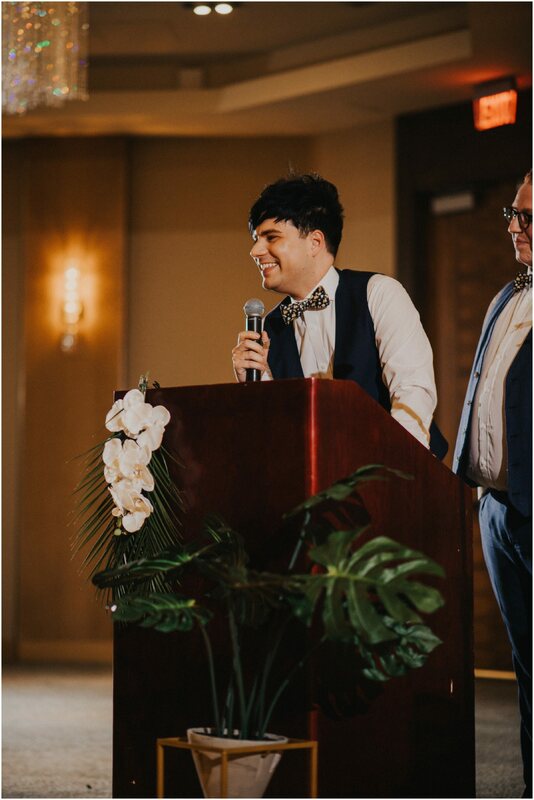 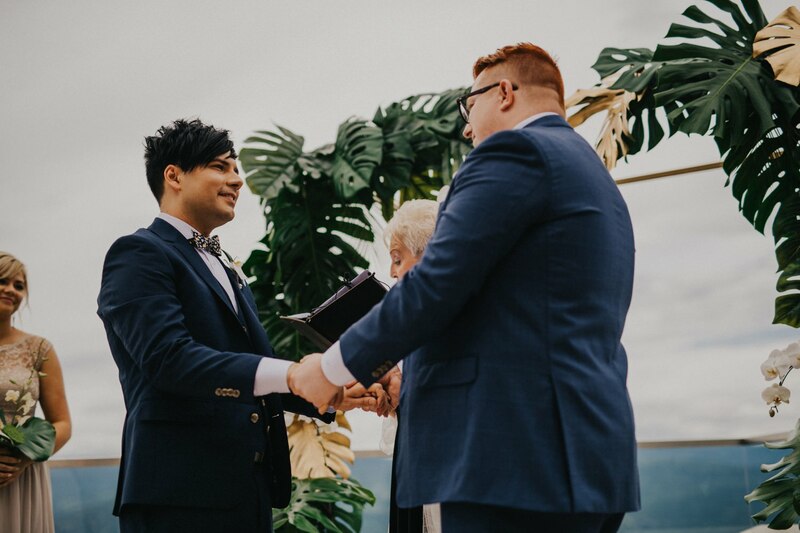 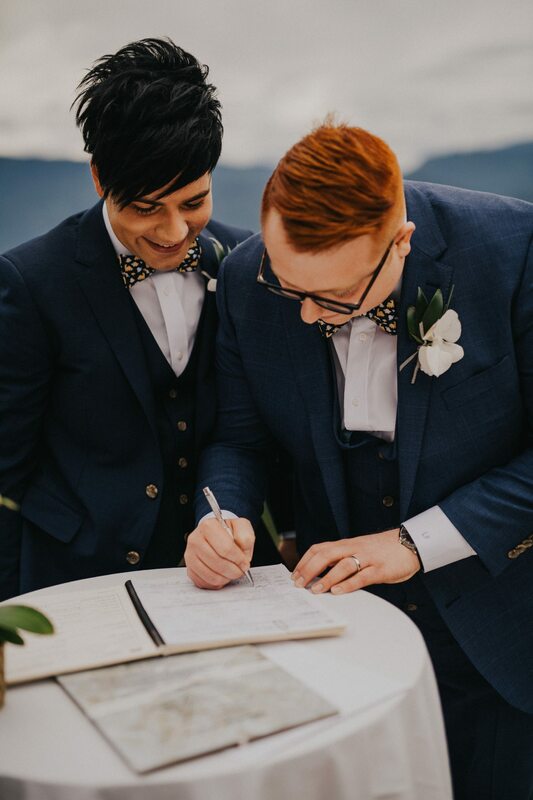 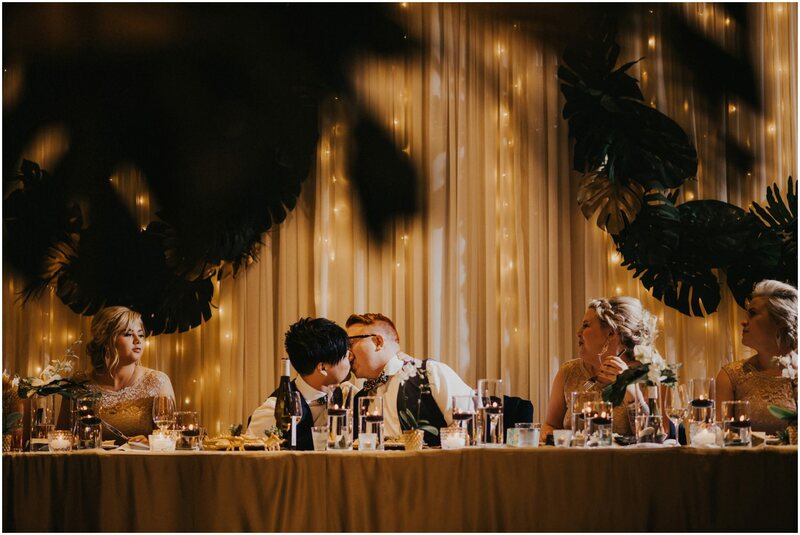 I knew that their love and wedding day was going to be one for the books, and it was absolutely just that! 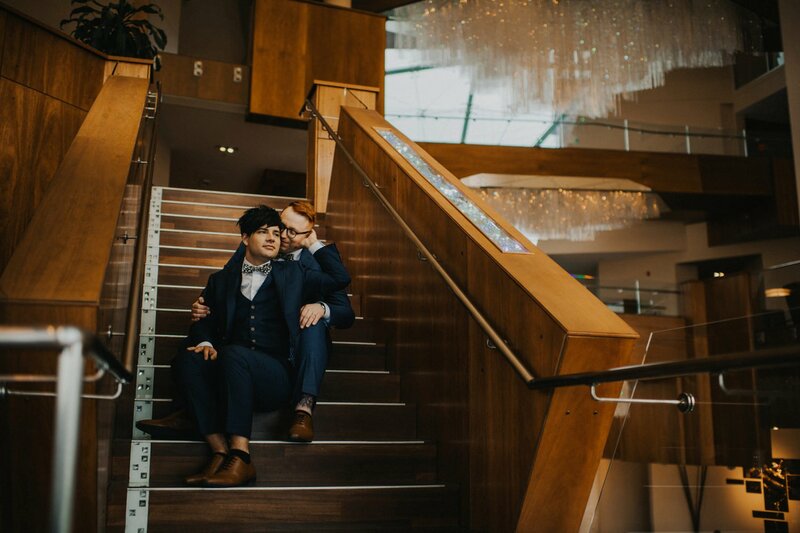 As they were getting ready for the day, the room was filled with excitement for what was ahead! 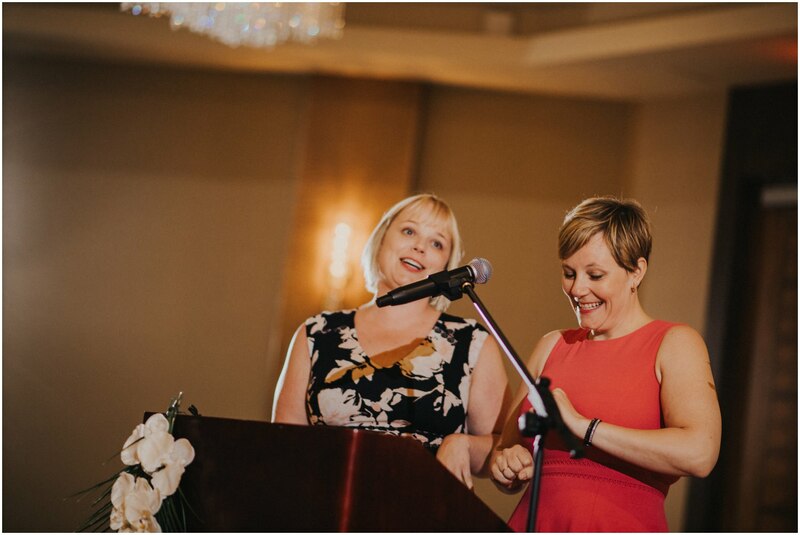 These two put together a dream team to make the vision happen! 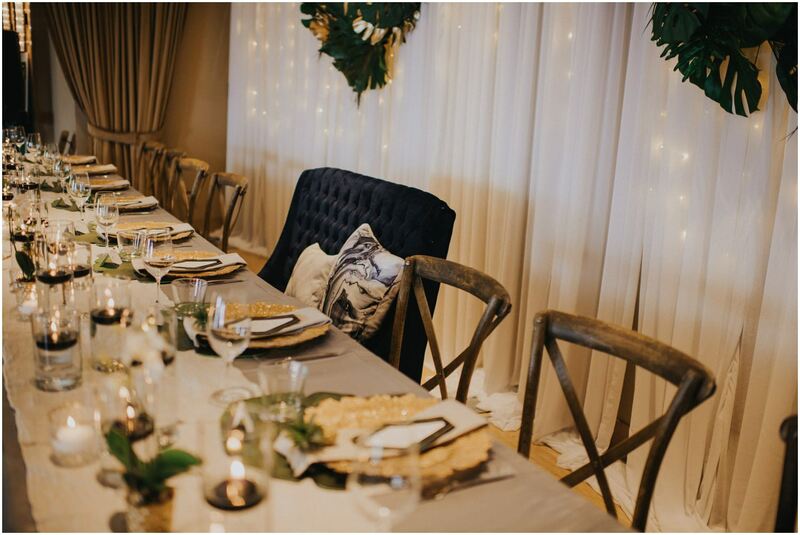 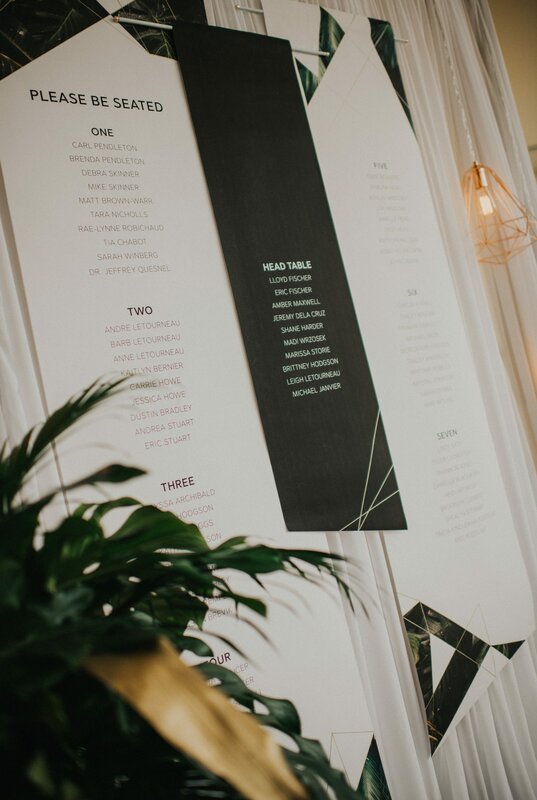 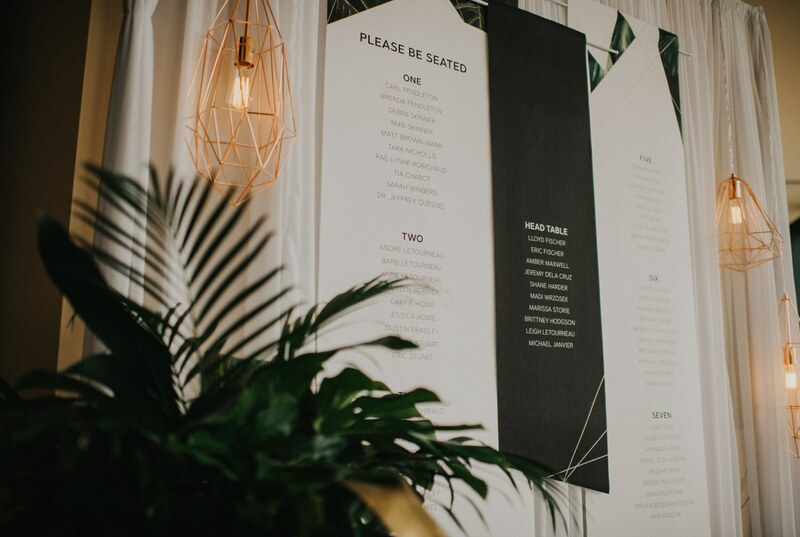 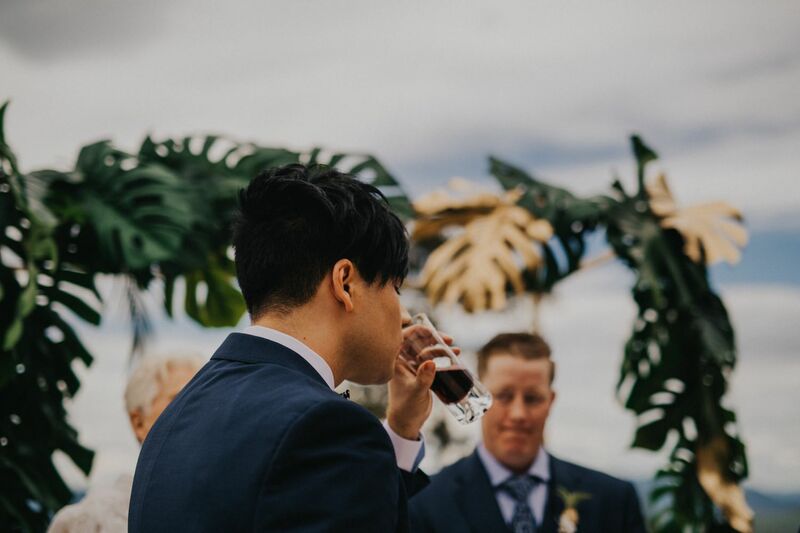 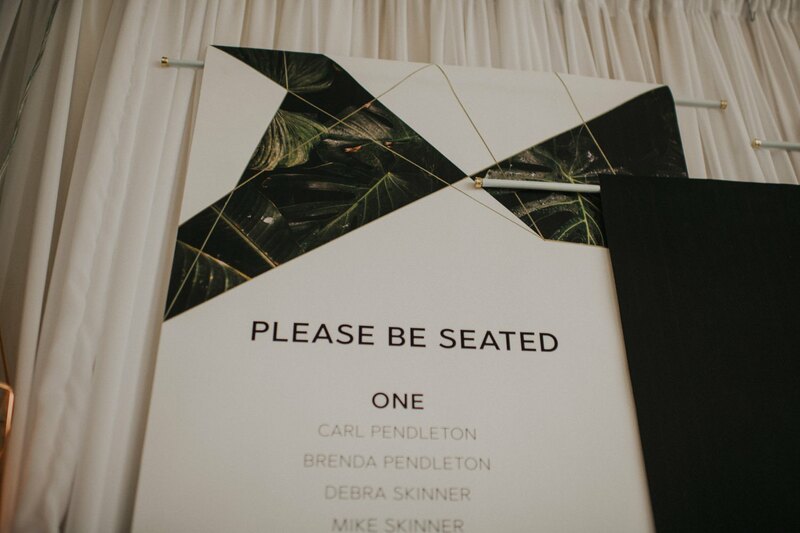 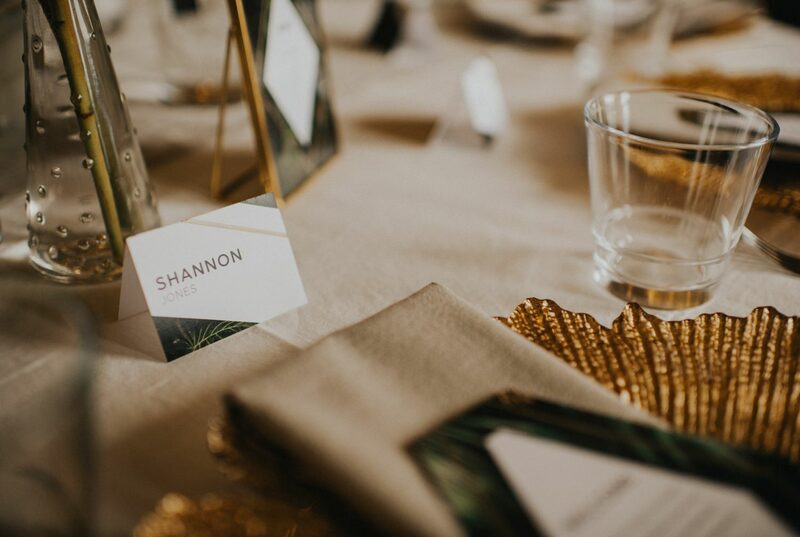 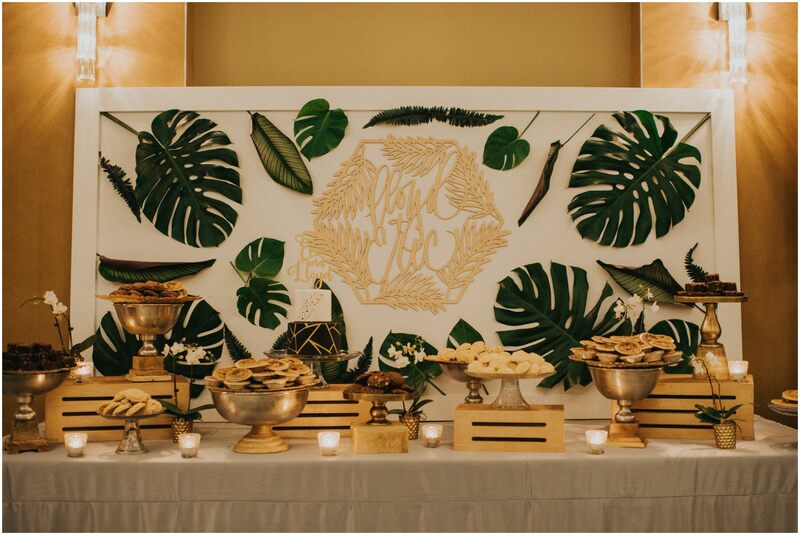 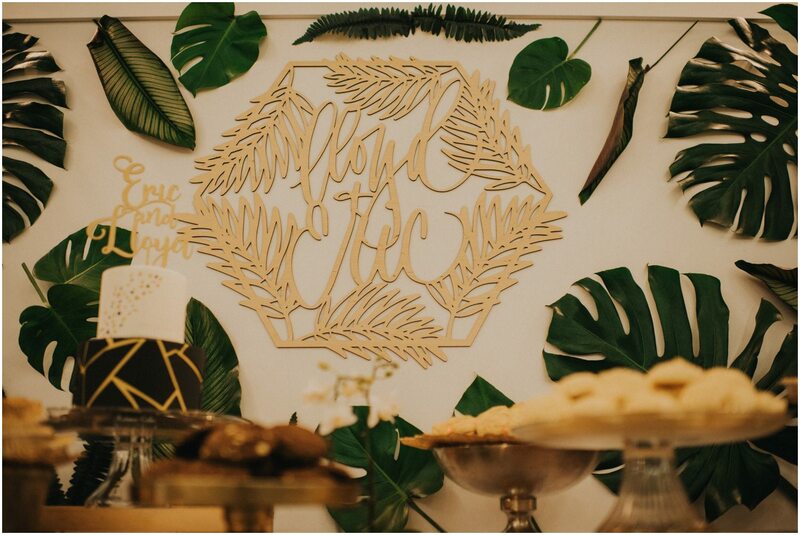 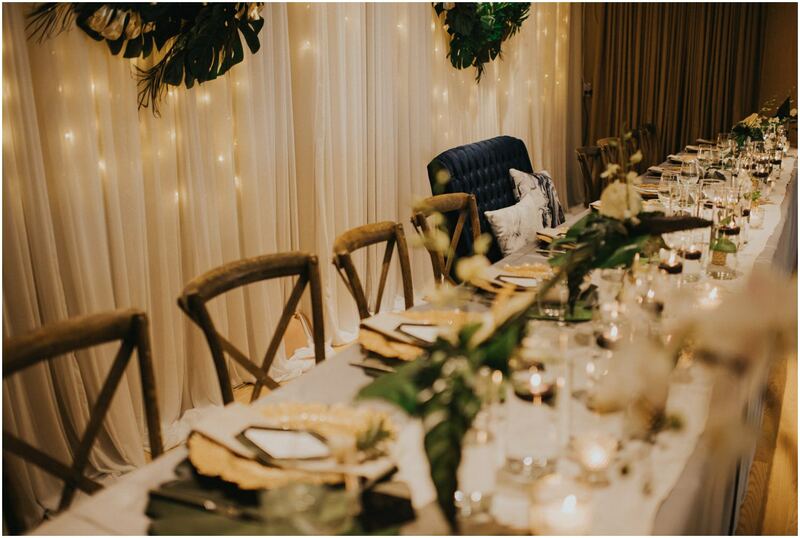 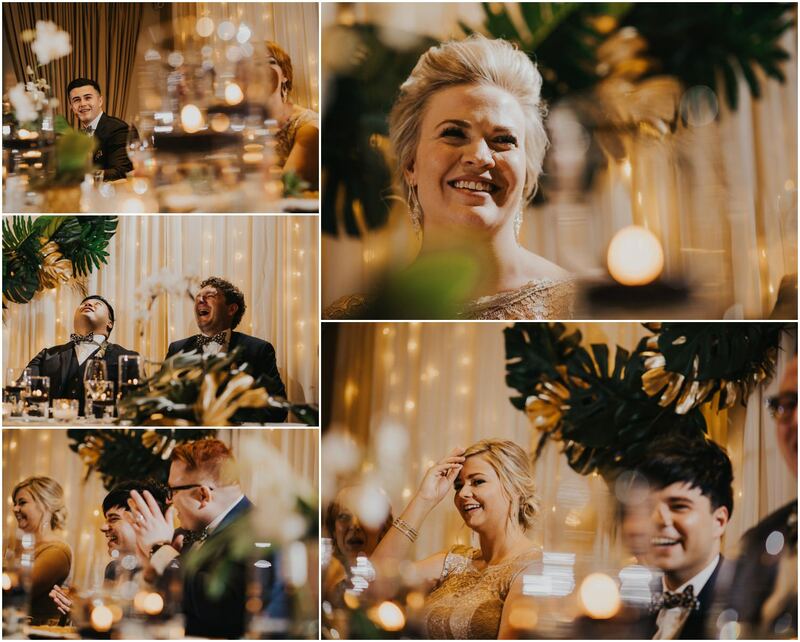 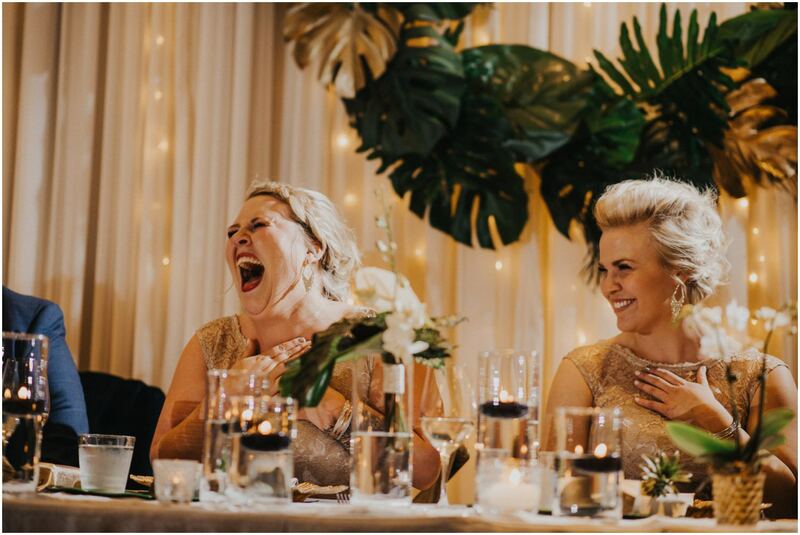 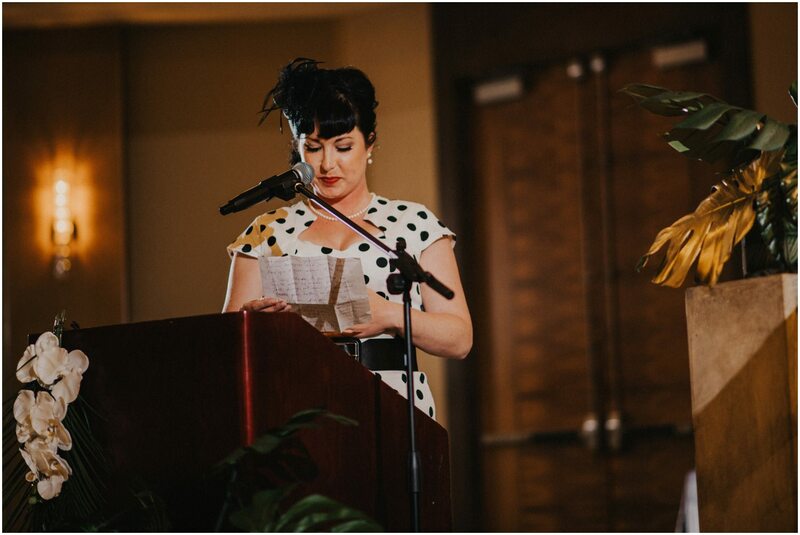 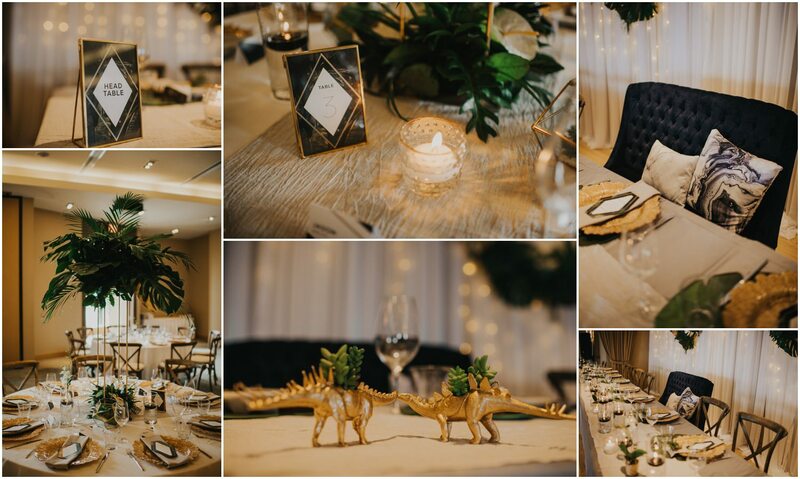 One stellar Dinosaur Themed wedding with a tropical jungle feel to it all. 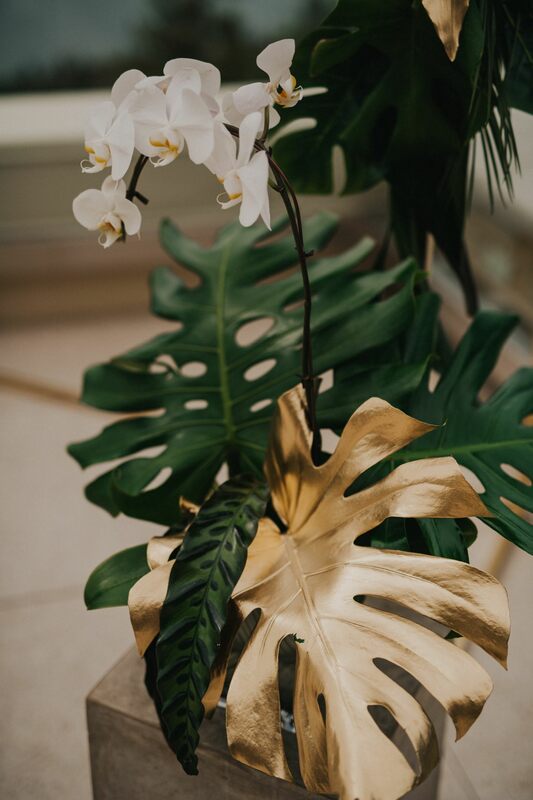 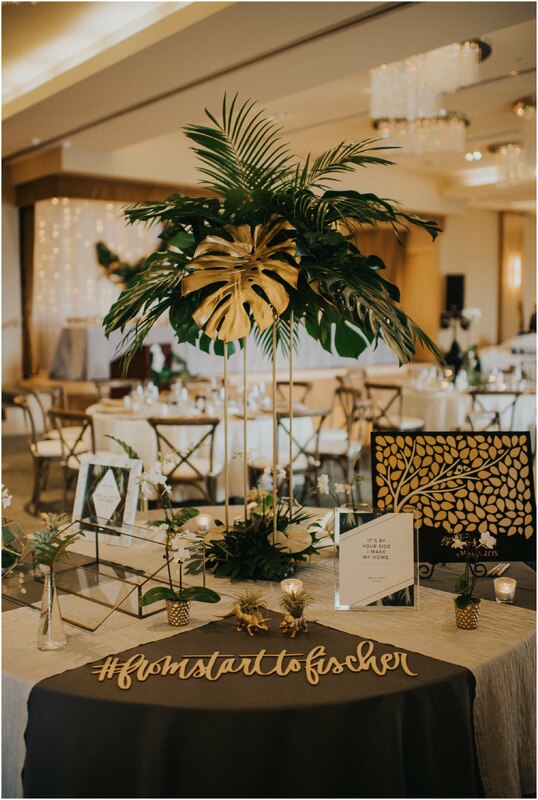 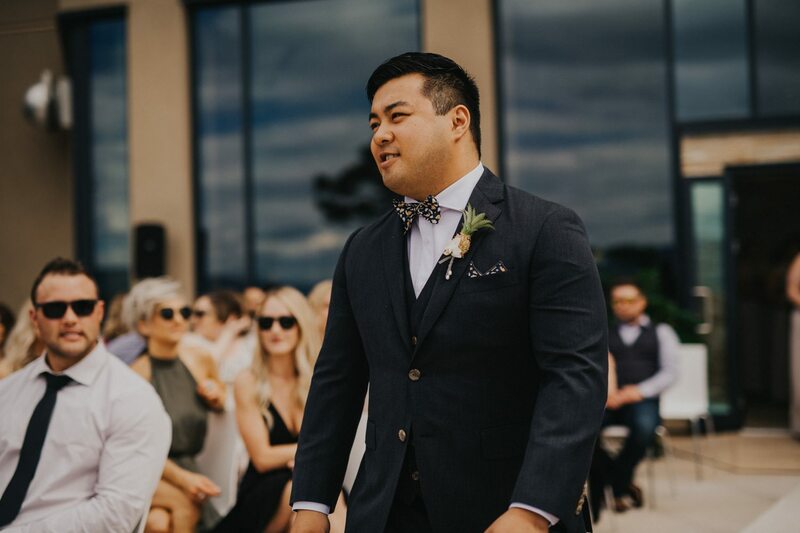 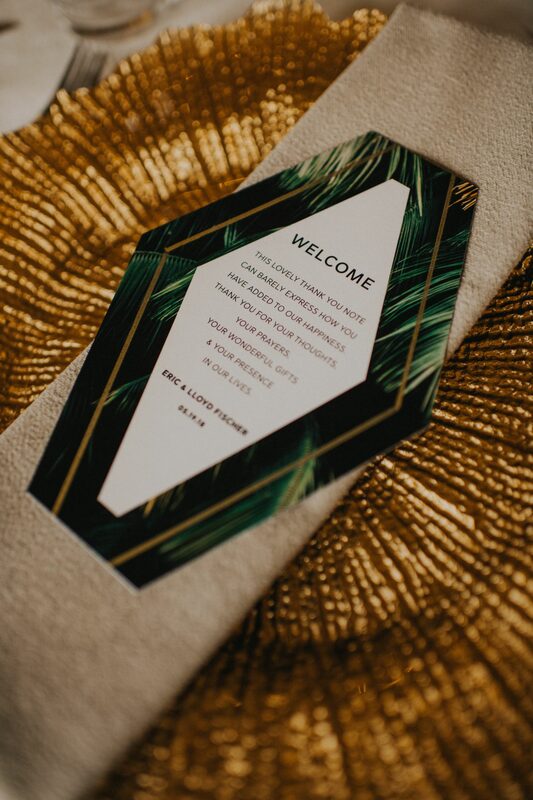 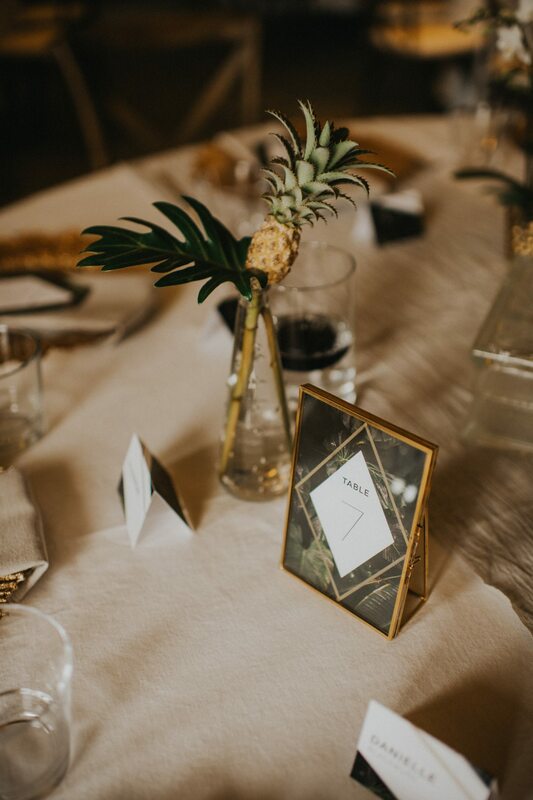 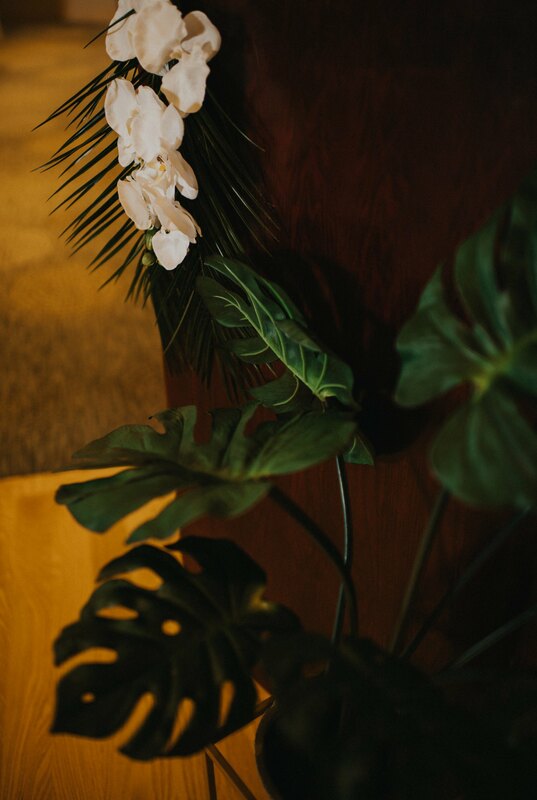 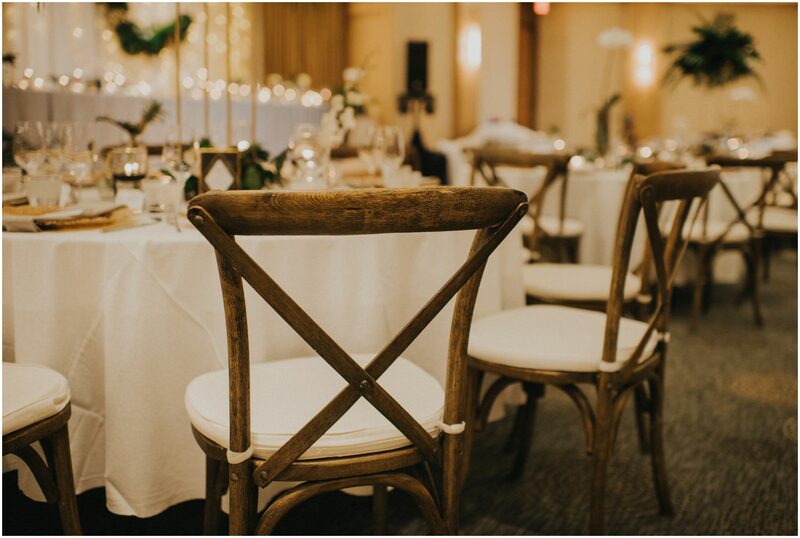 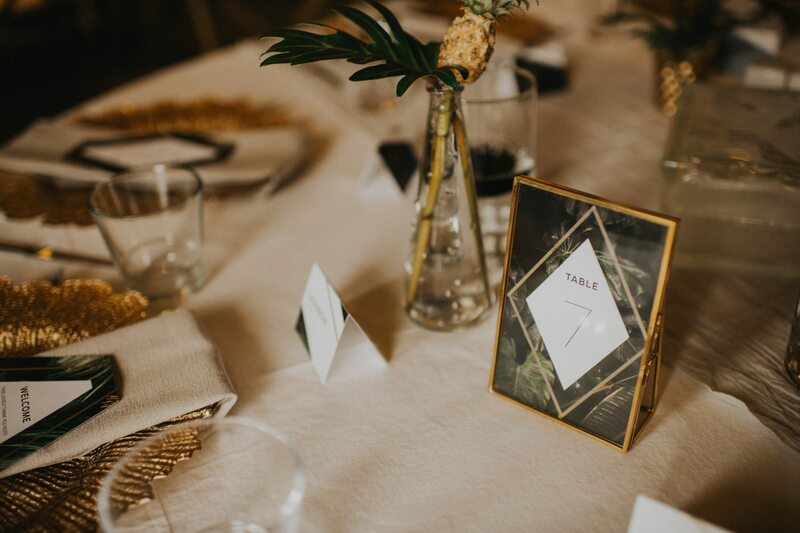 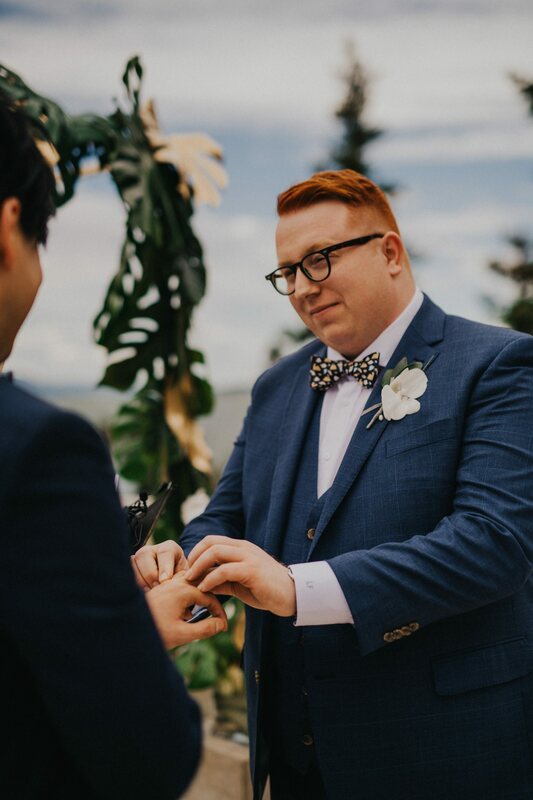 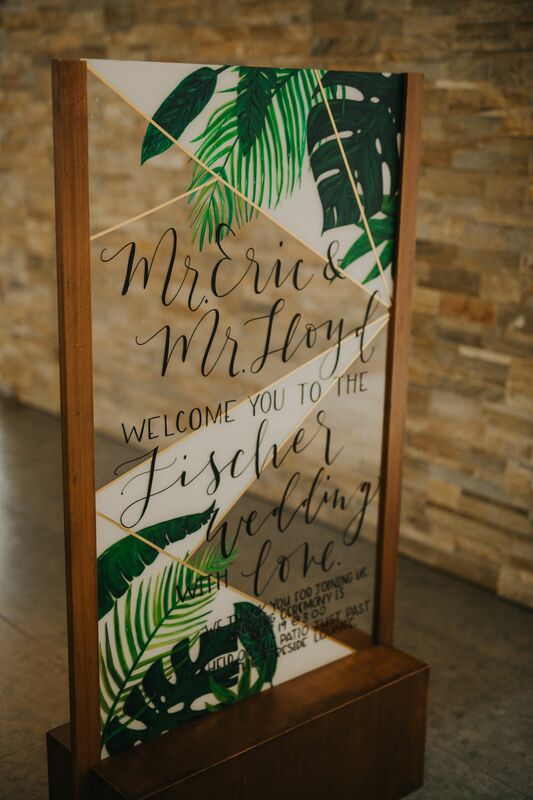 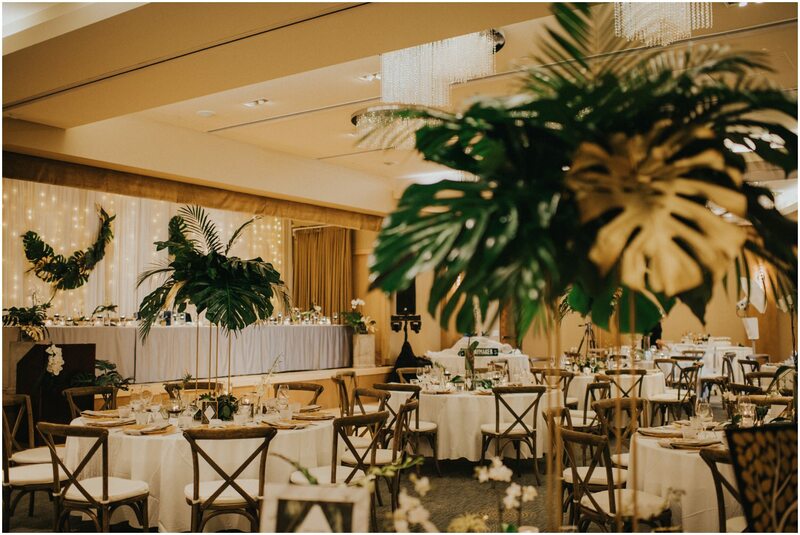 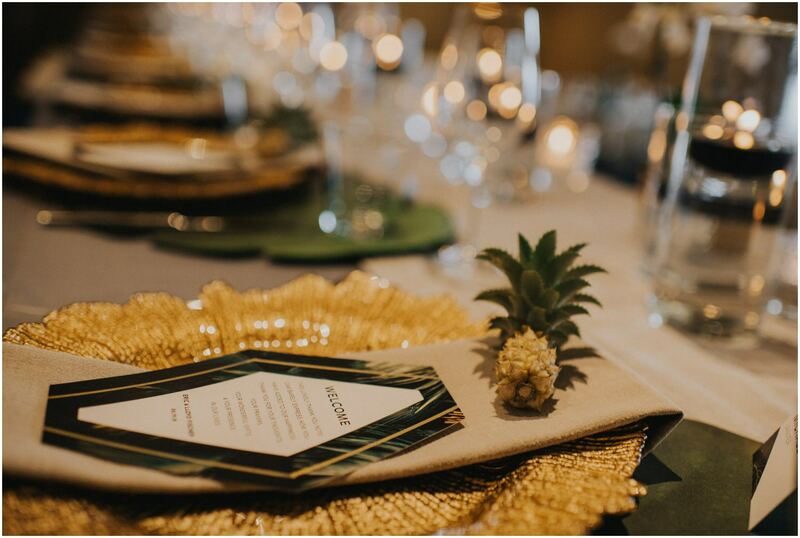 From Vintage Origami’s unreal styling of the day, tied together with gorgeous lush tropical florals that brought a jungle feel by Crocus Floral Design. 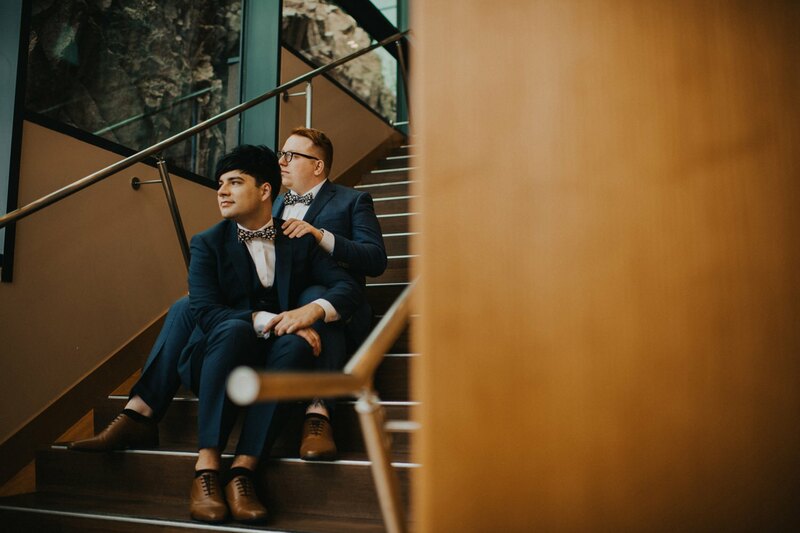 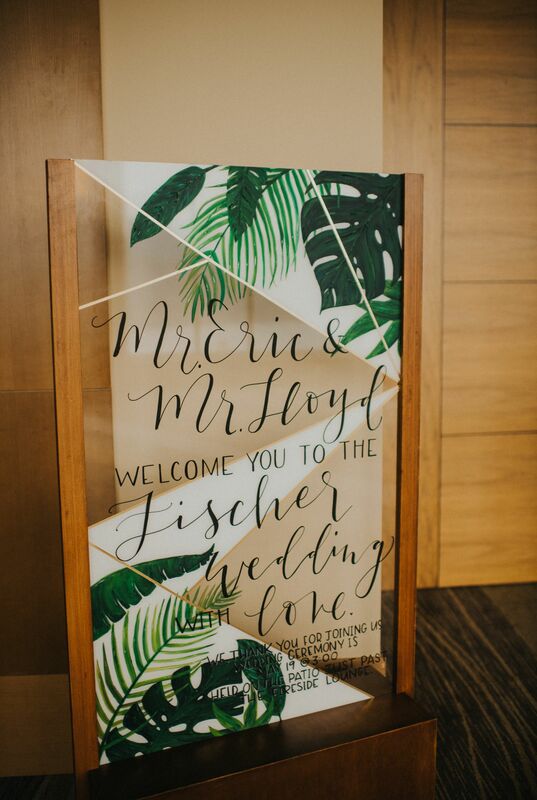 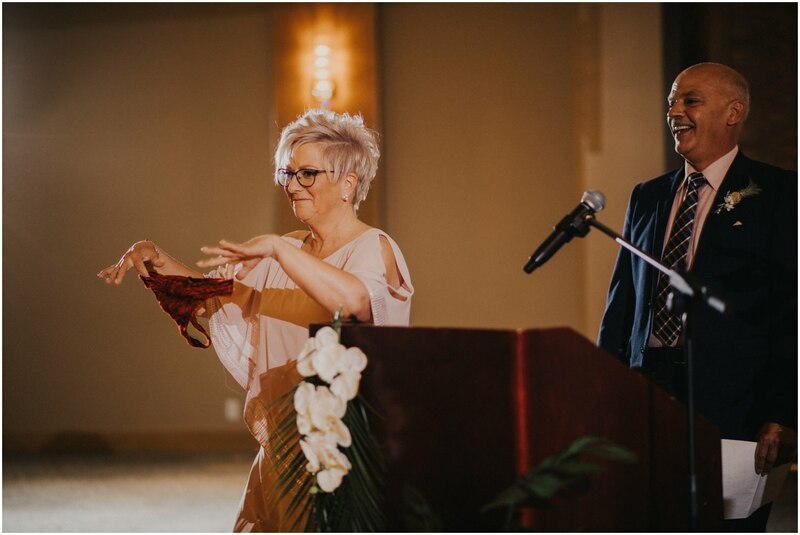 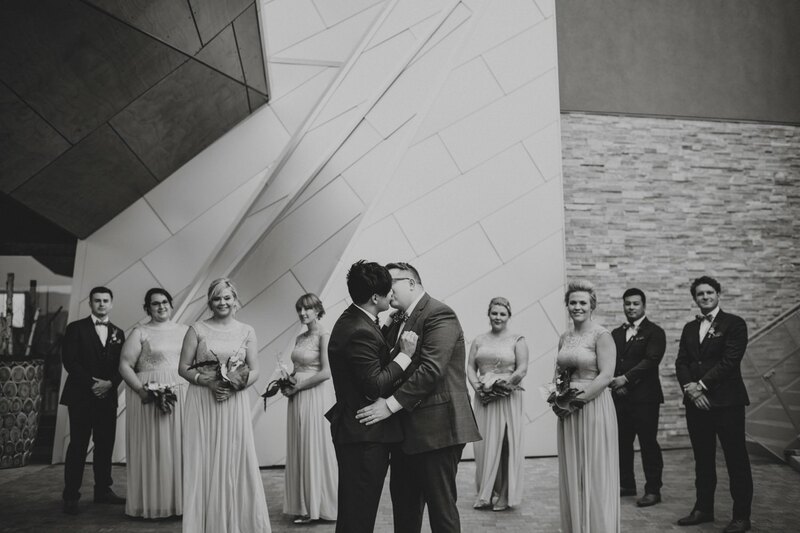 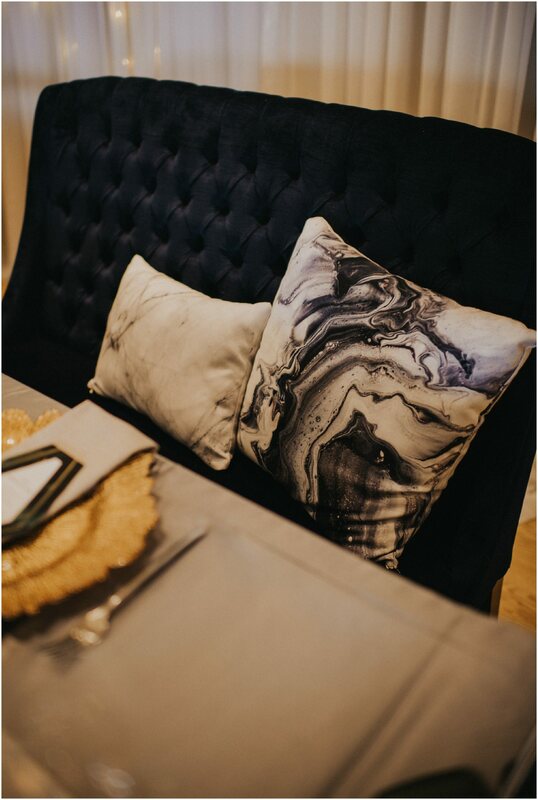 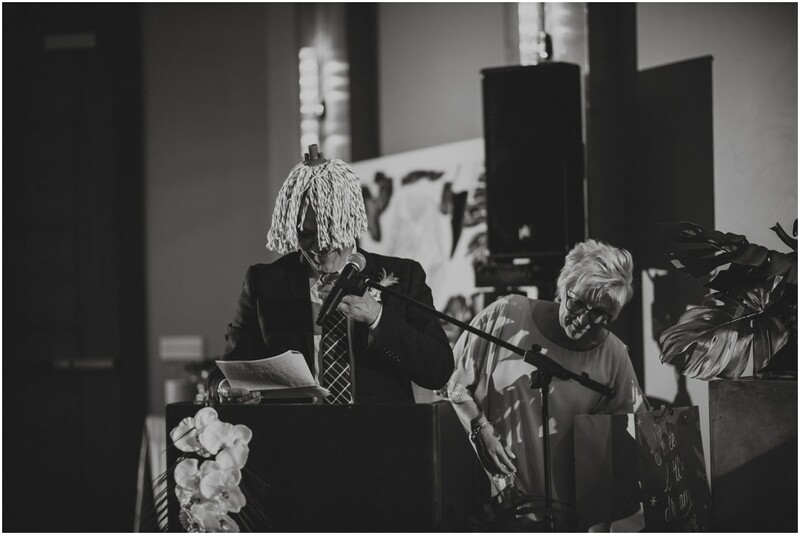 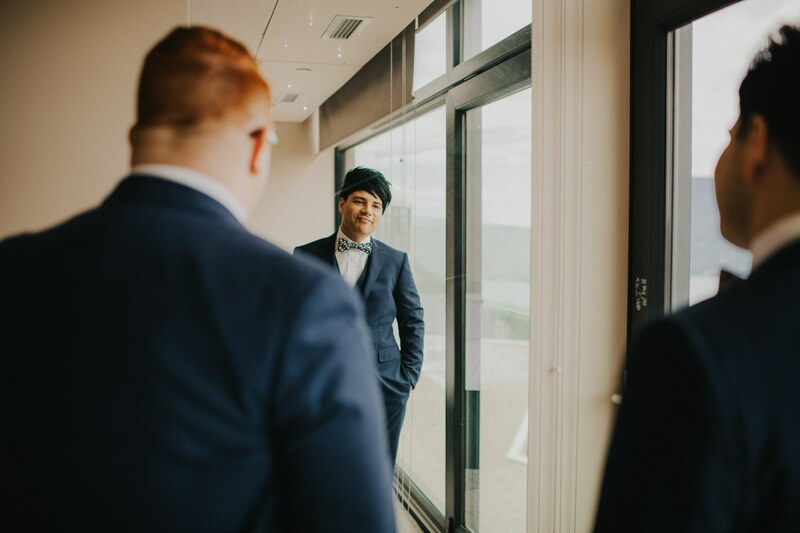 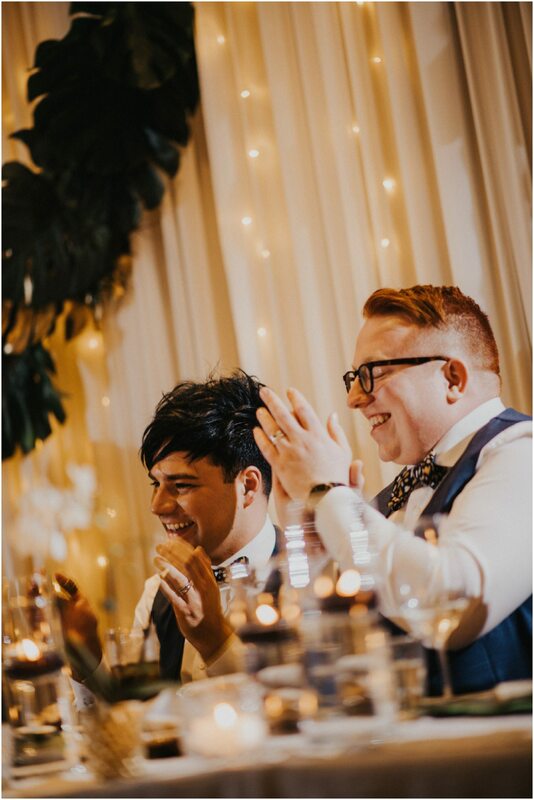 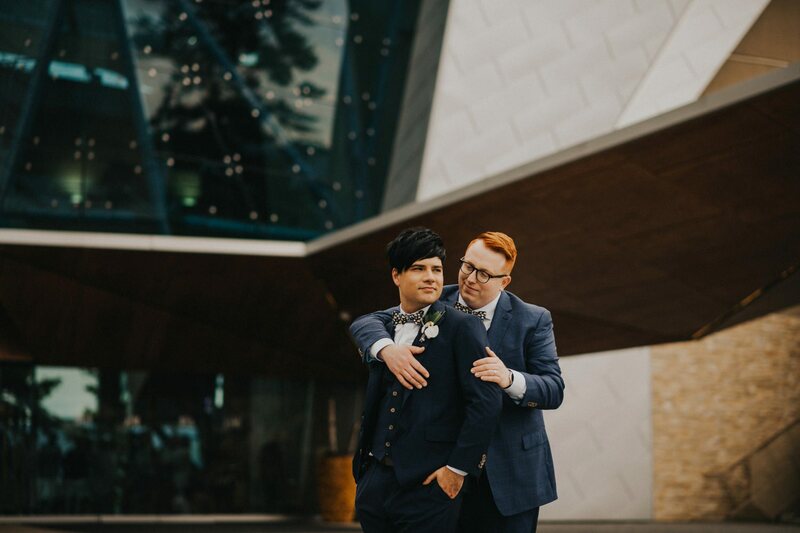 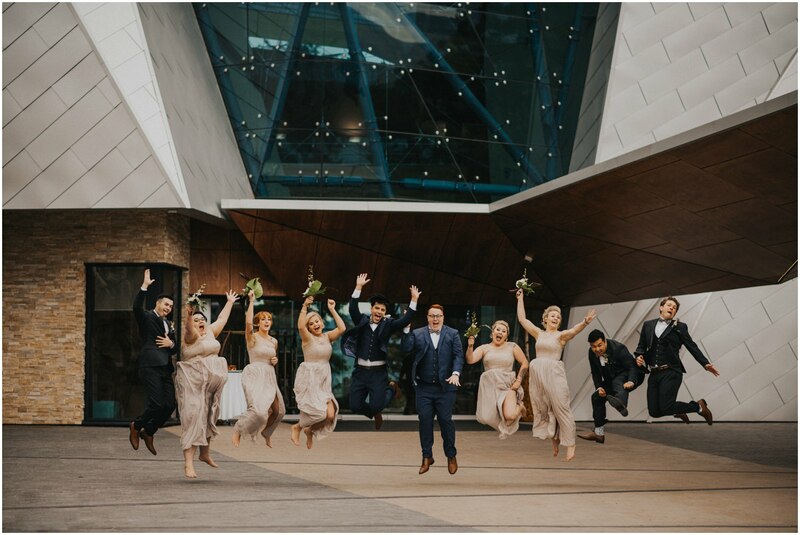 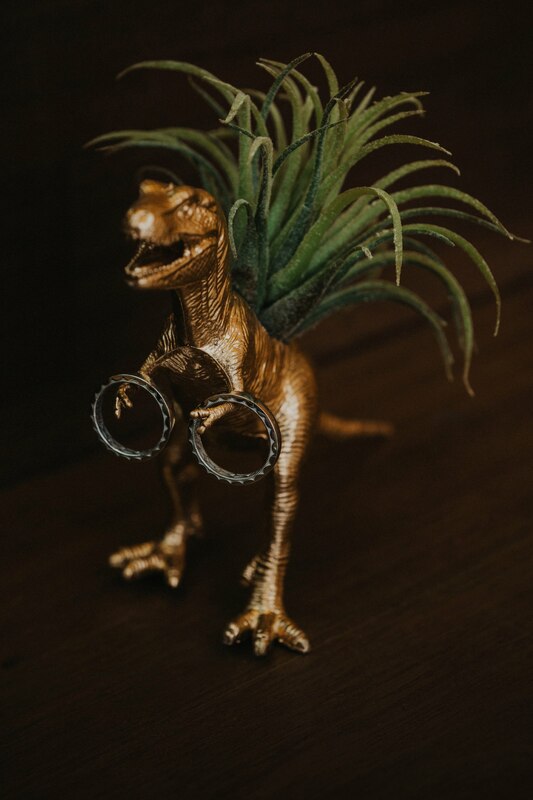 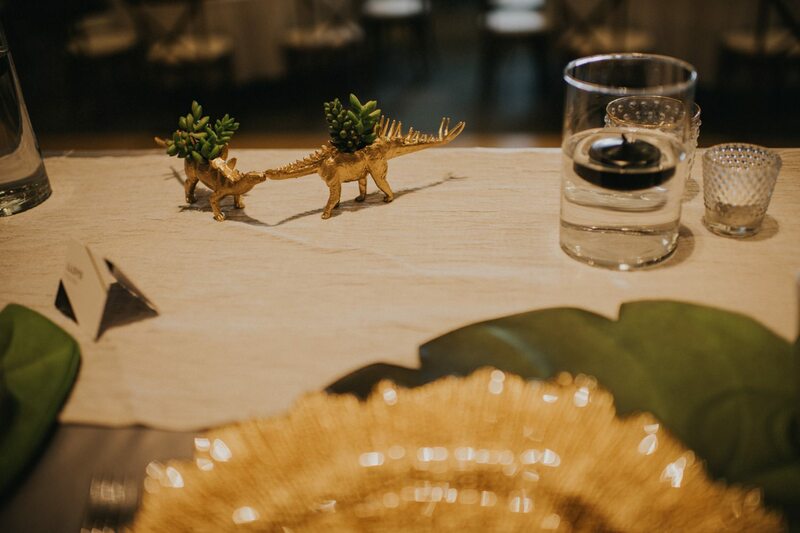 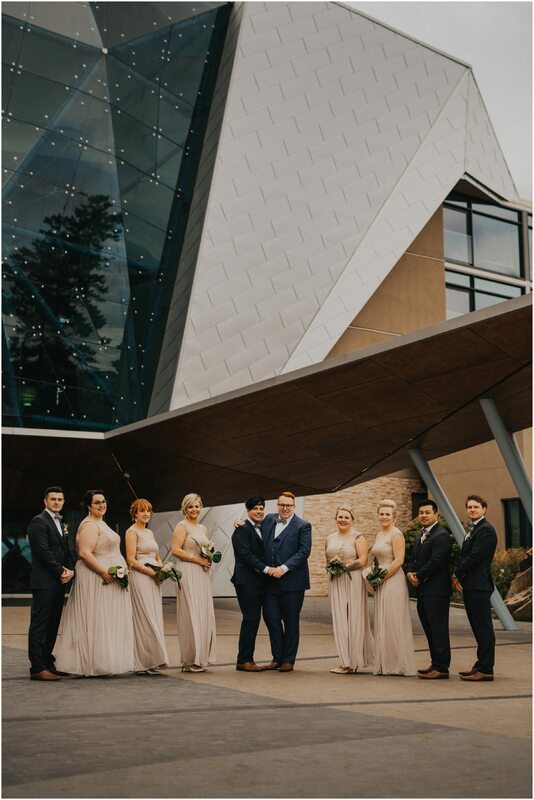 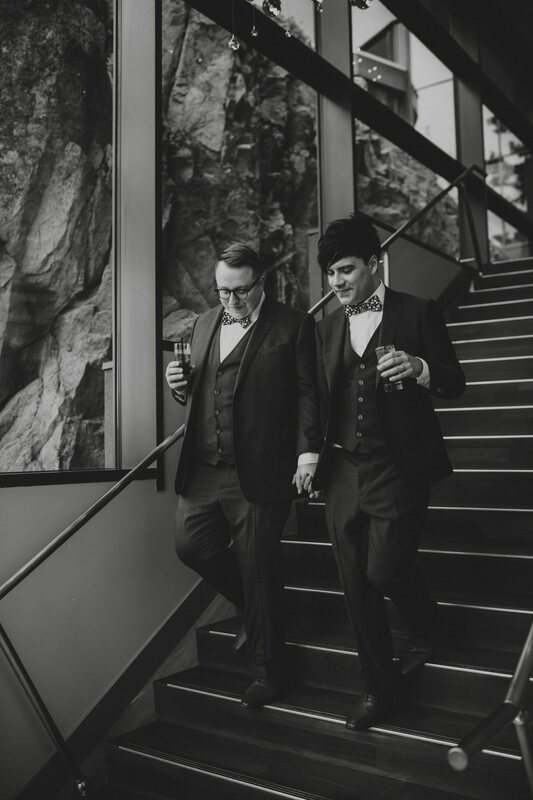 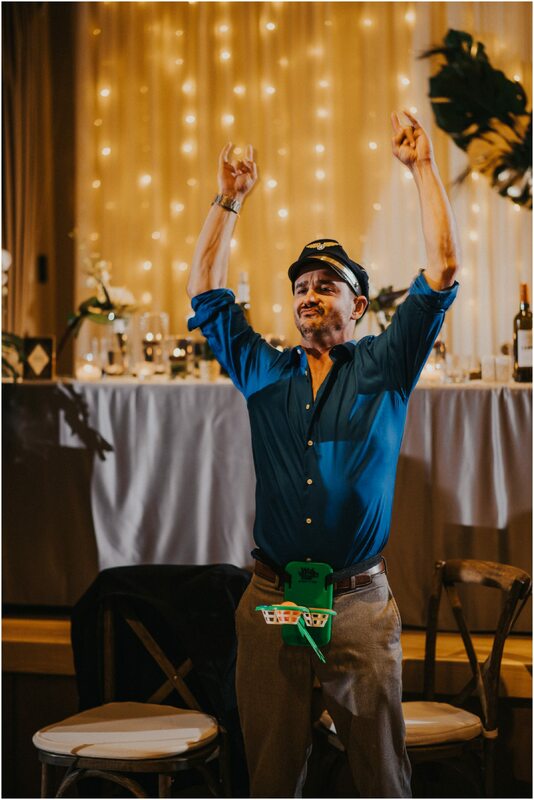 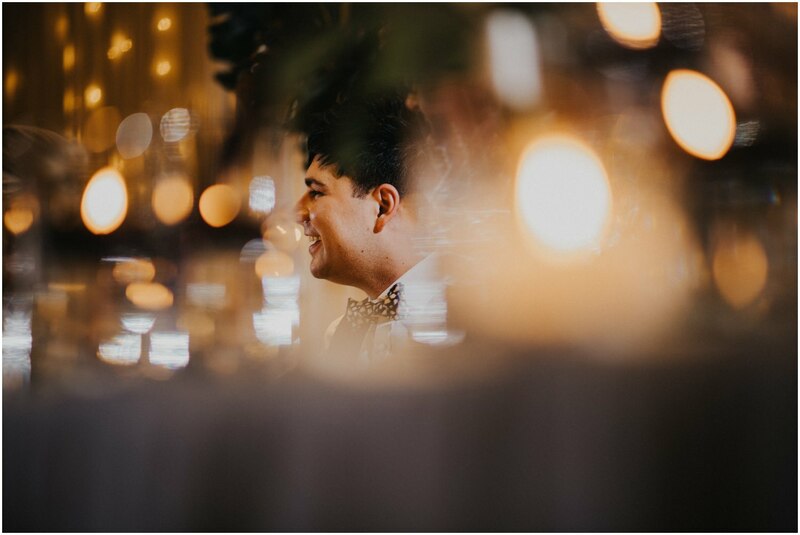 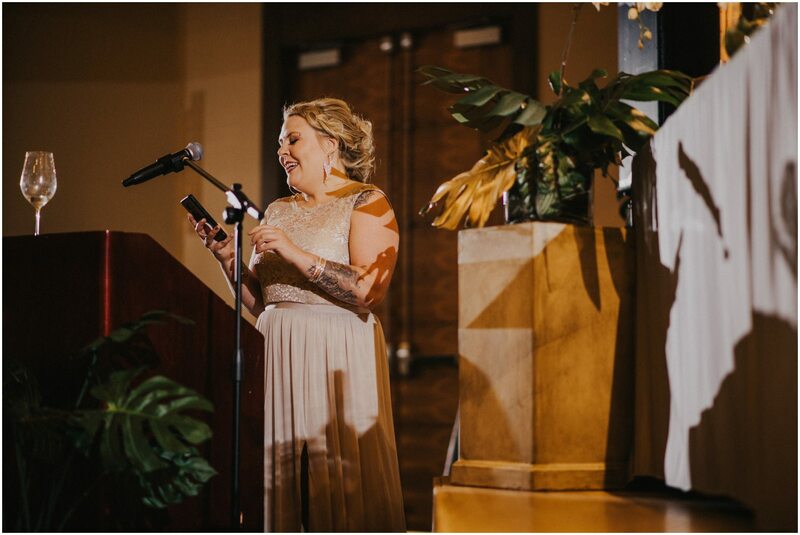 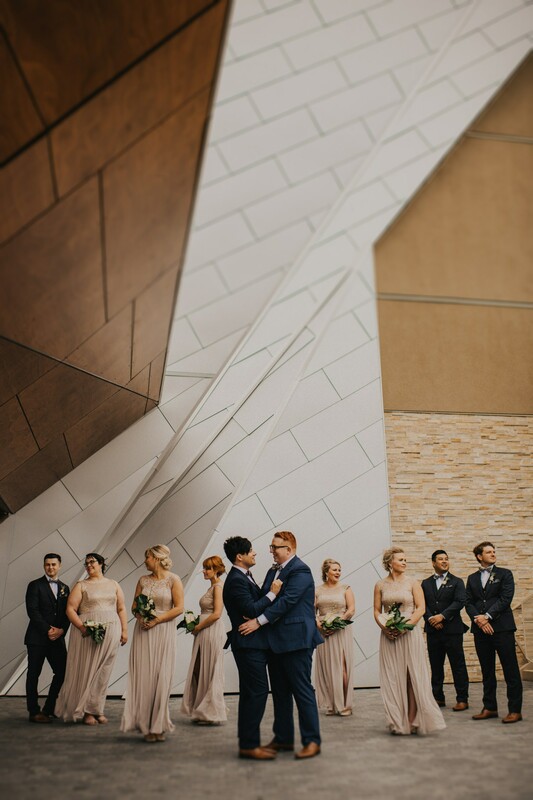 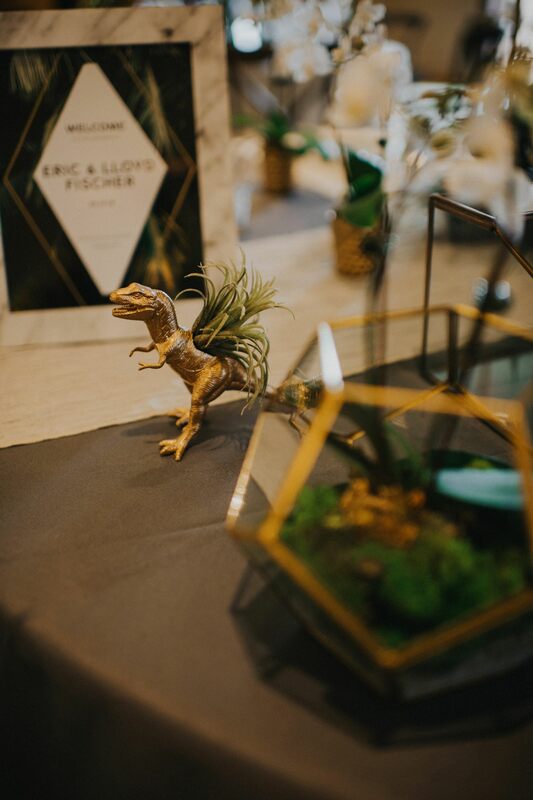 These two had gotten engaged in a dinosaur museum so the team added a touch of dinosaur goodness through-out the reception room to bring every detail together perfectly! 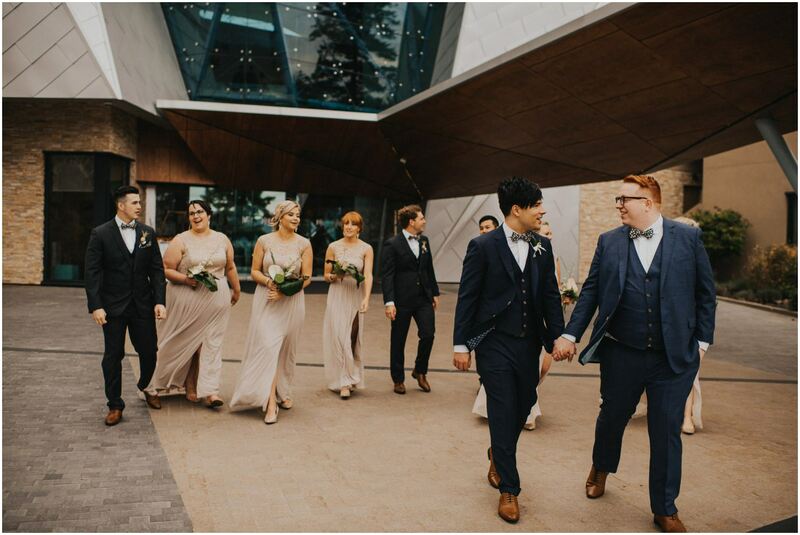 I could endlessly go on raving about it all but I’ll let the photos do the talking! 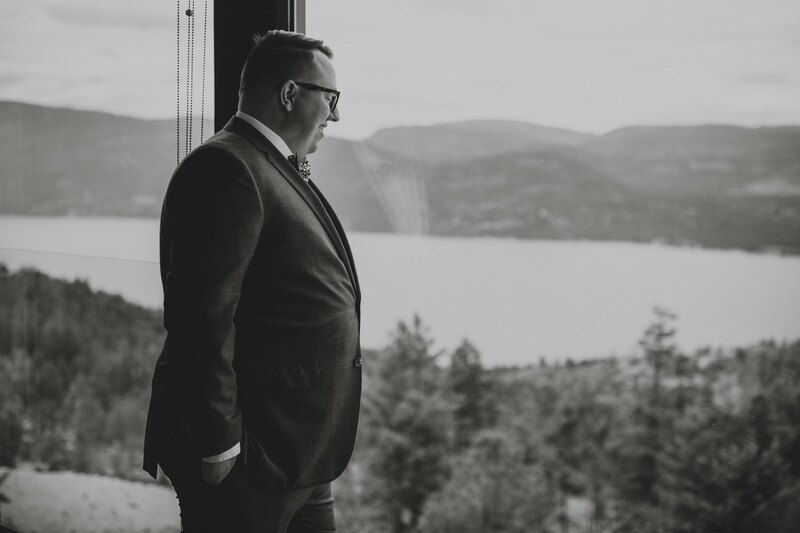 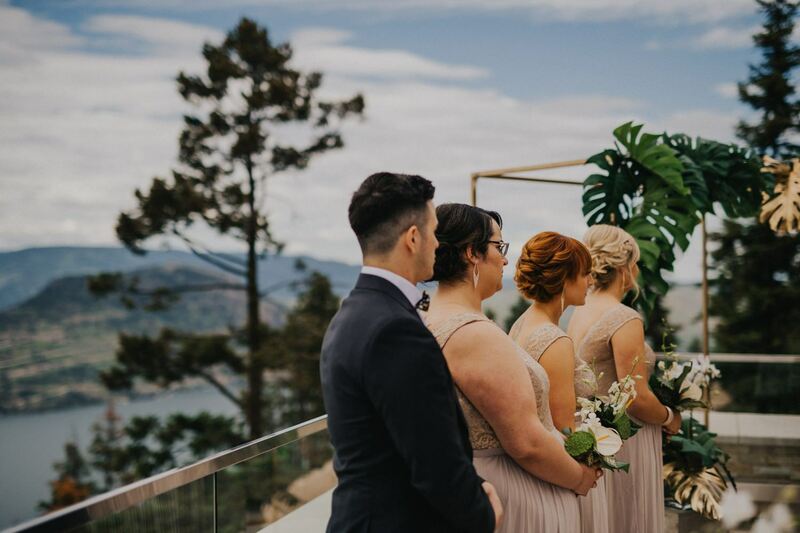 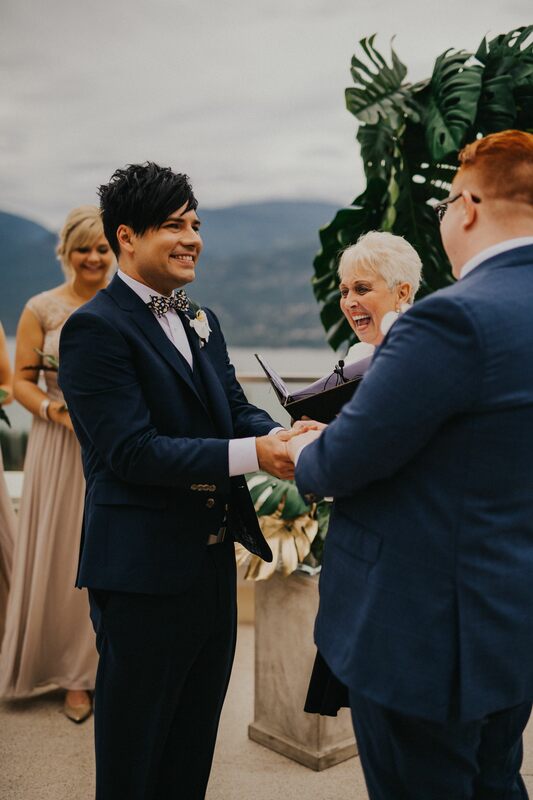 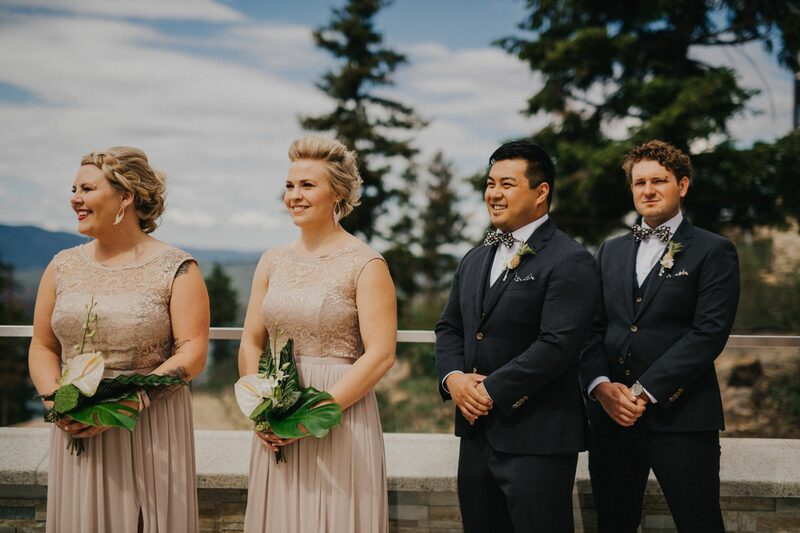 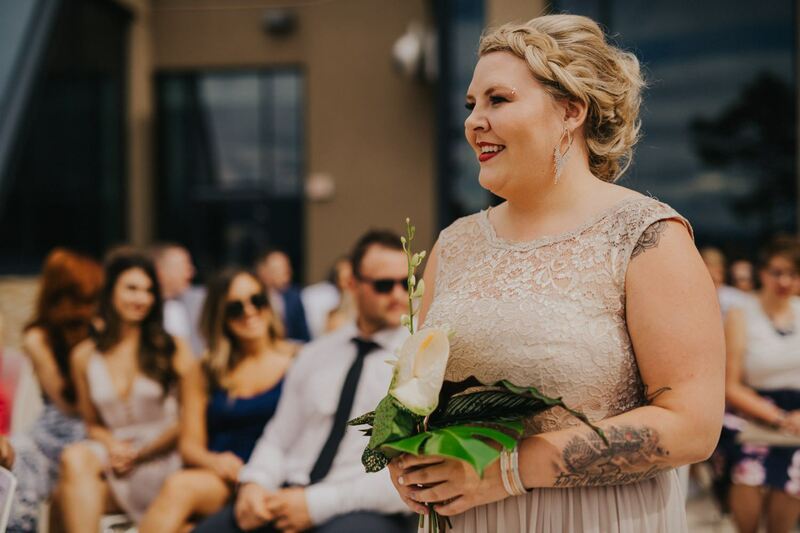 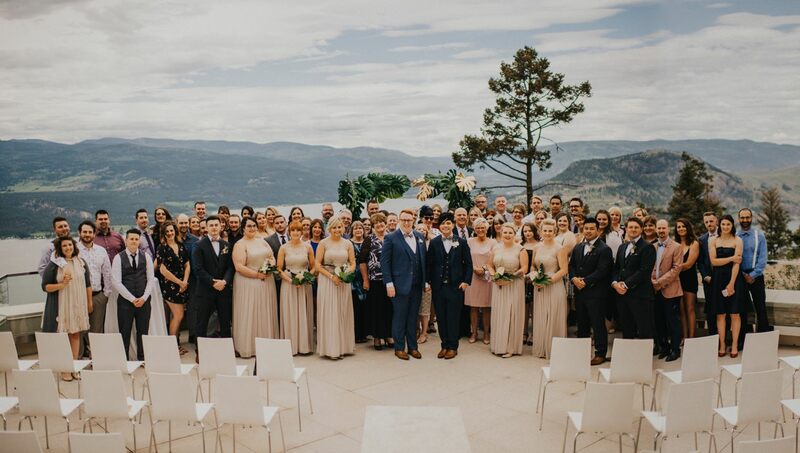 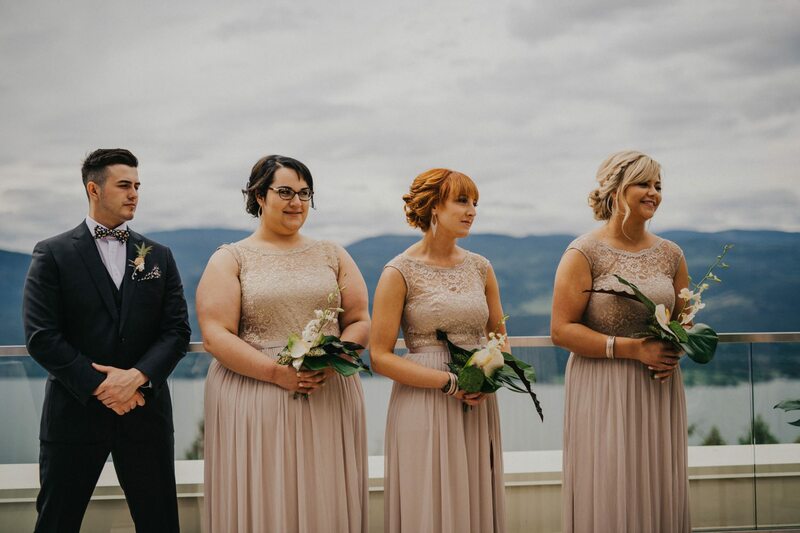 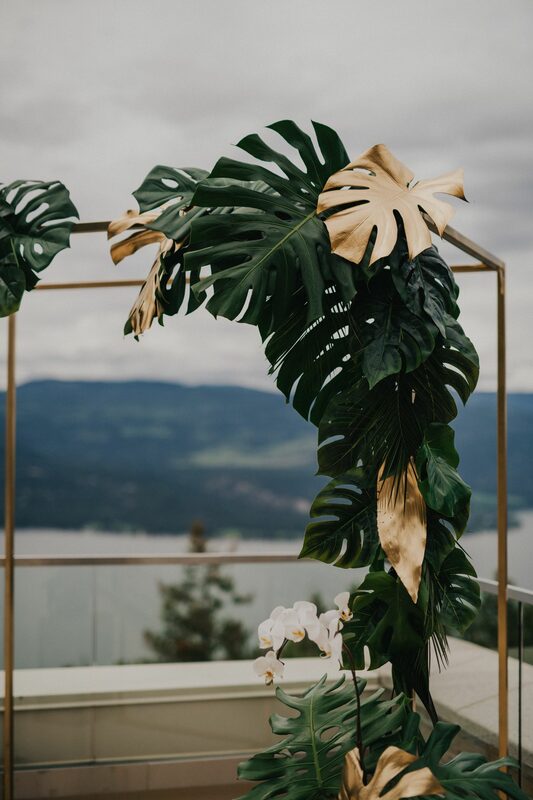 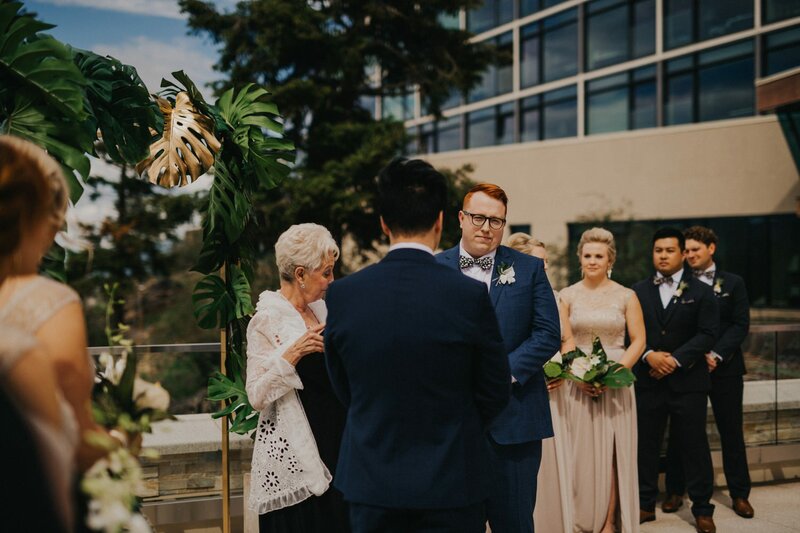 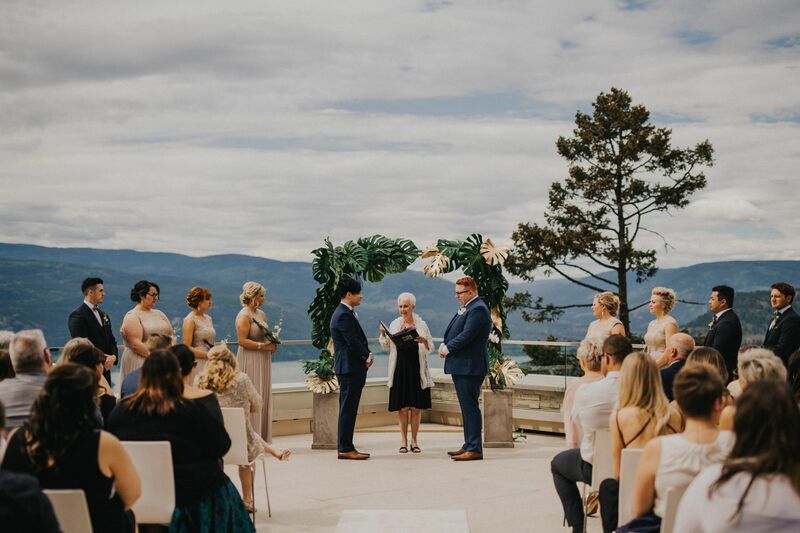 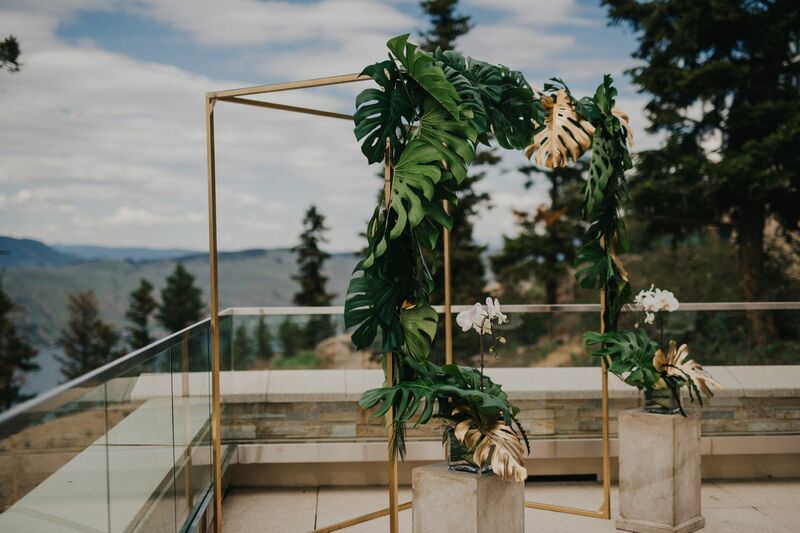 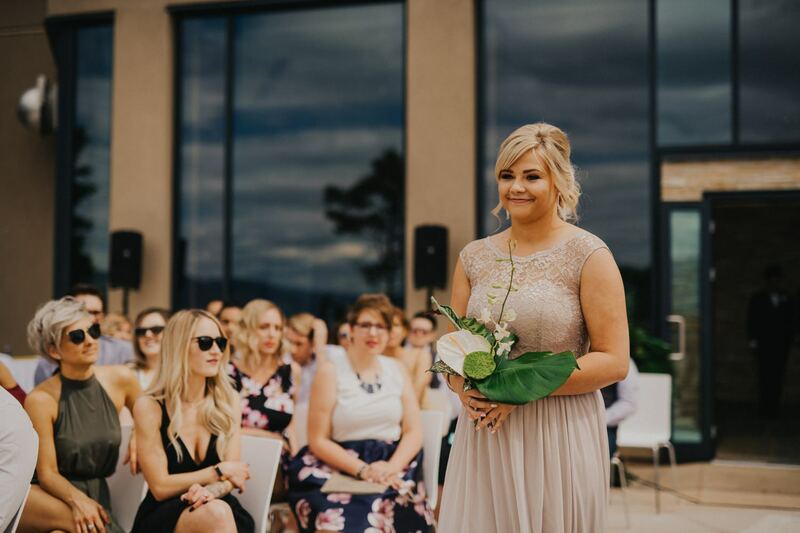 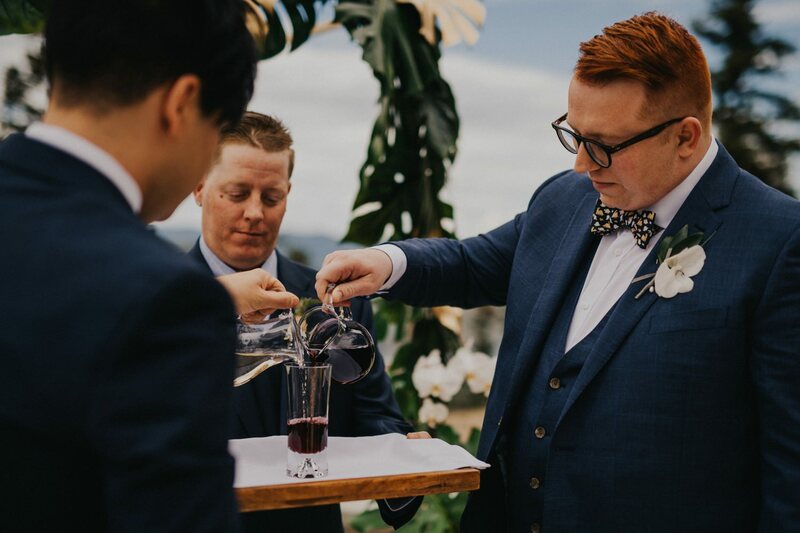 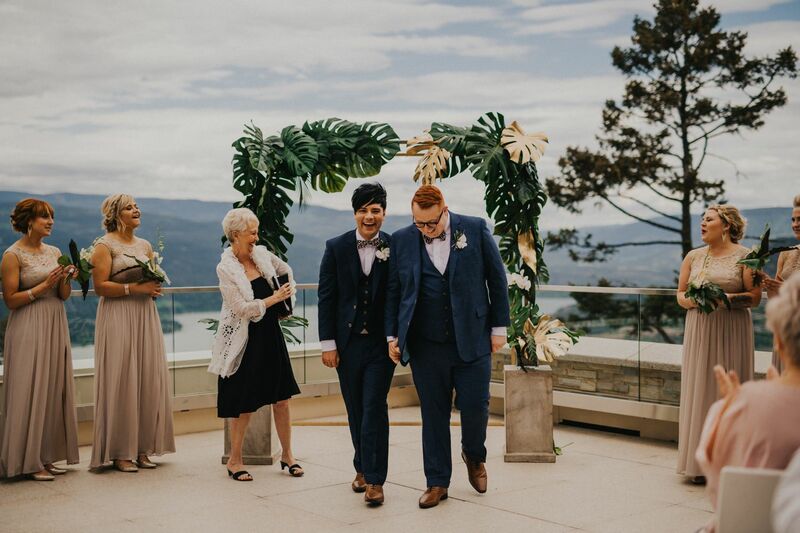 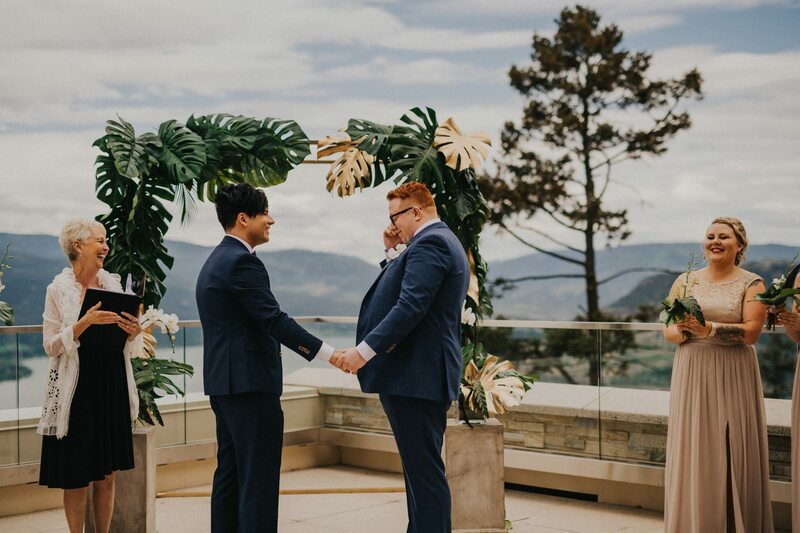 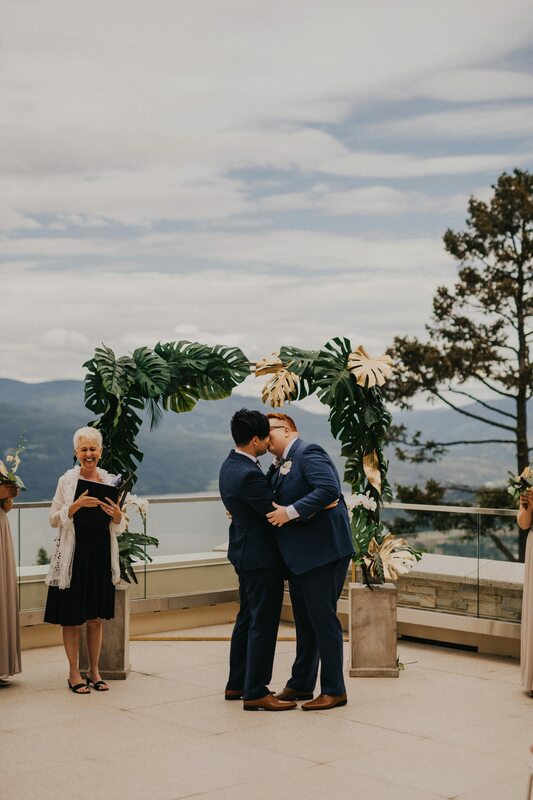 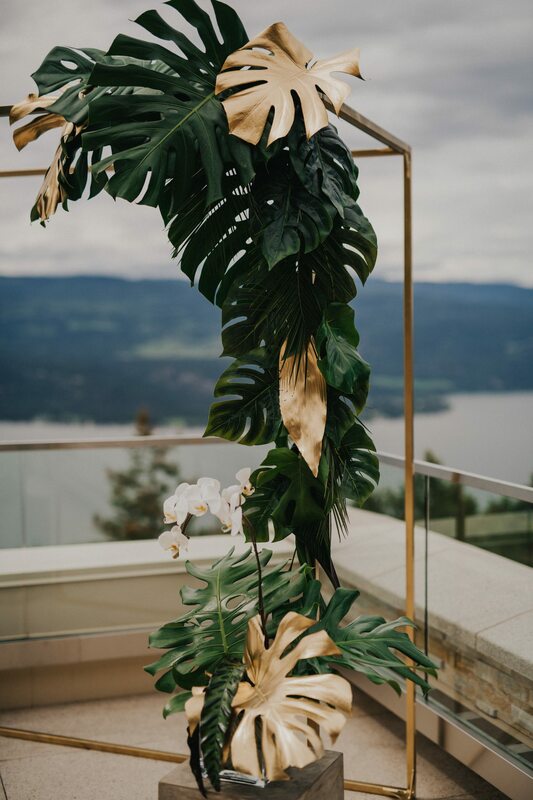 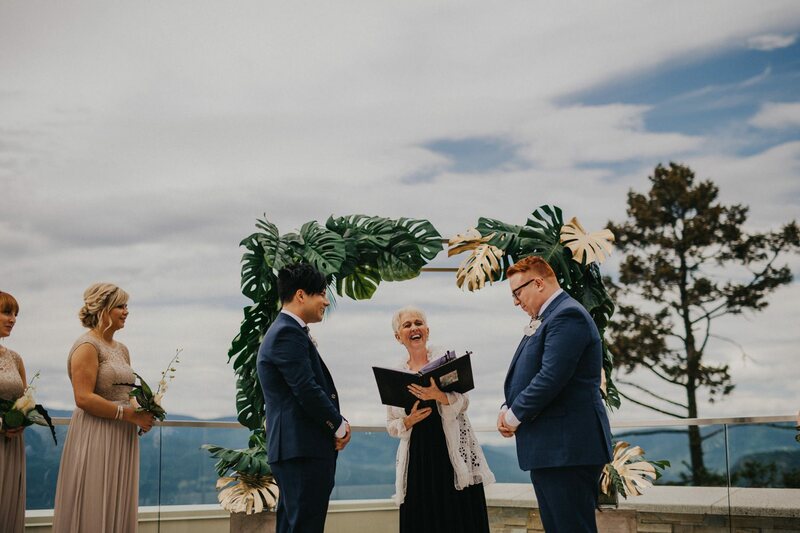 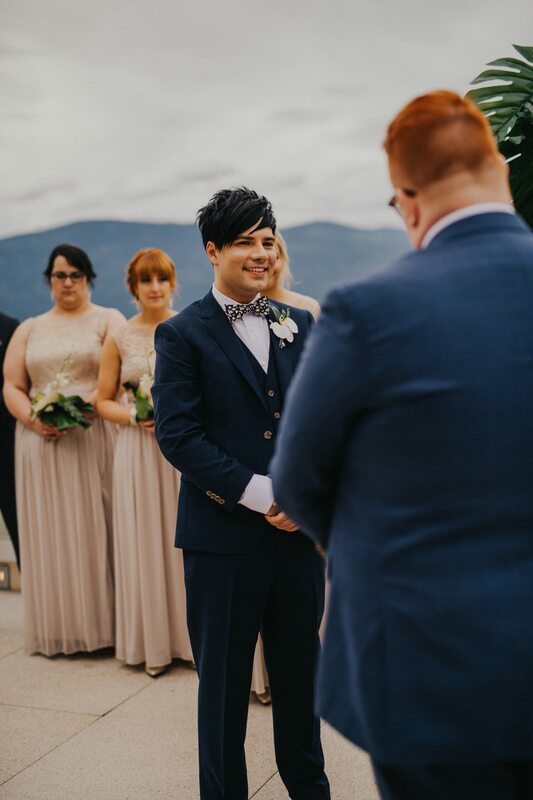 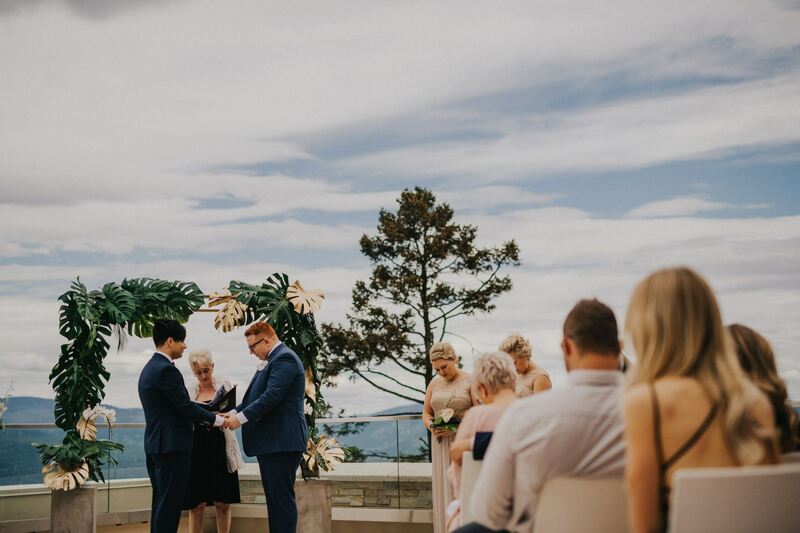 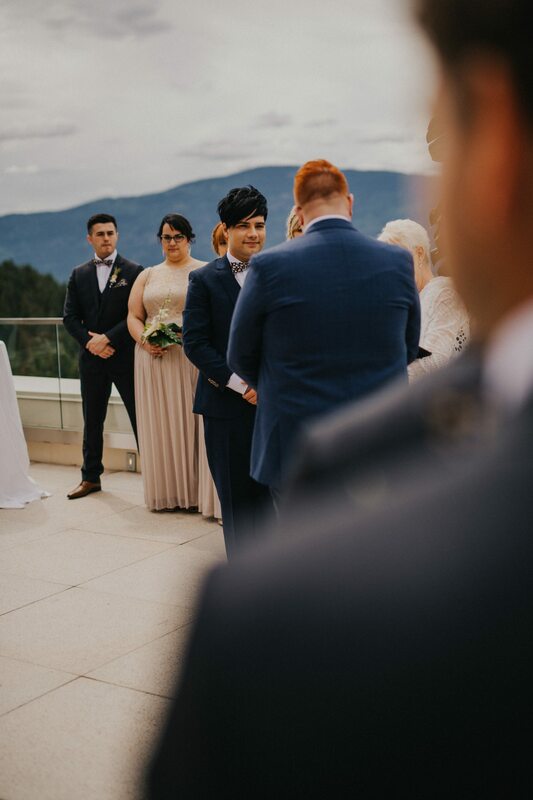 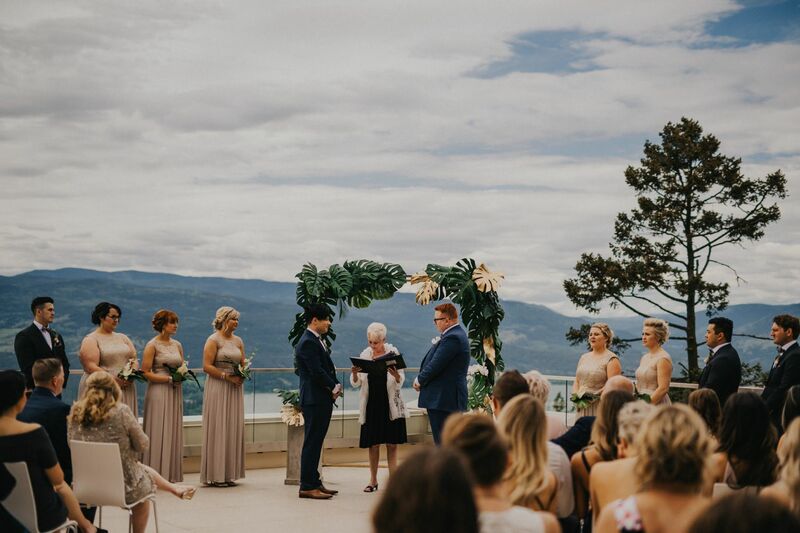 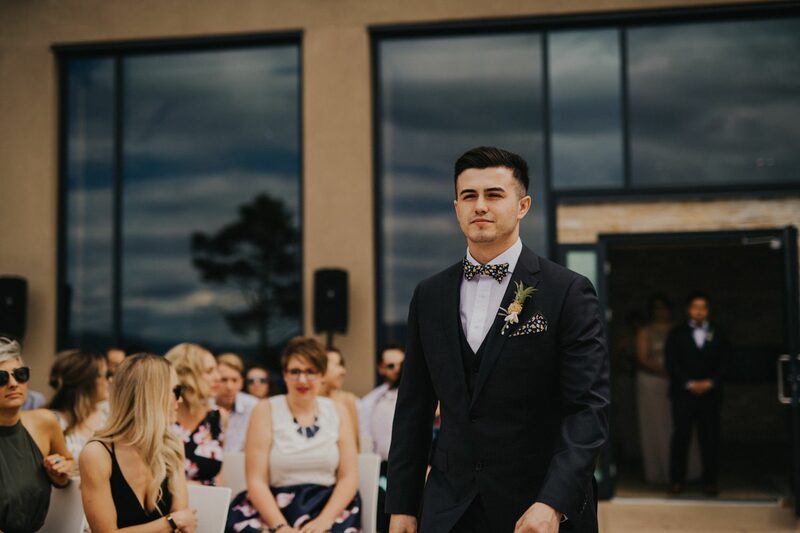 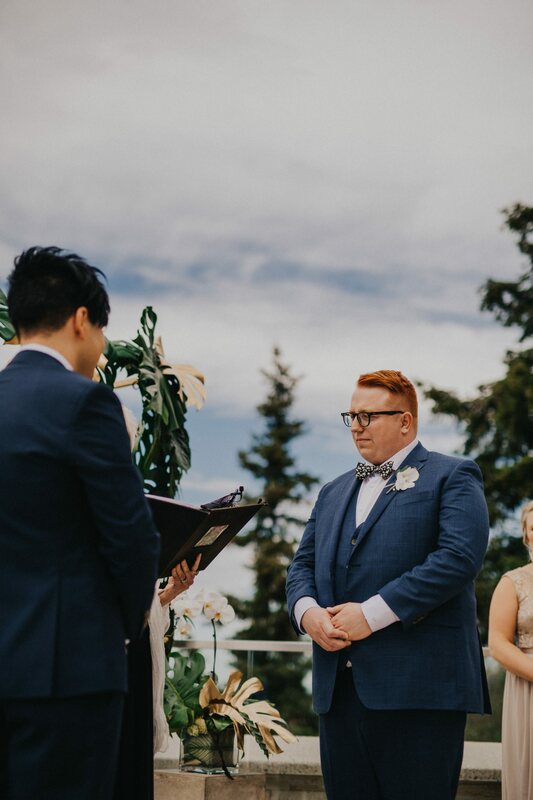 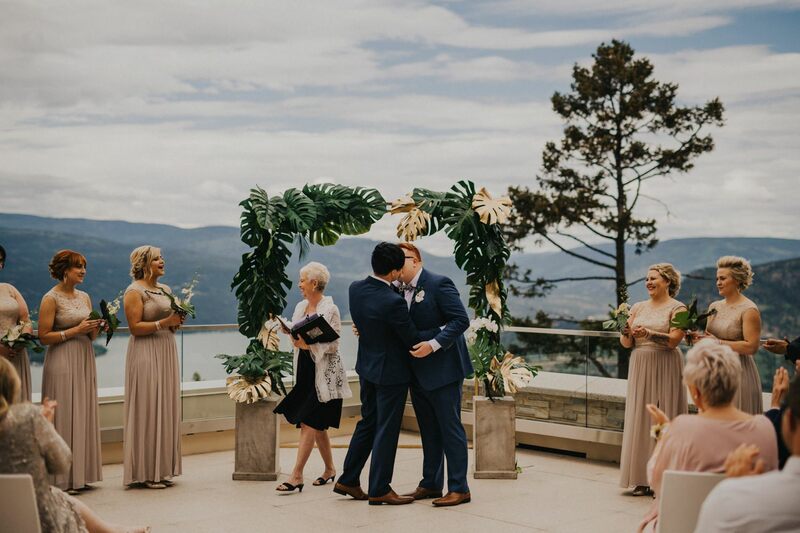 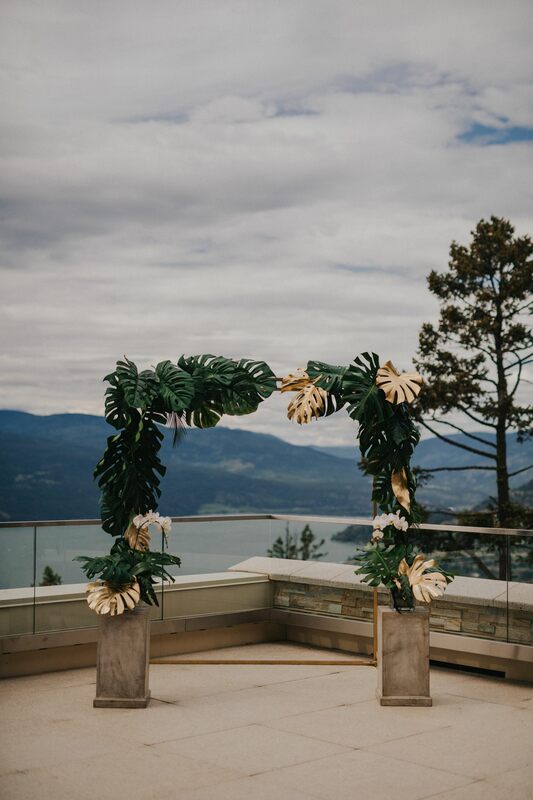 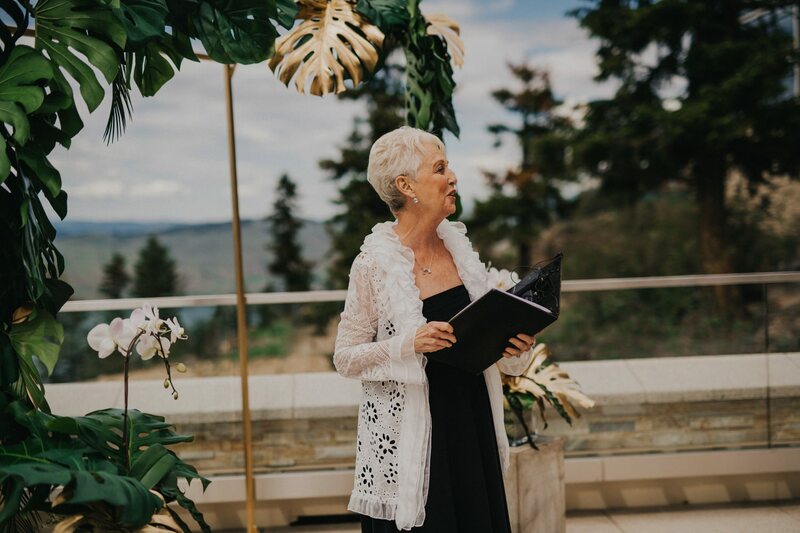 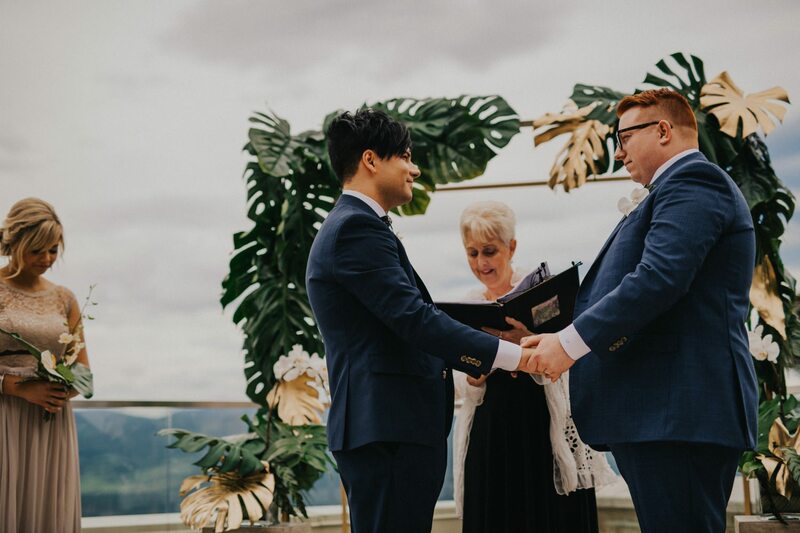 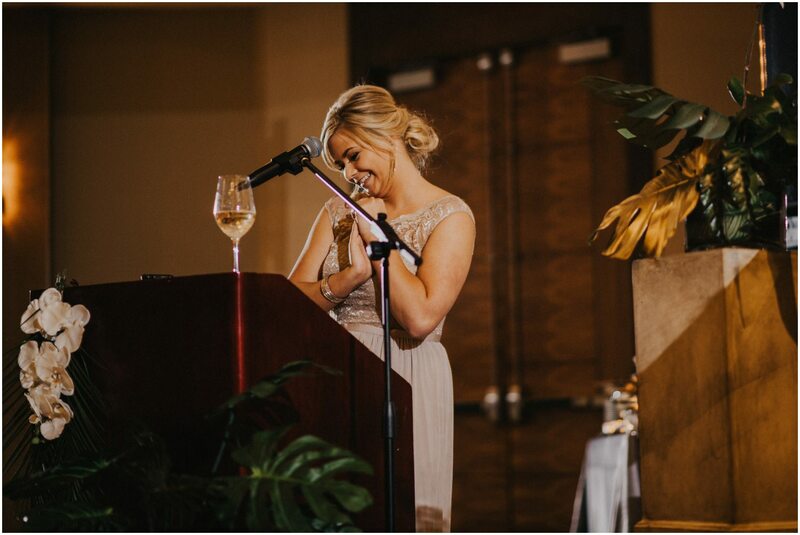 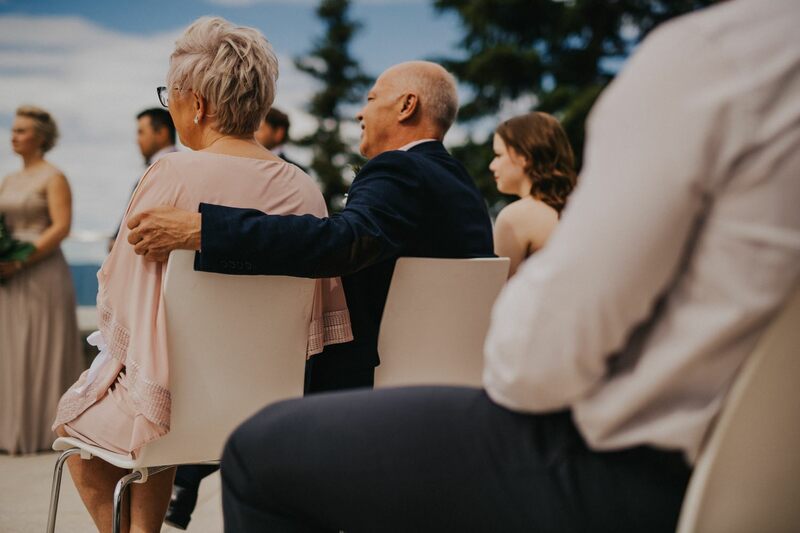 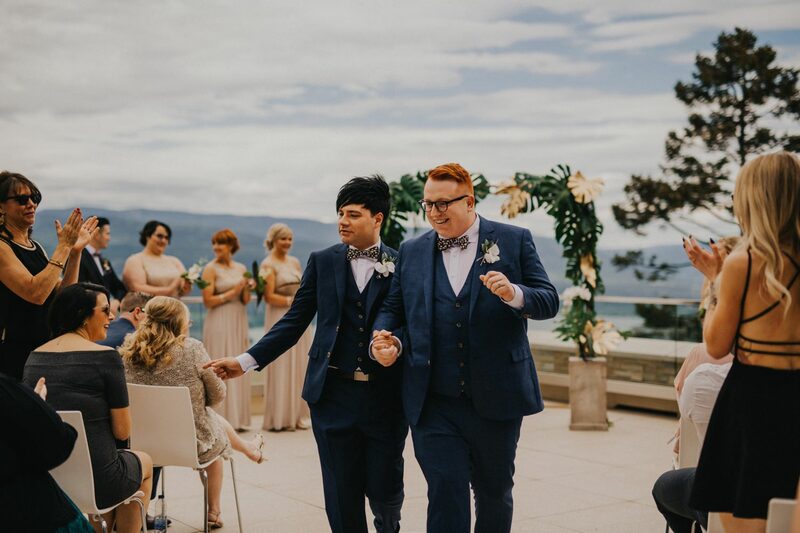 They had a darling ceremony under a gold metal arbour, backed by the Okanagan Valley view! 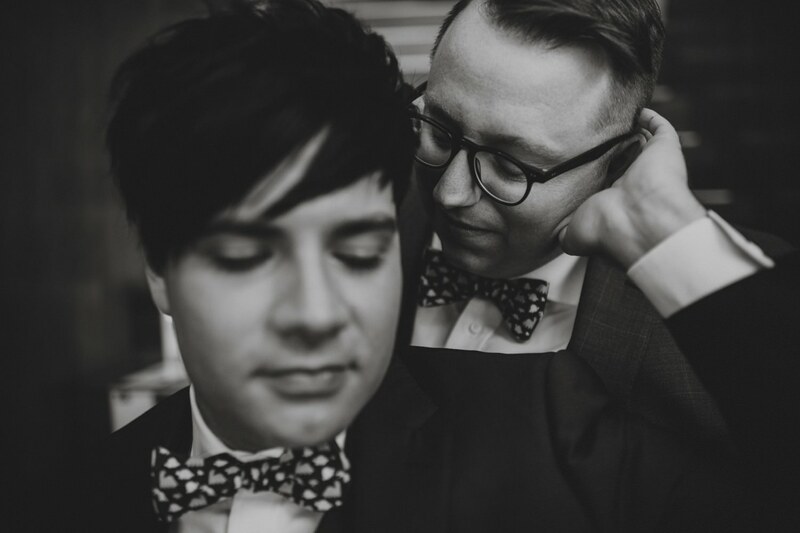 The love in their eyes as Lloyd and Eric said I do brought all of the feels. 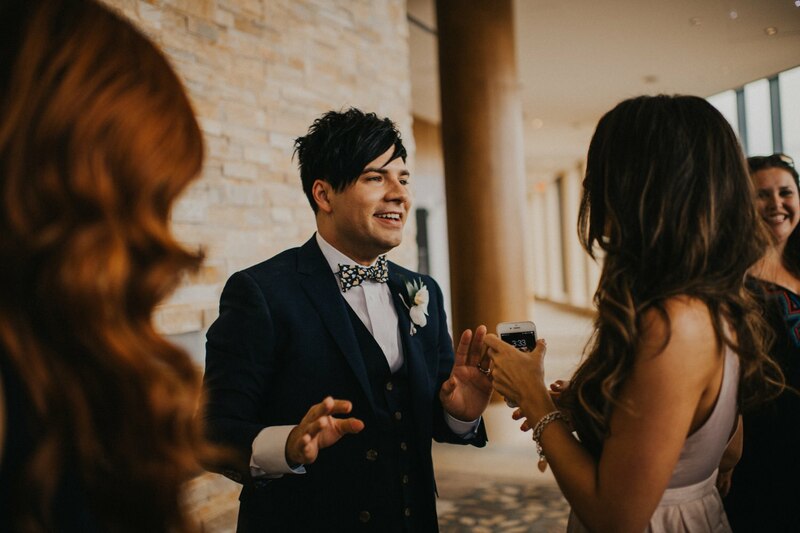 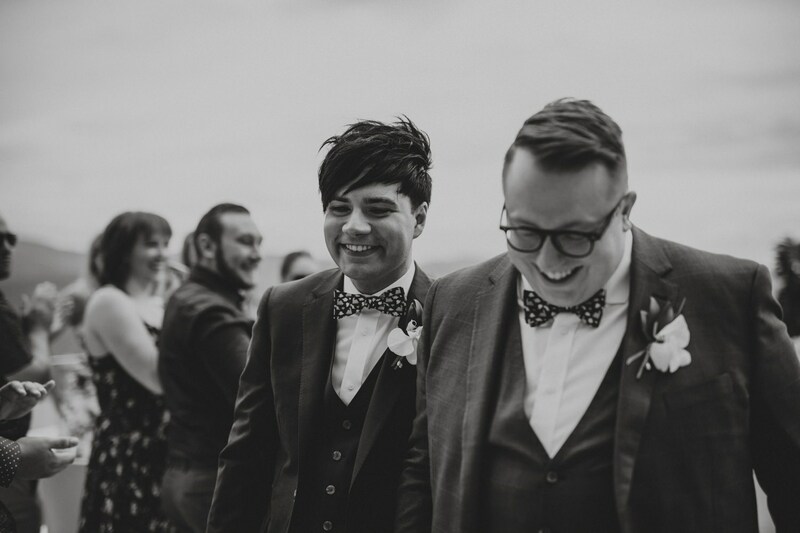 These two walked down the aisle hand in hand with full smiles once they tied the knot! 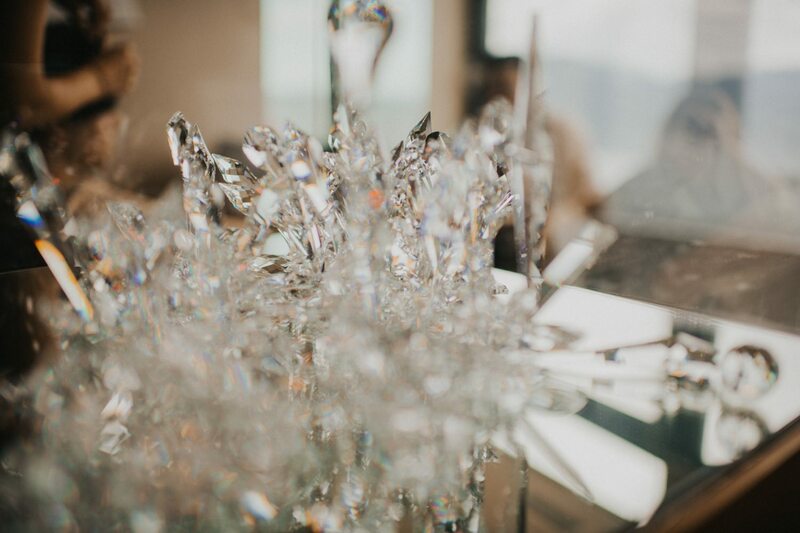 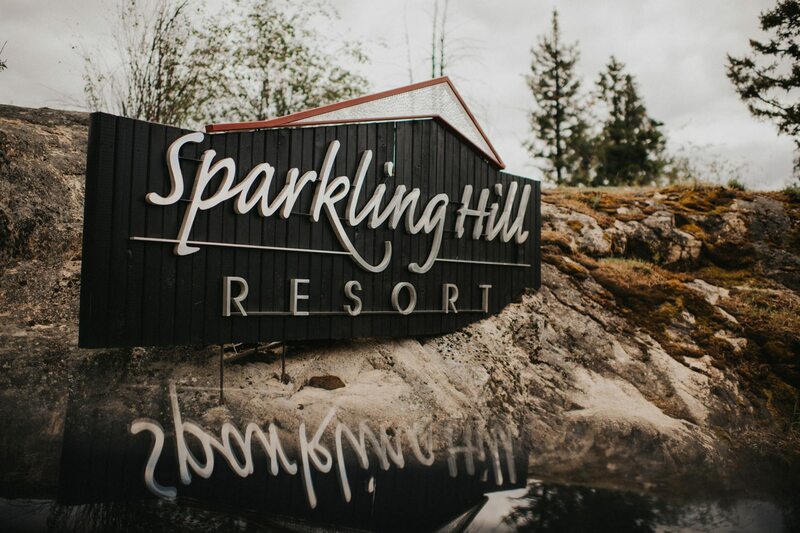 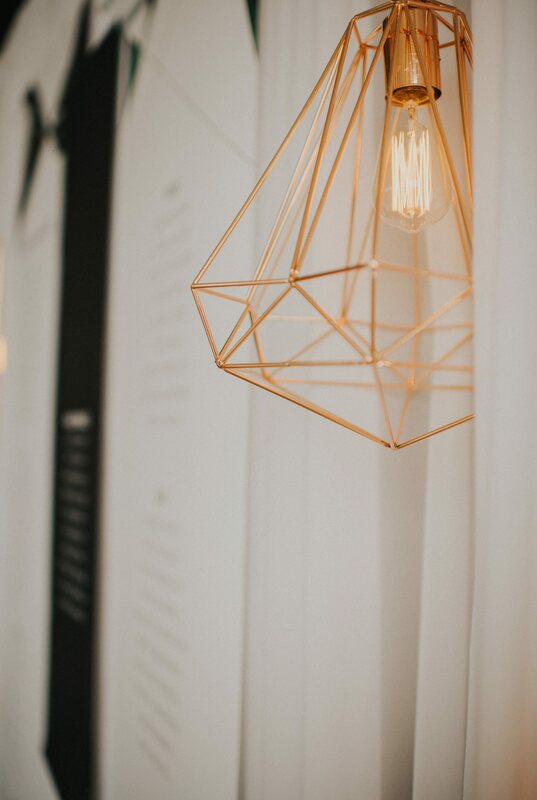 We then adventured around Sparkling Hill Resort capturing the edgy architectural shapes that make this location oh so stunning. 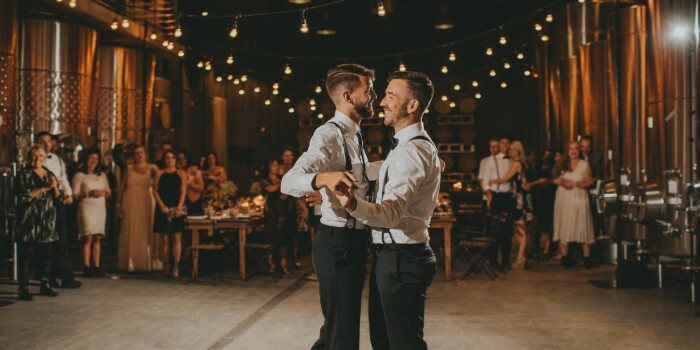 The way these two hold each other brings a sense of full fledged meant to be. 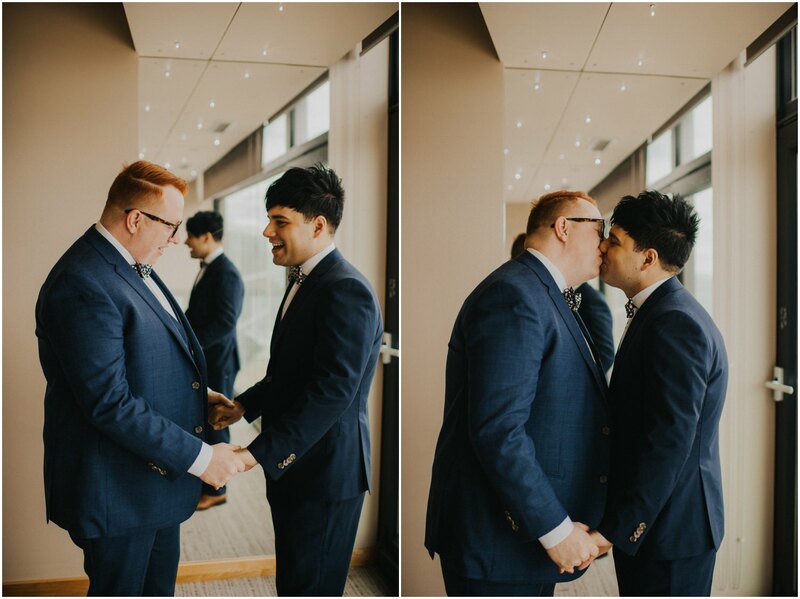 Photographing them and their connection was truly an honour! 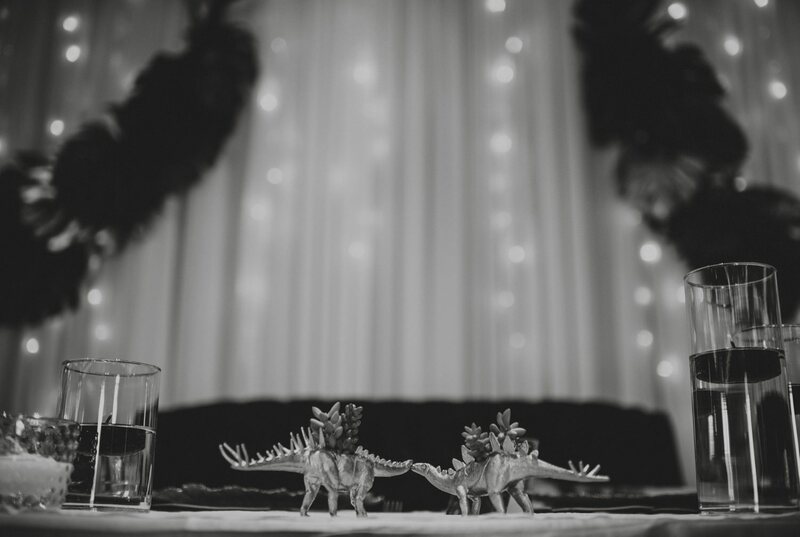 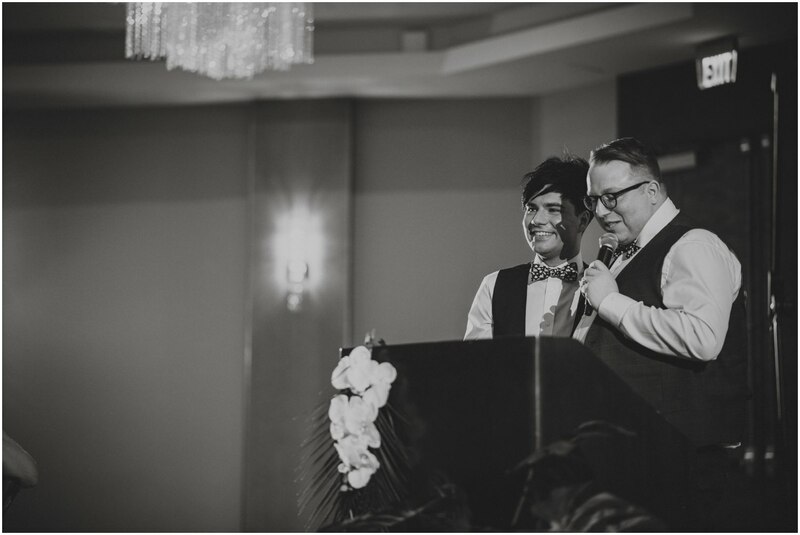 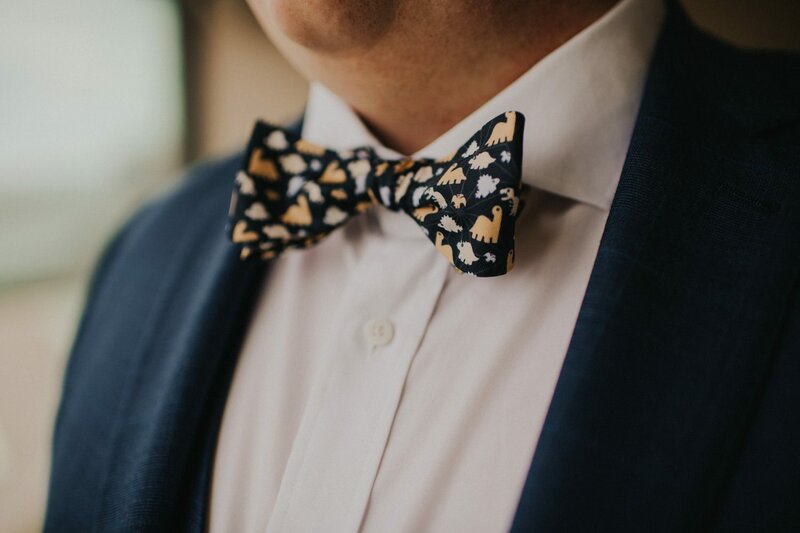 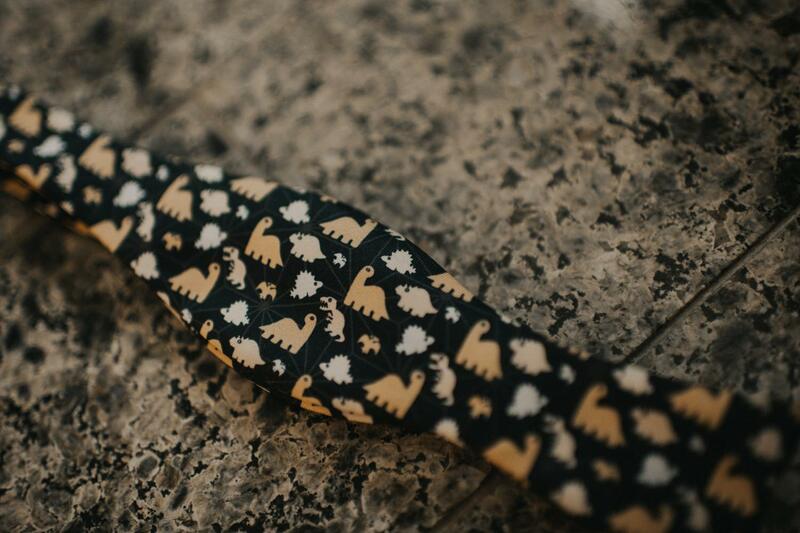 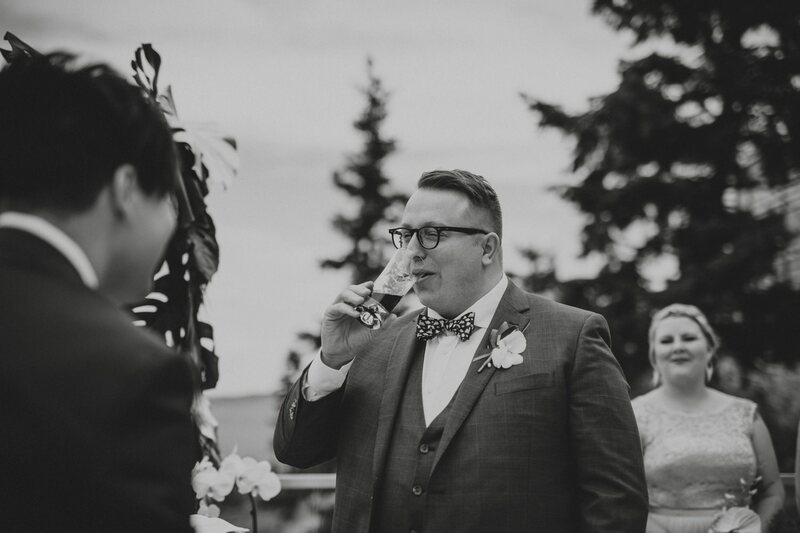 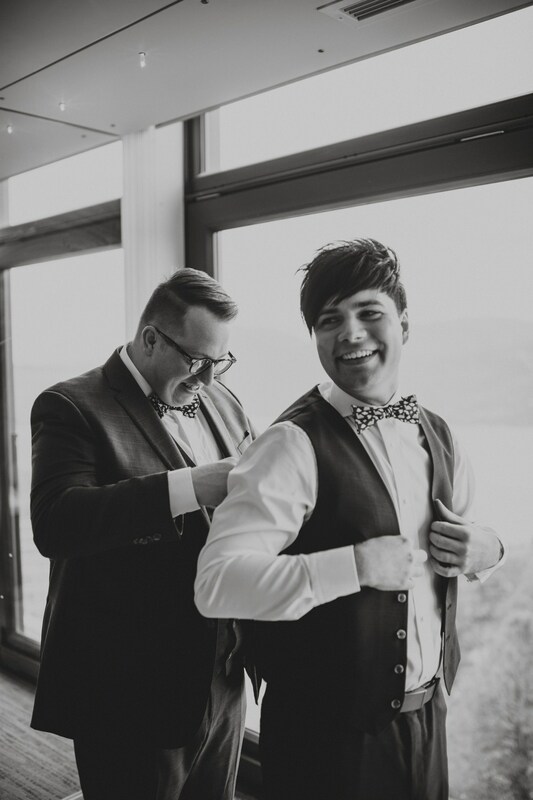 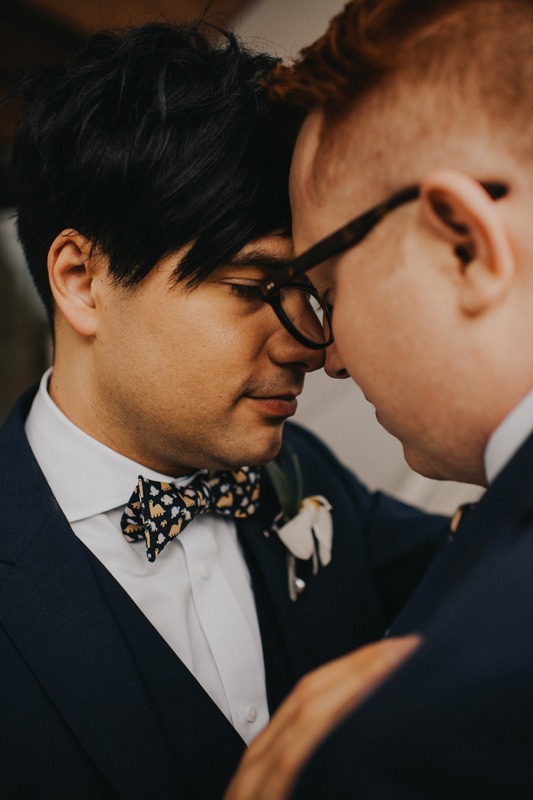 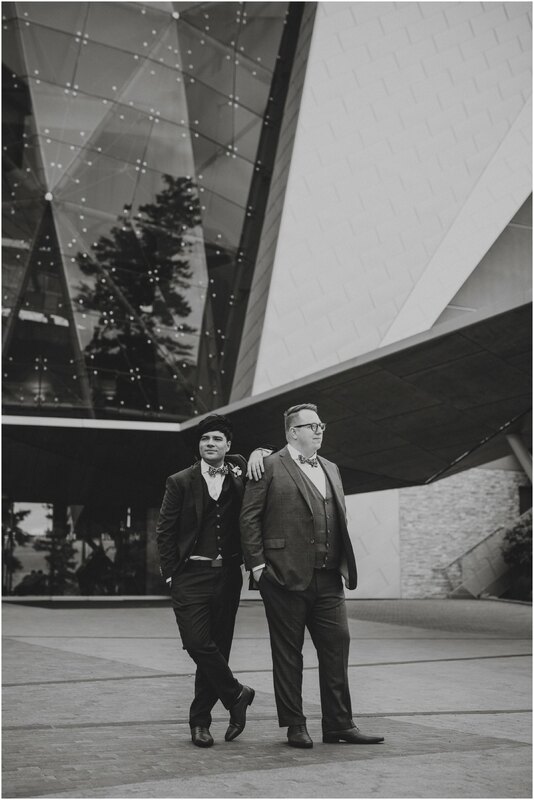 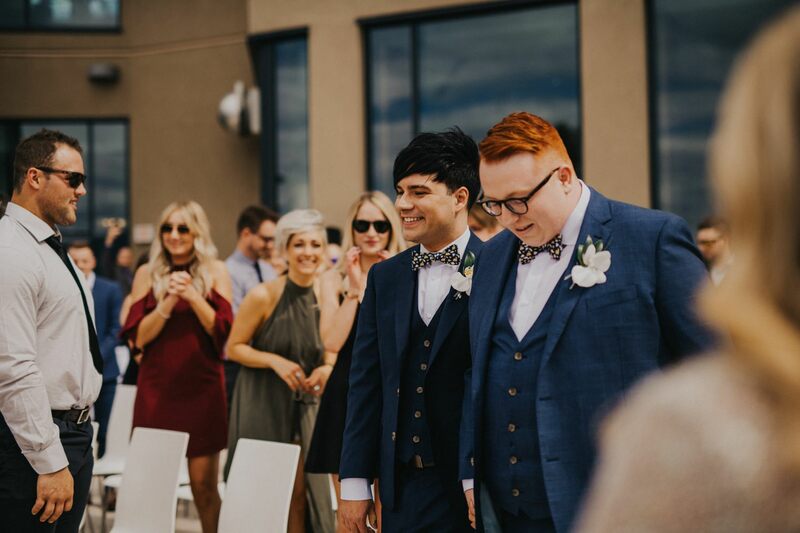 With custom made dinosaur bowties that Lloyd created to top off their suits, they were looking as dapper as ever through-out it all! 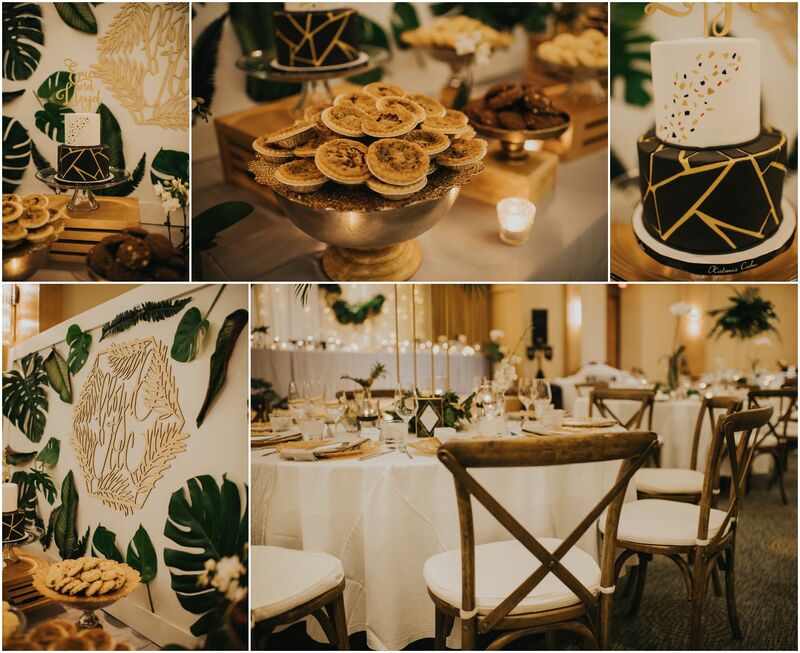 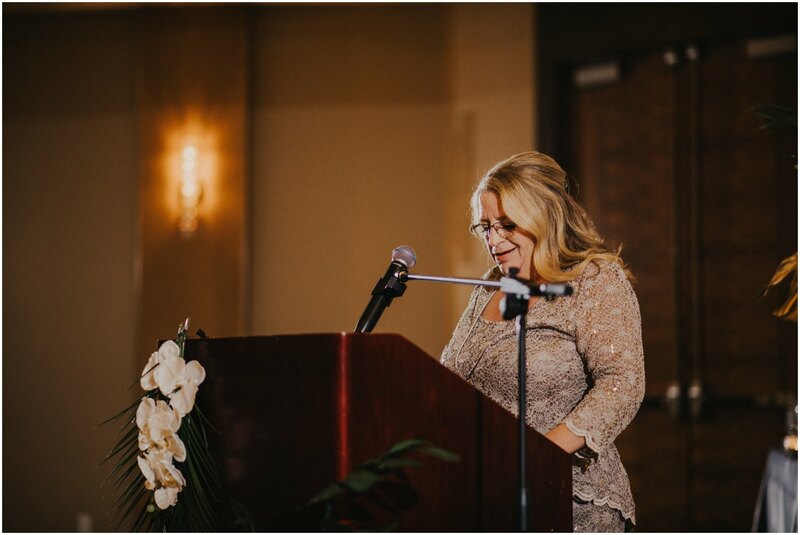 The evening brought on heart filled speeches, laughs and tears, and delicous goodness from Kaleena Cakes with a desert table to die for. 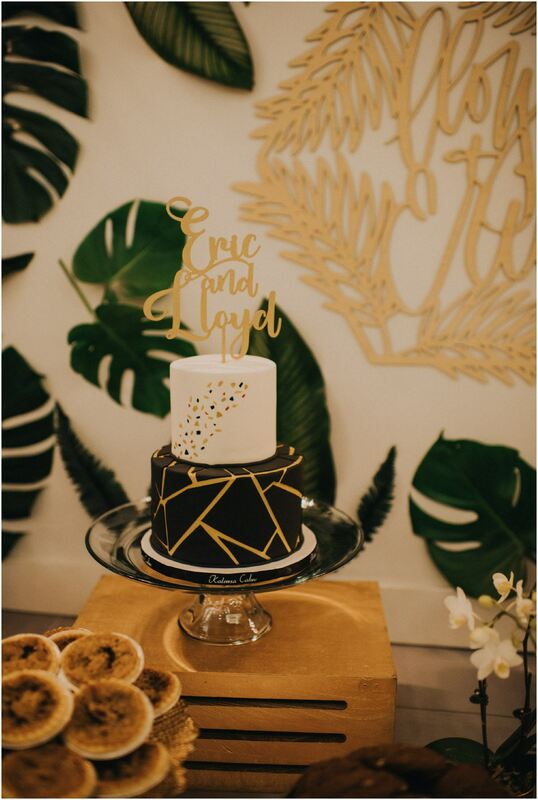 She created a geometric cake to embrace the shapes that we shot with at Sparkling Hill Resort. 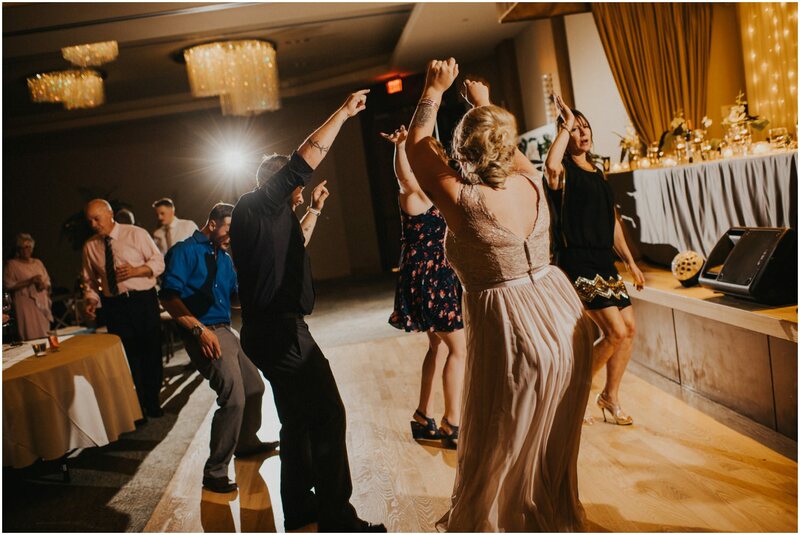 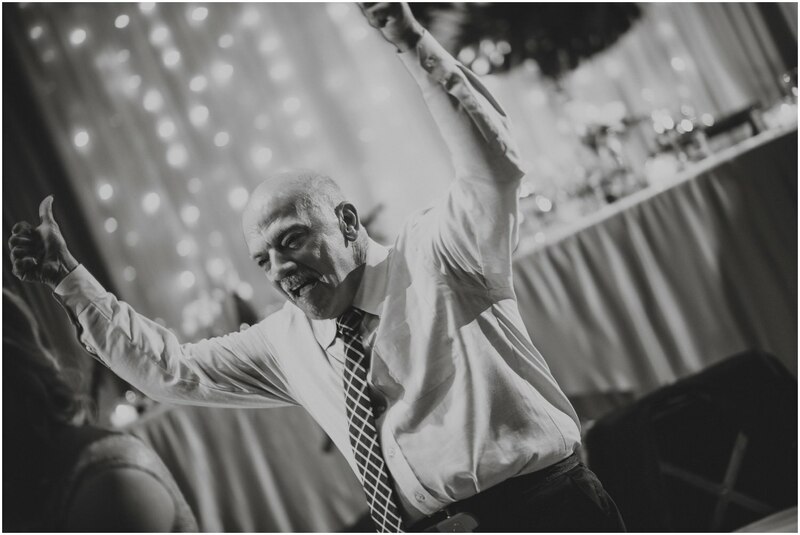 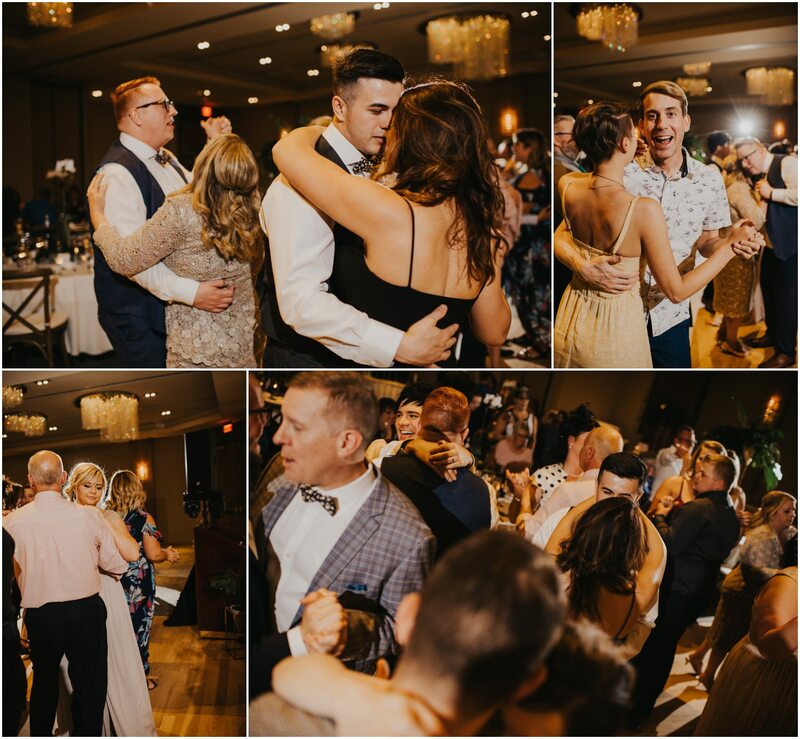 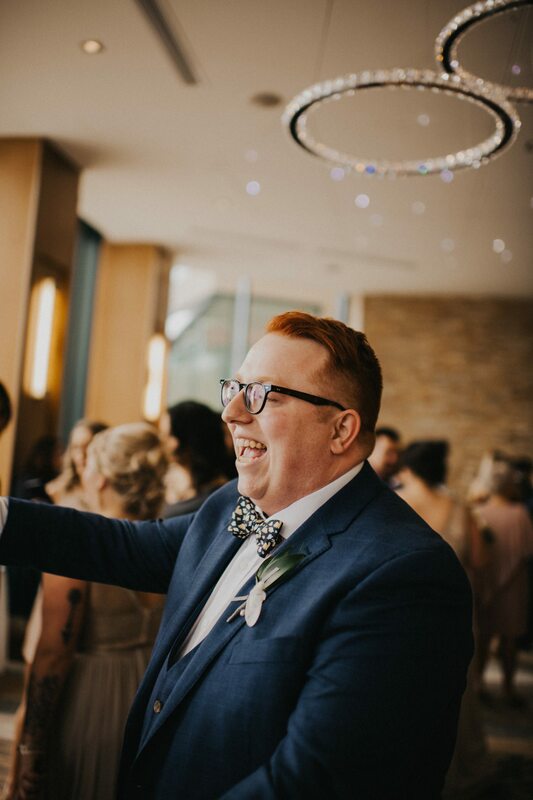 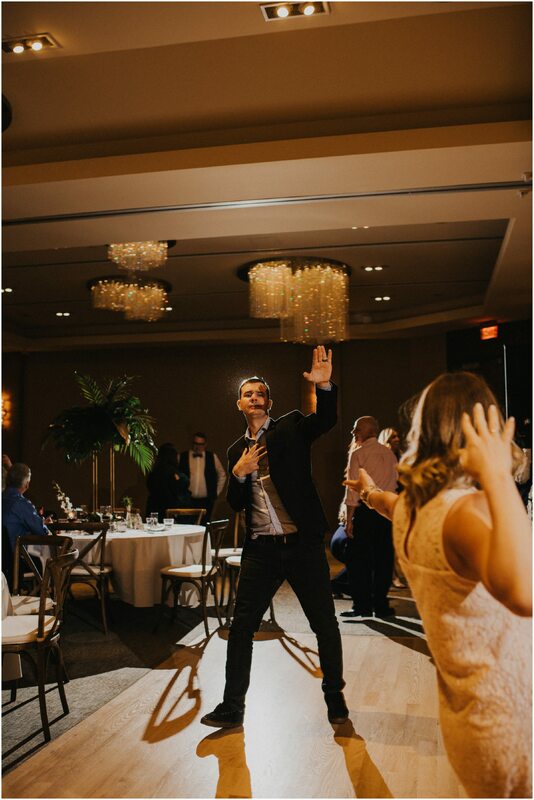 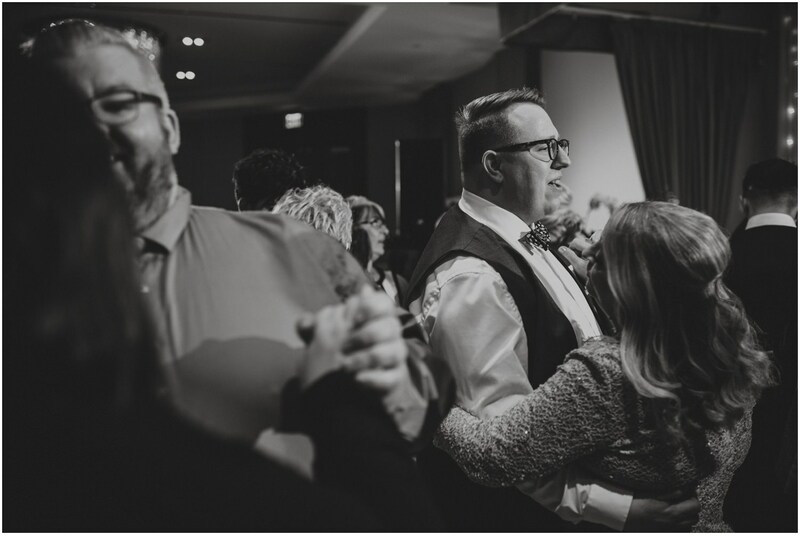 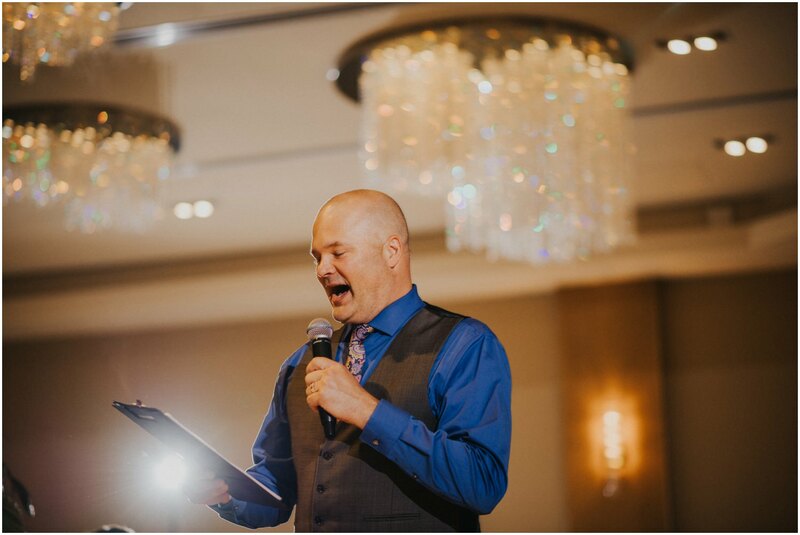 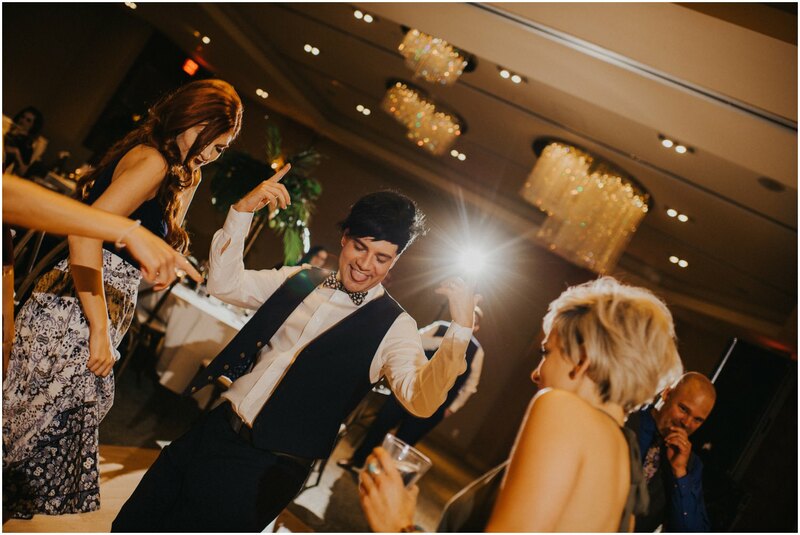 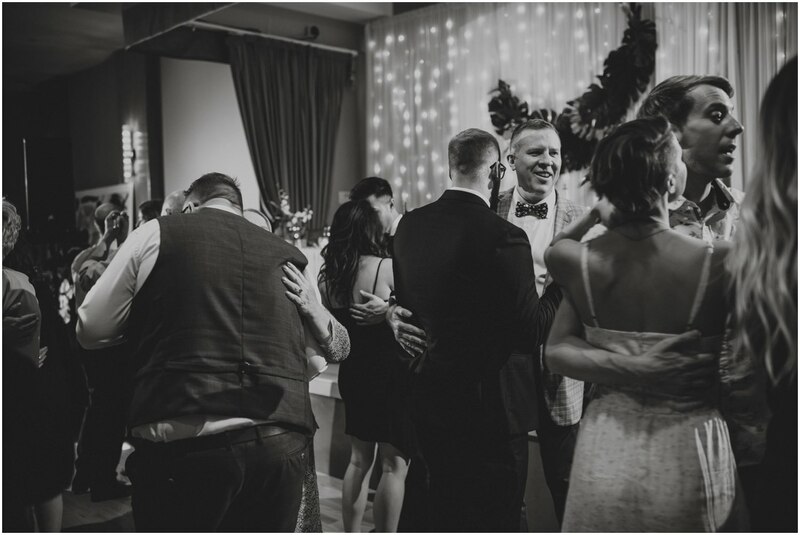 DJ Haymaker brought life to the dance floor as always to end off a stellar wedding day! 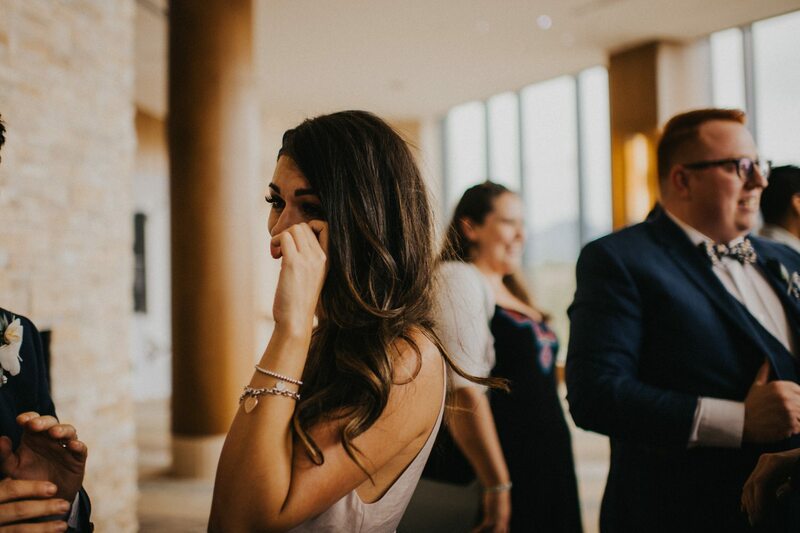 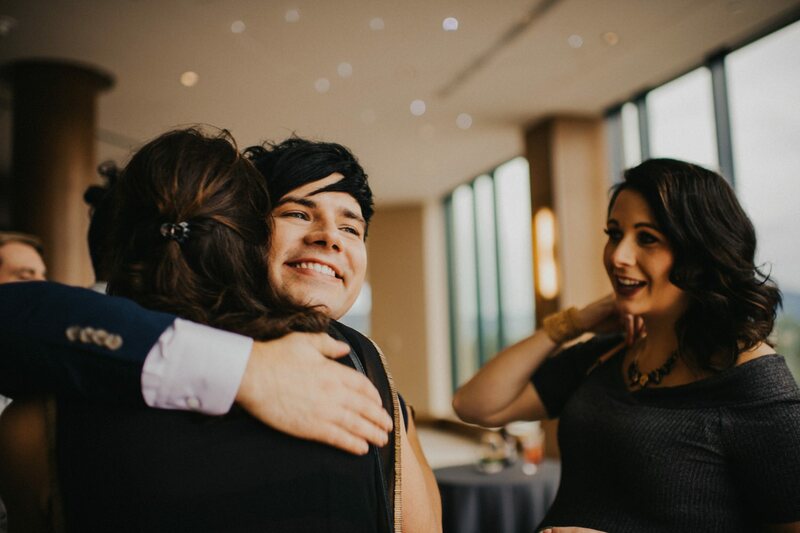 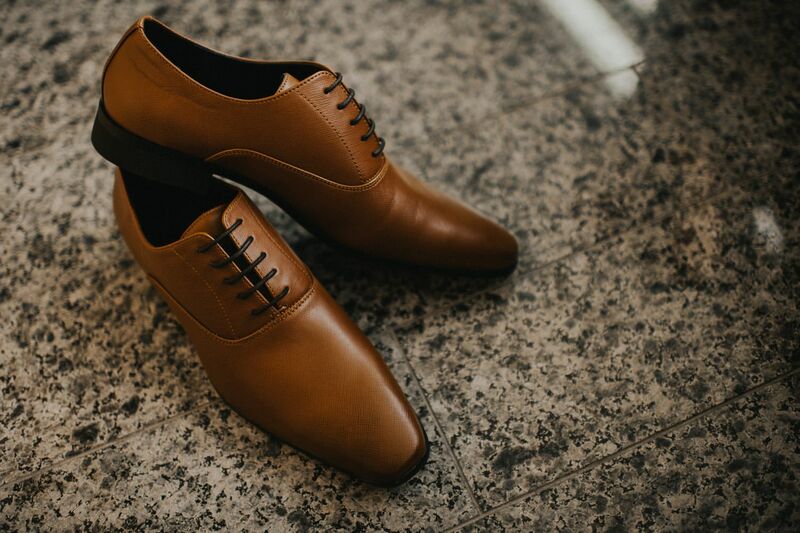 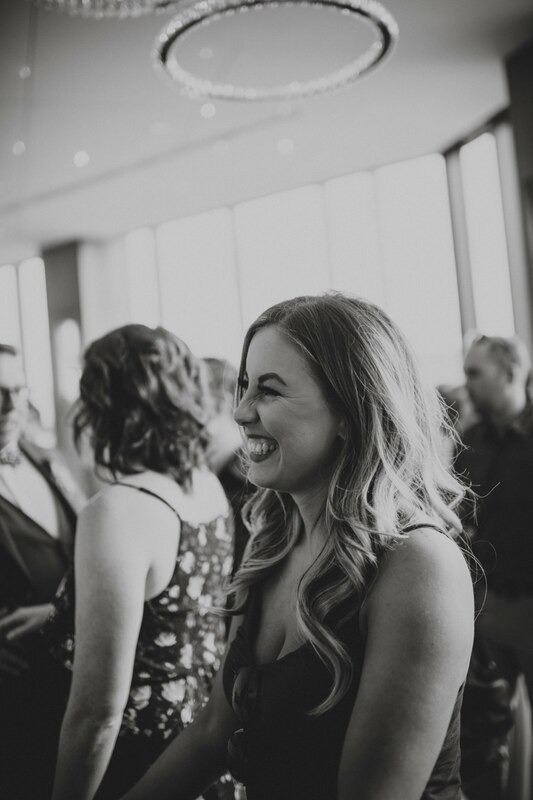 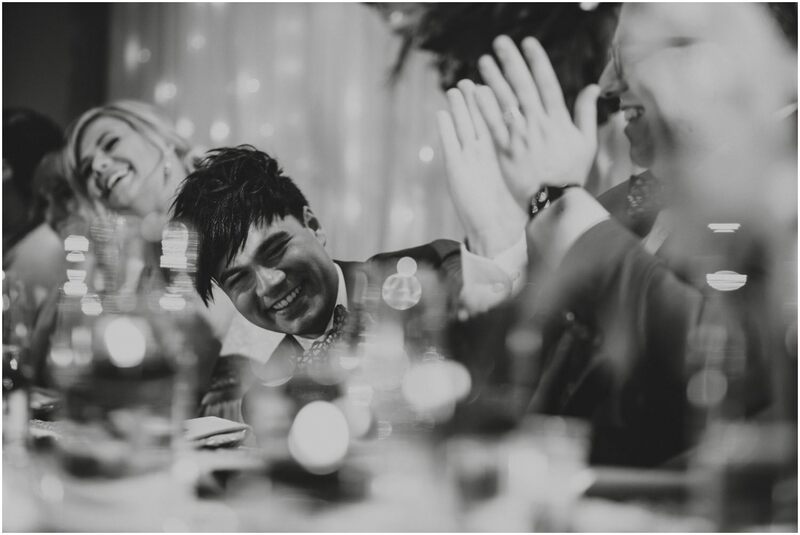 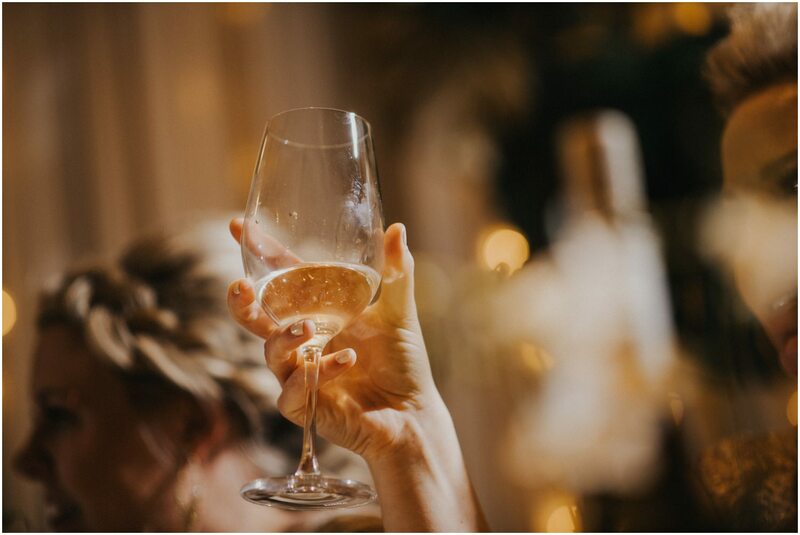 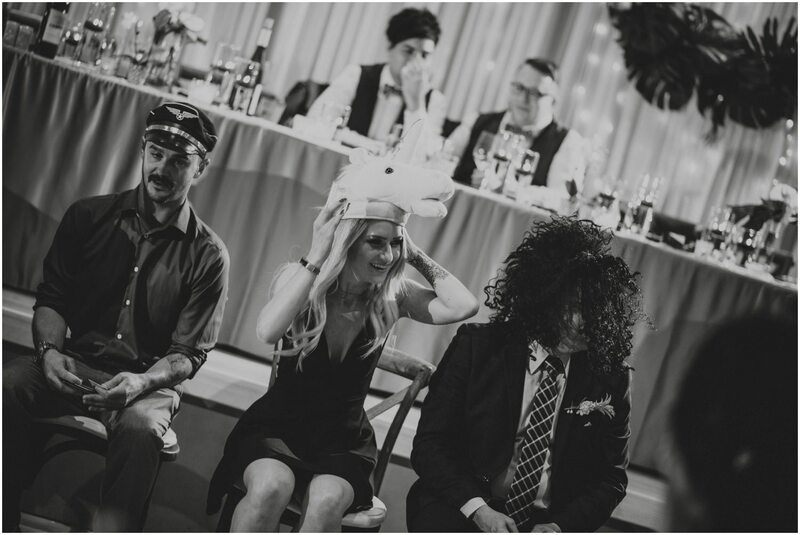 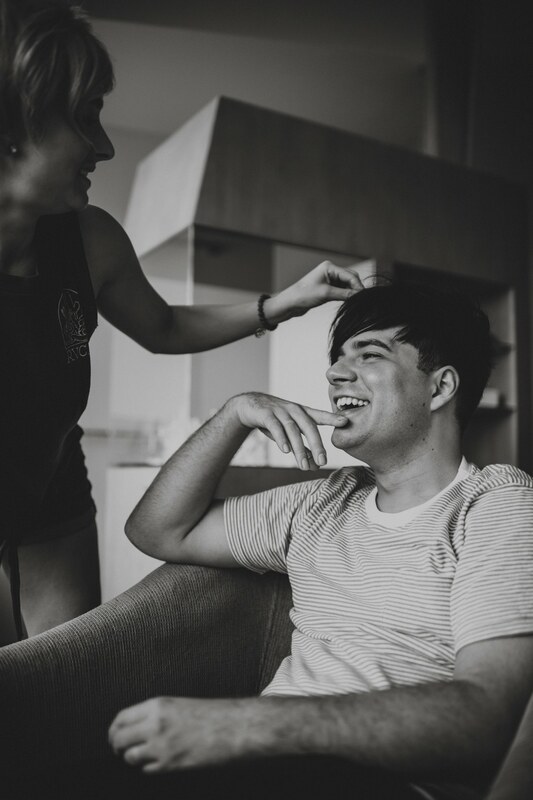 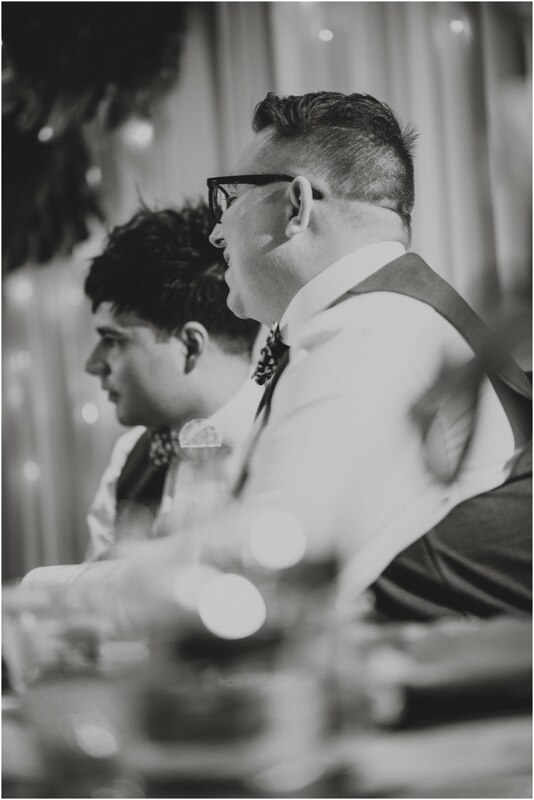 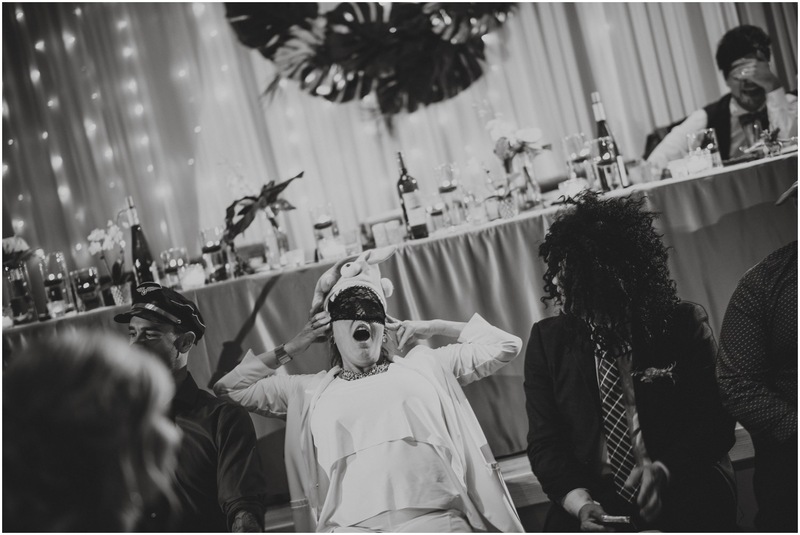 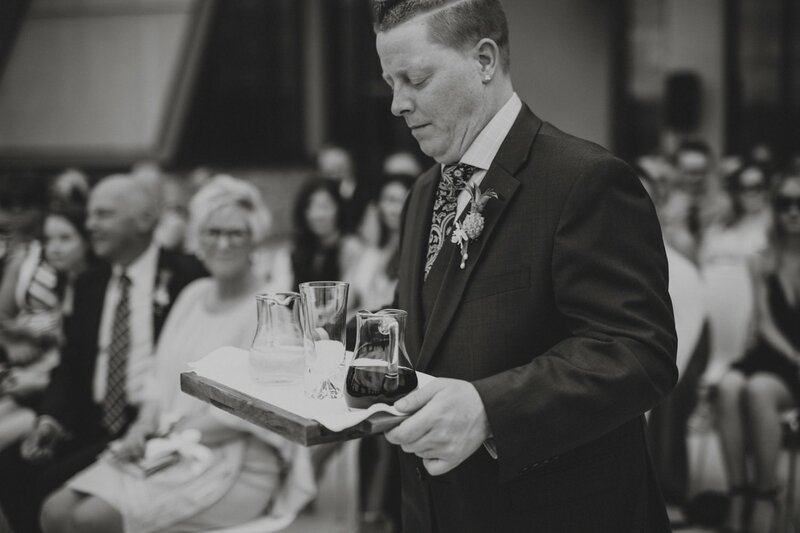 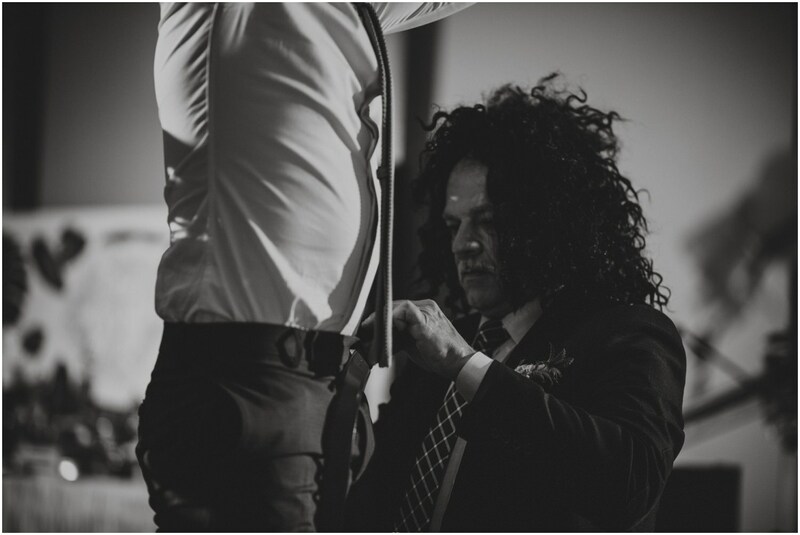 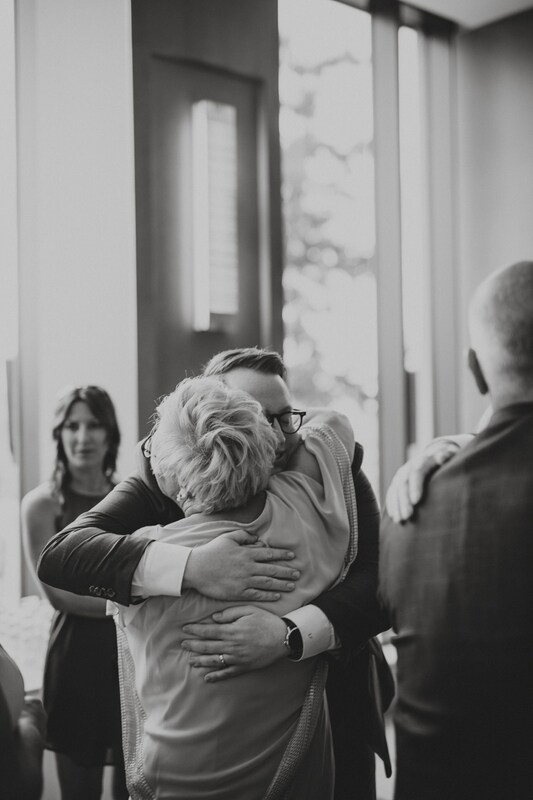 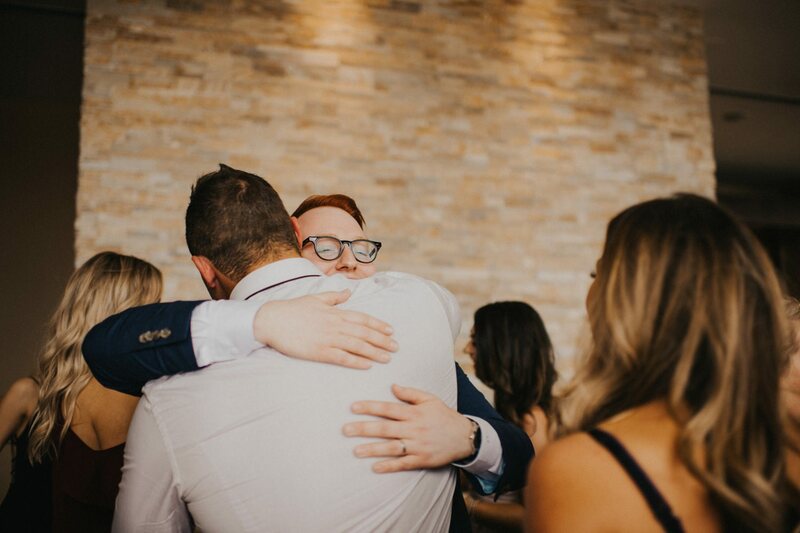 I definitely left this wedding feeling beyond grateful to have been a part of it all let alone photograph it. 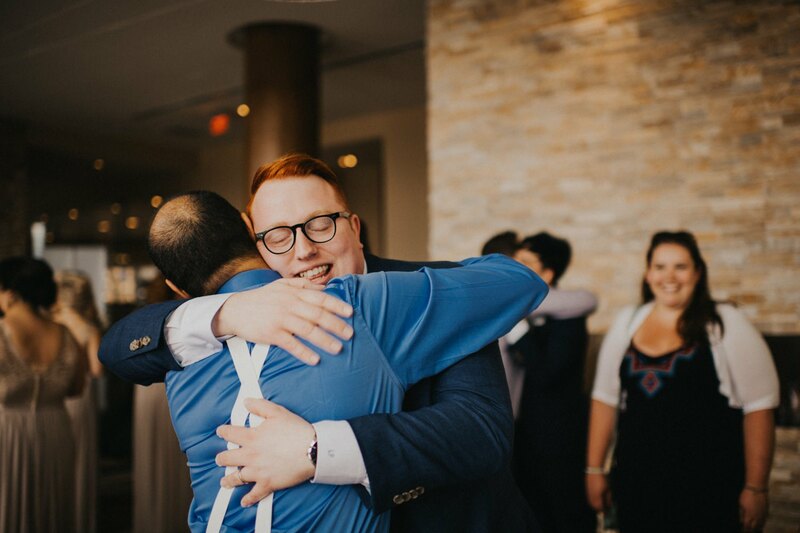 I love my job and it is as simple as that. 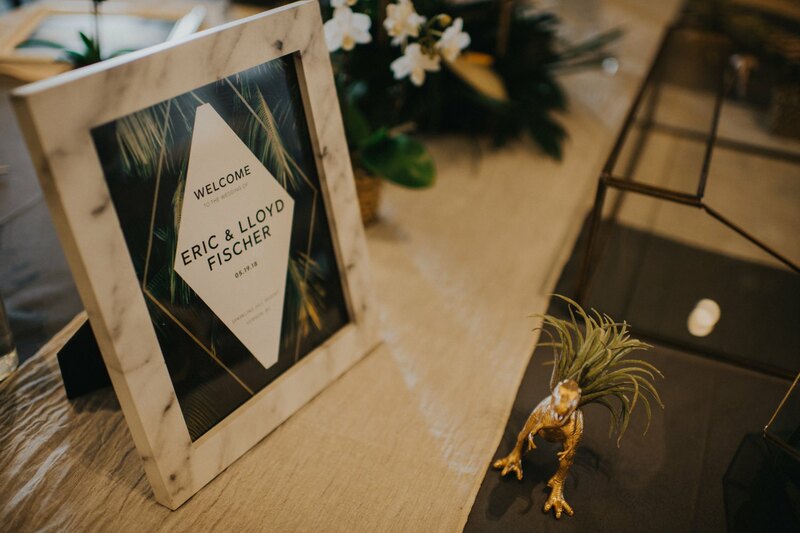 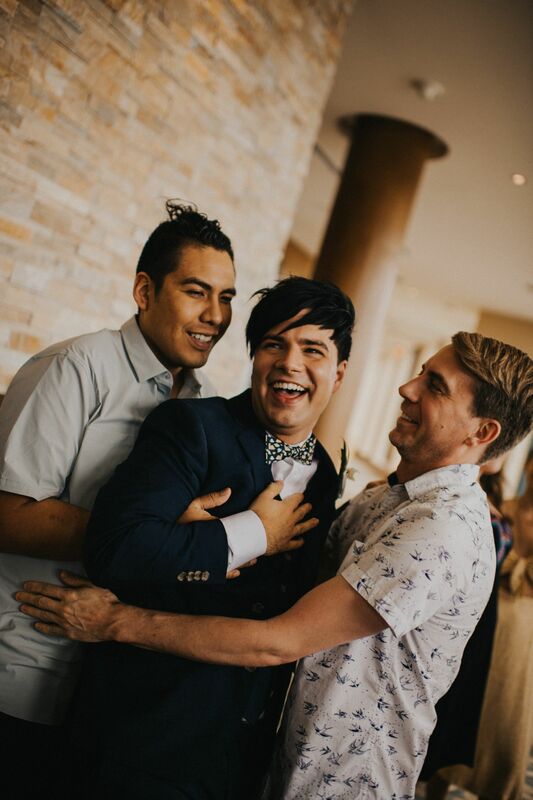 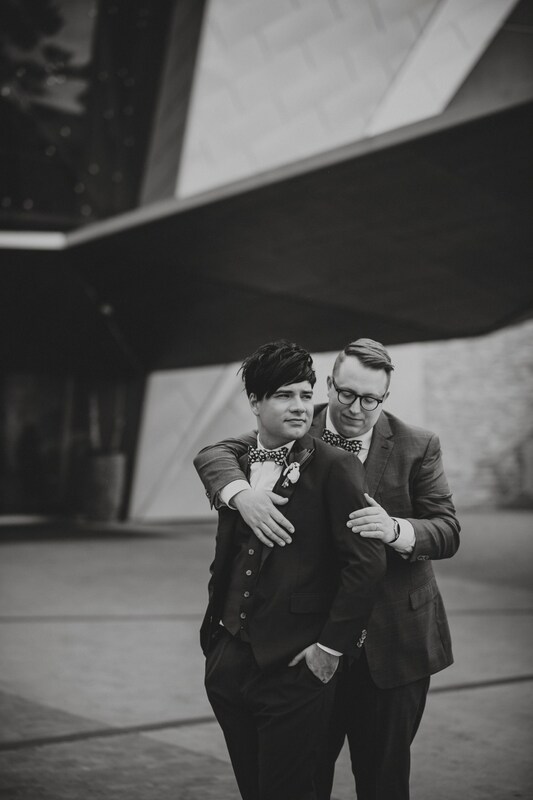 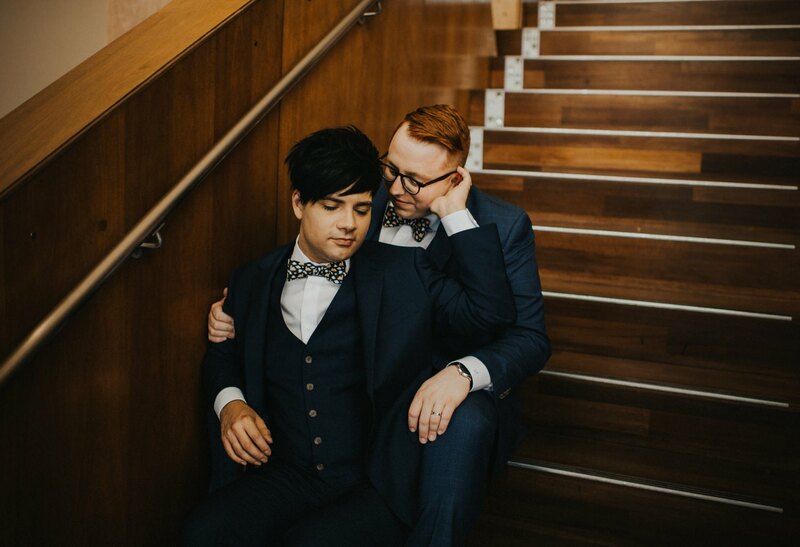 Lloyd and Eric, you two are seriously something special! 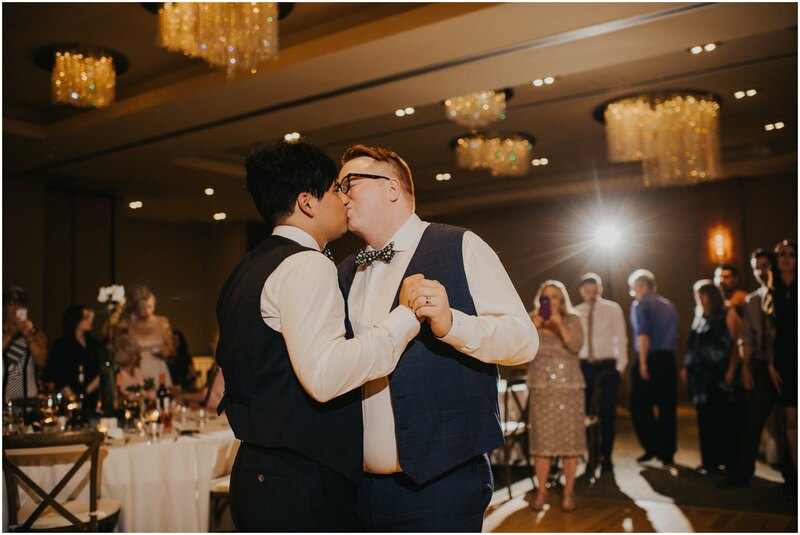 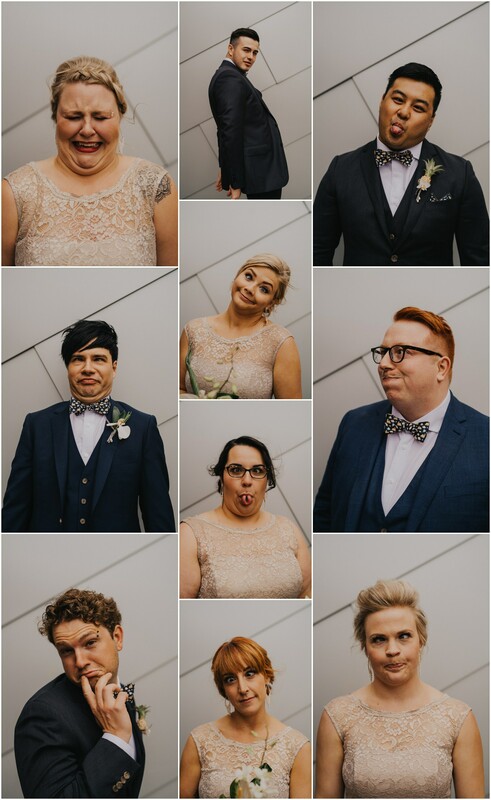 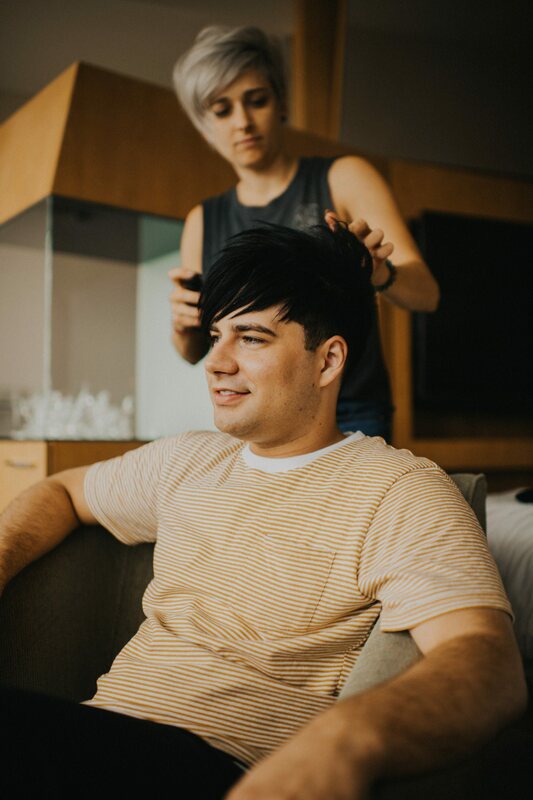 Thank you so much for choosing me to capture this special day!